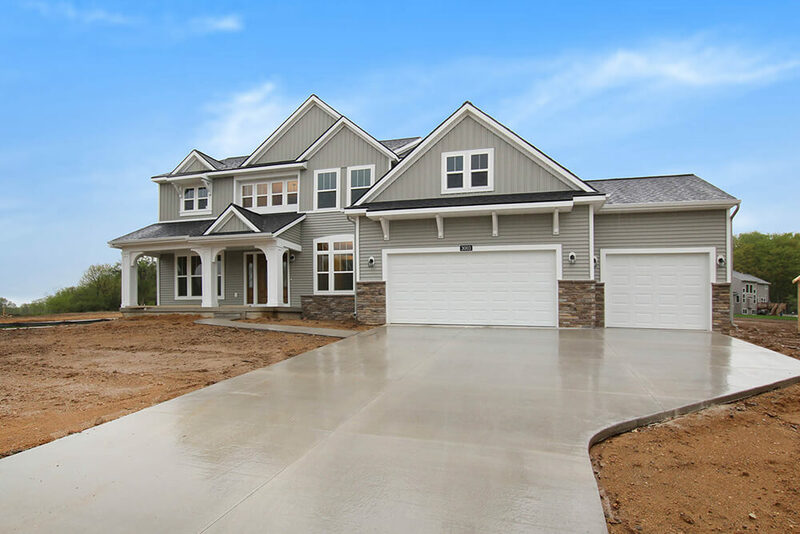 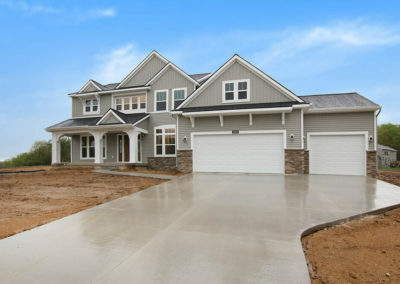 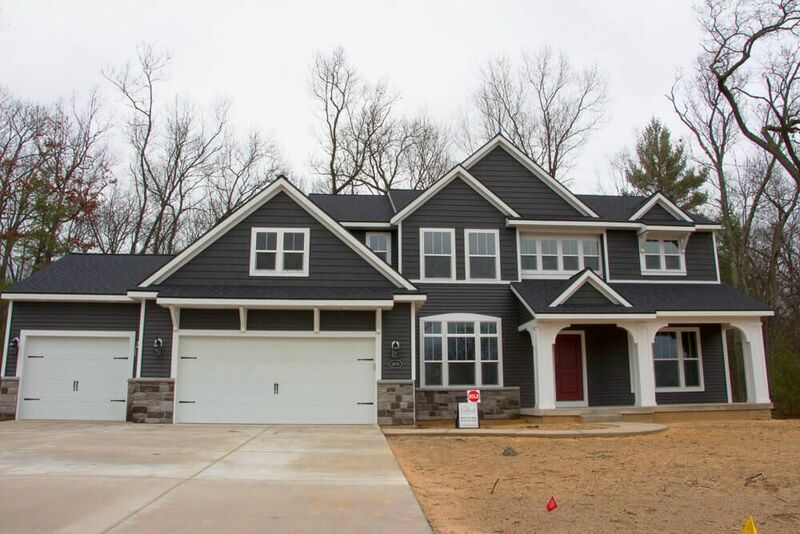 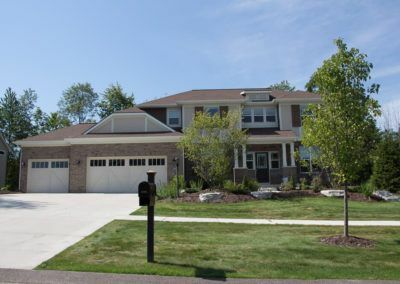 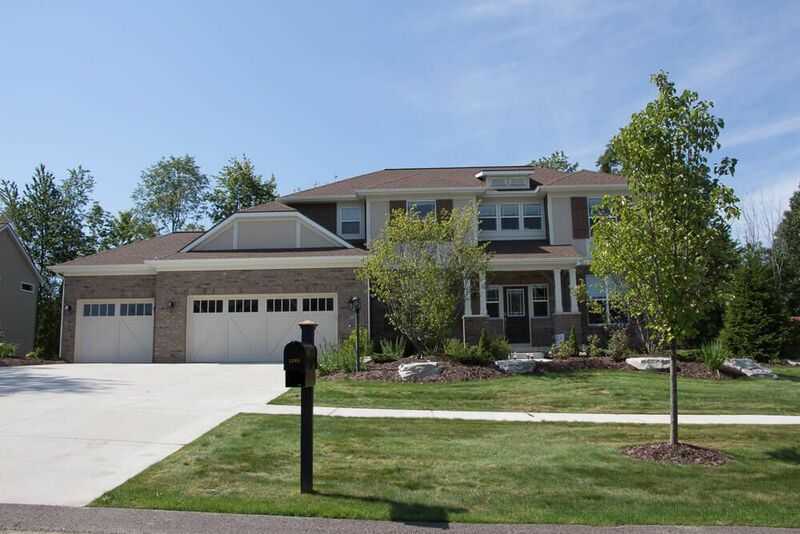 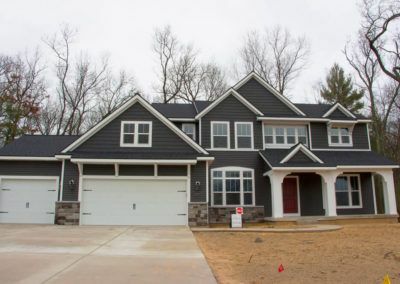 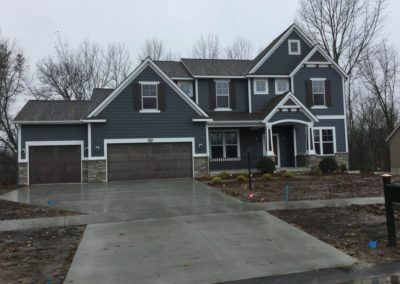 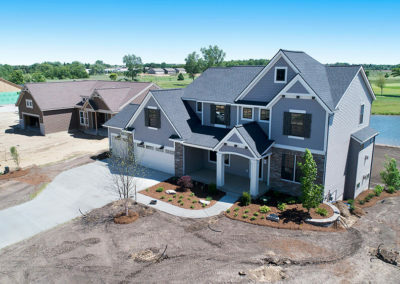 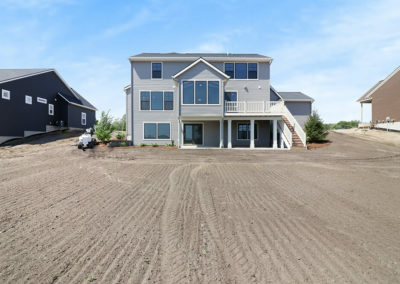 The Crestview home plan is an elegant, modern, two story home design. 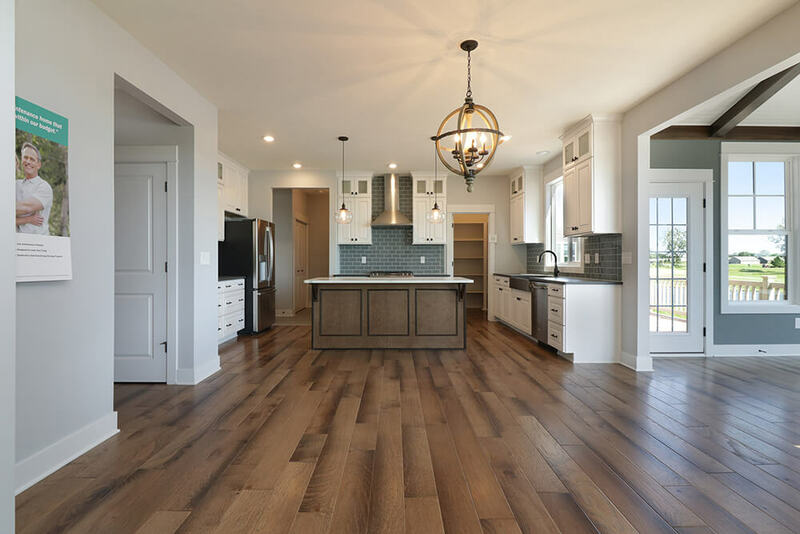 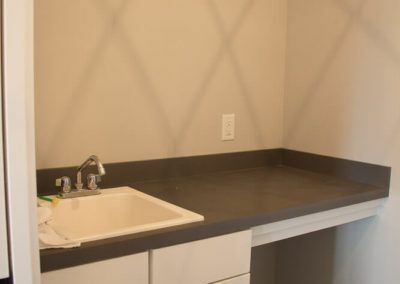 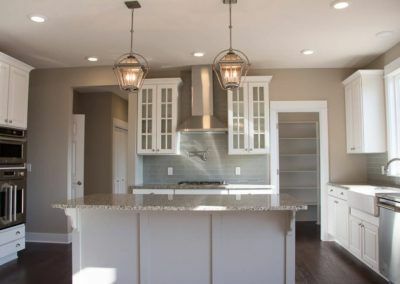 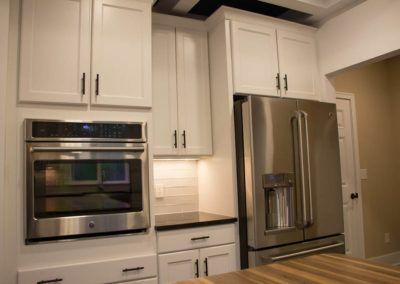 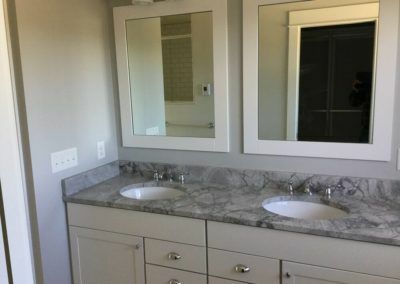 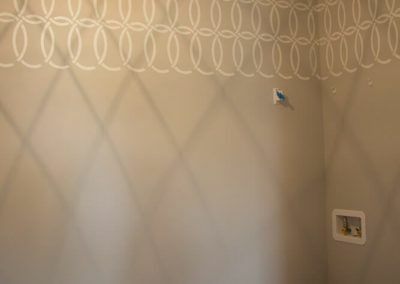 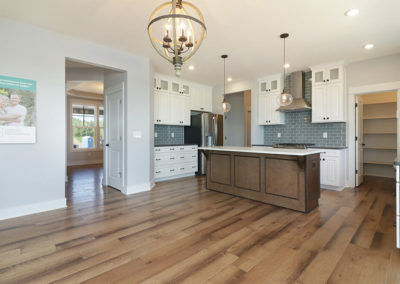 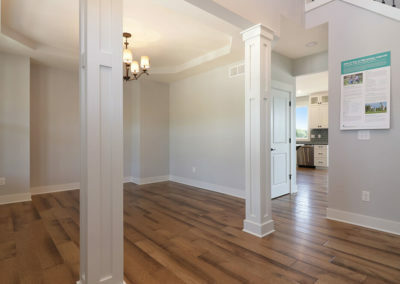 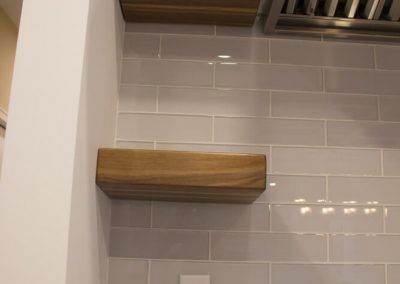 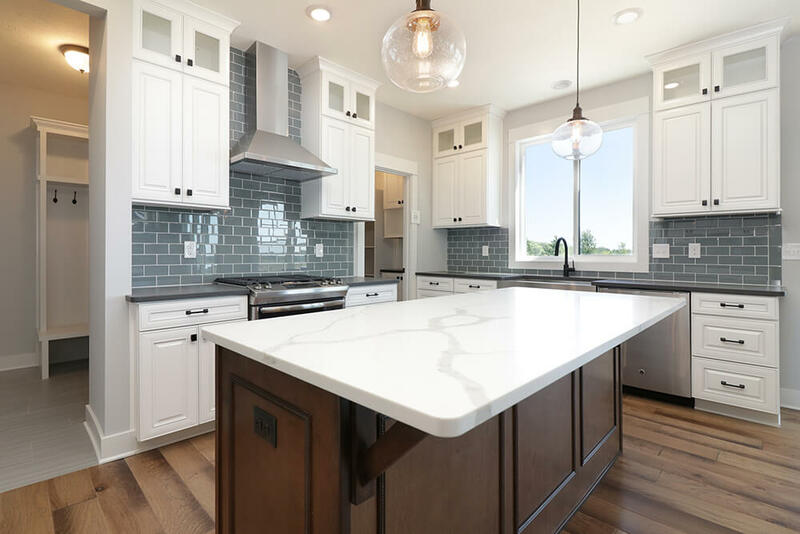 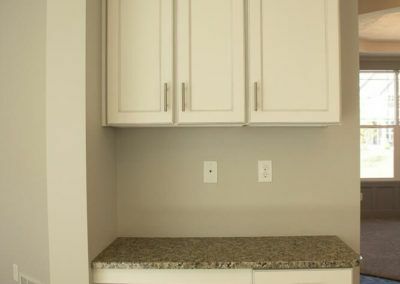 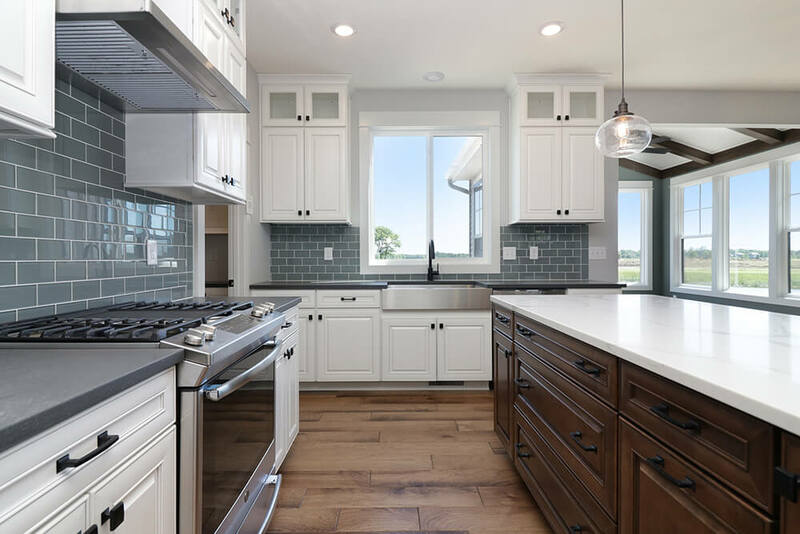 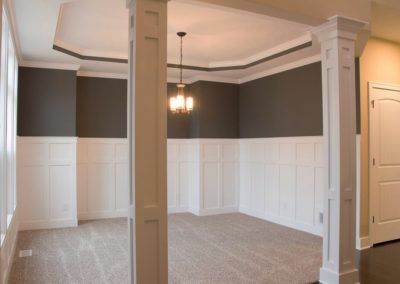 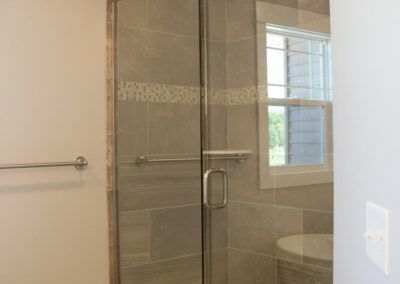 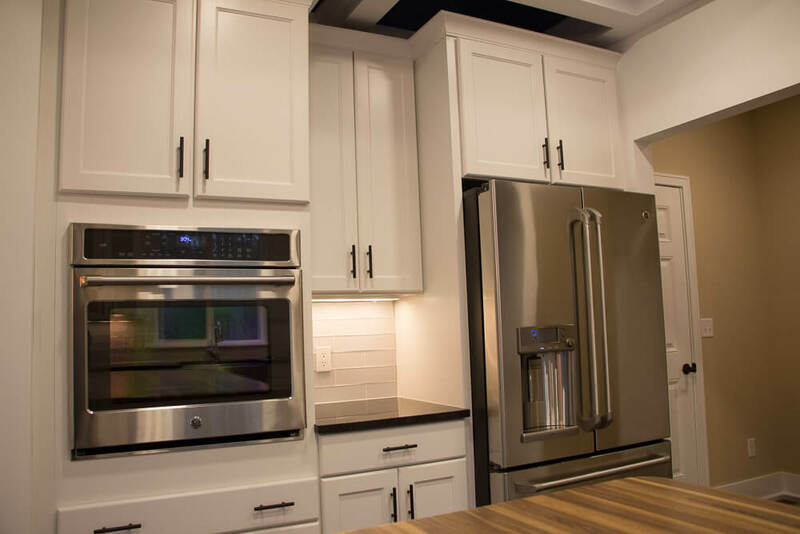 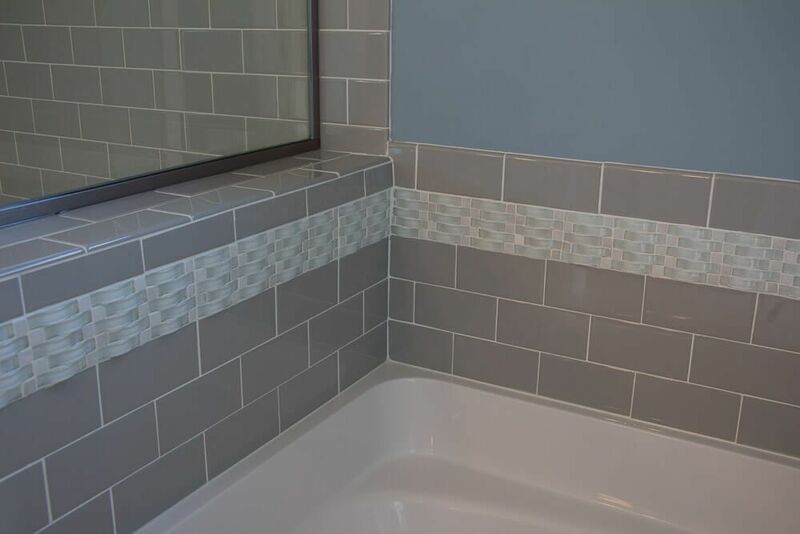 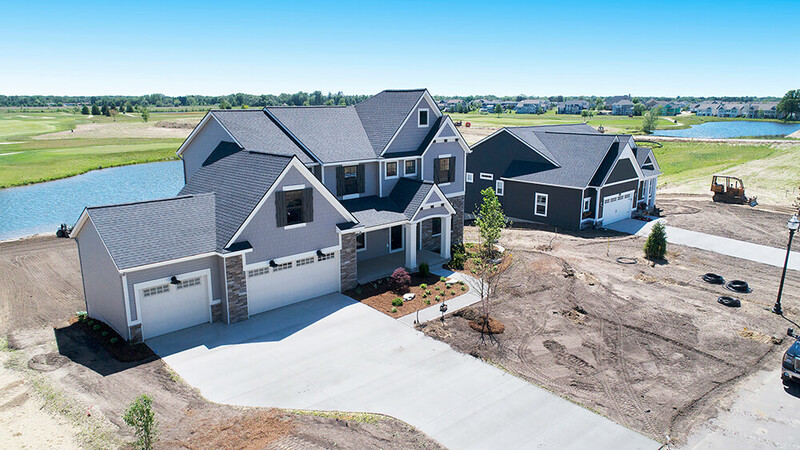 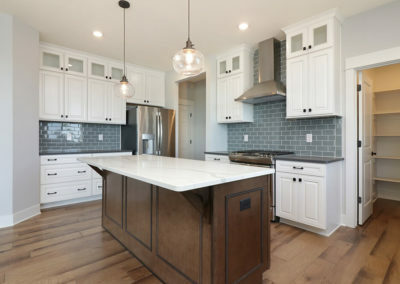 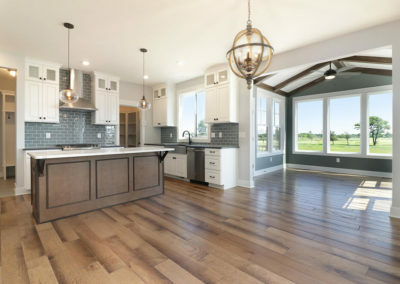 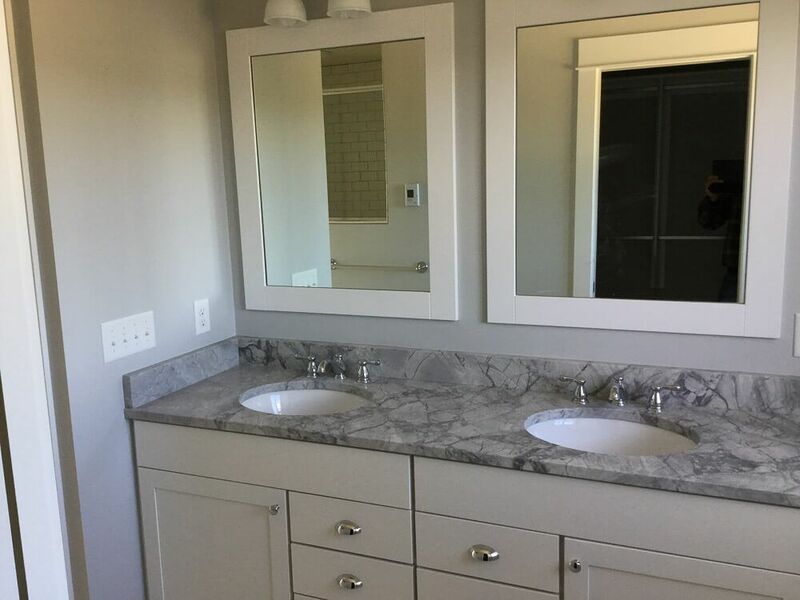 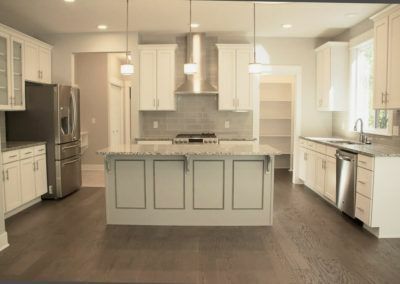 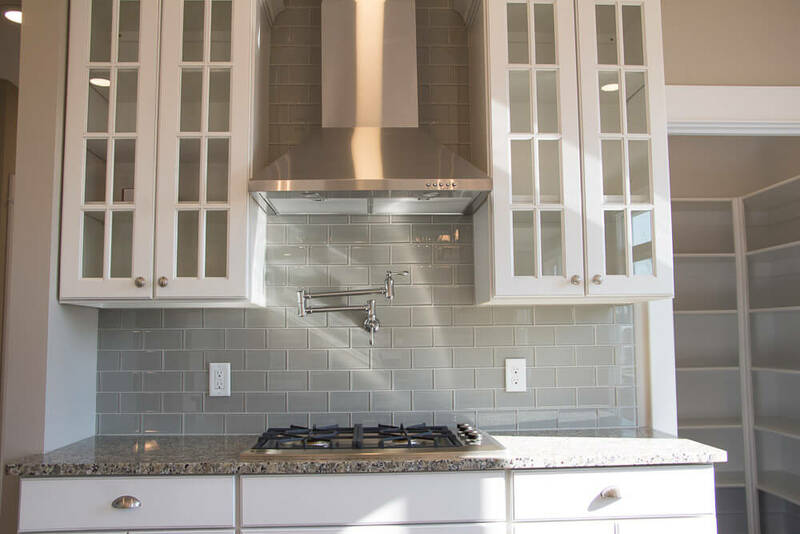 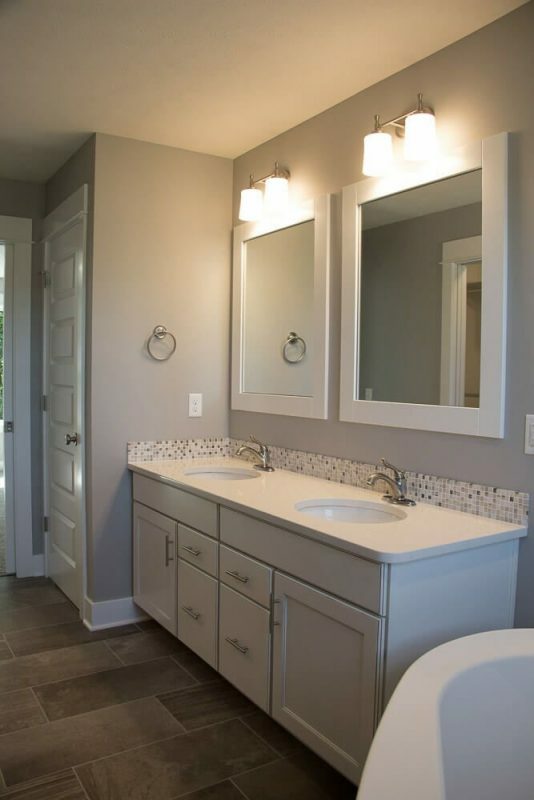 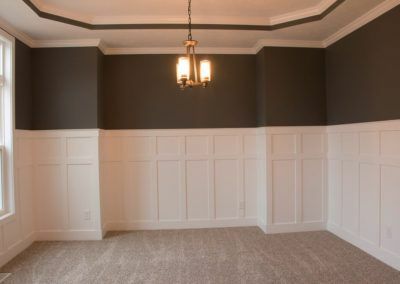 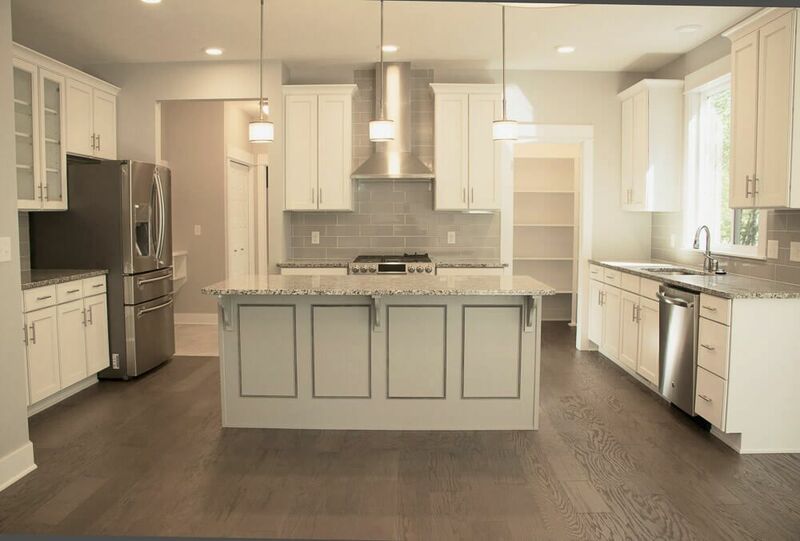 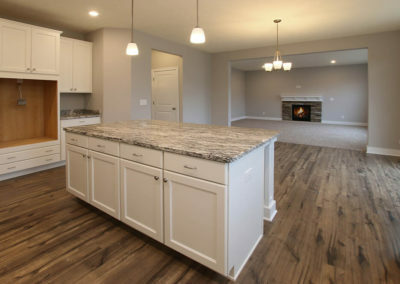 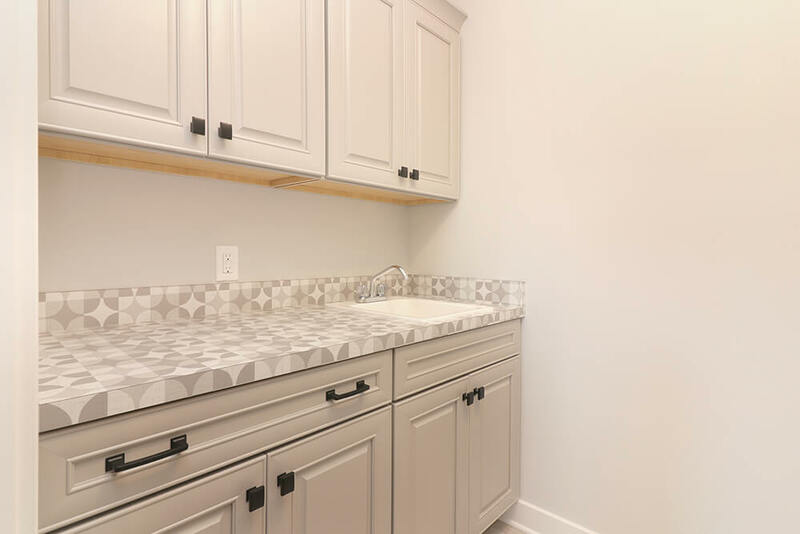 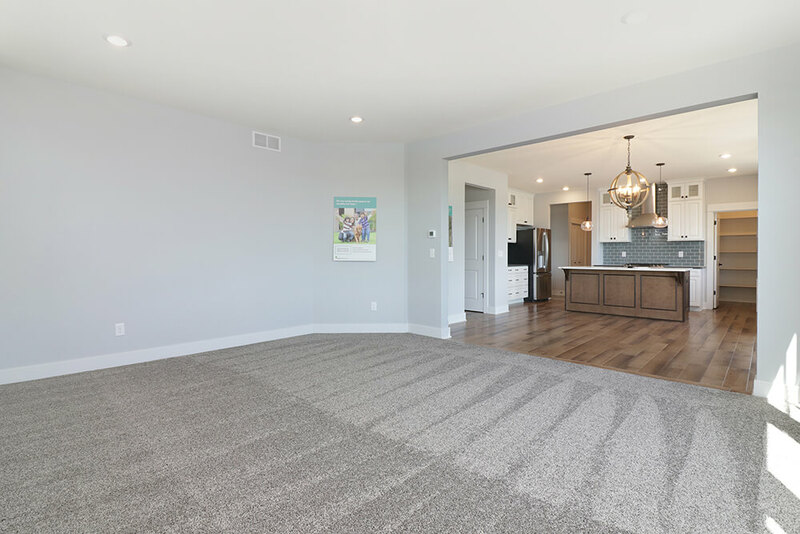 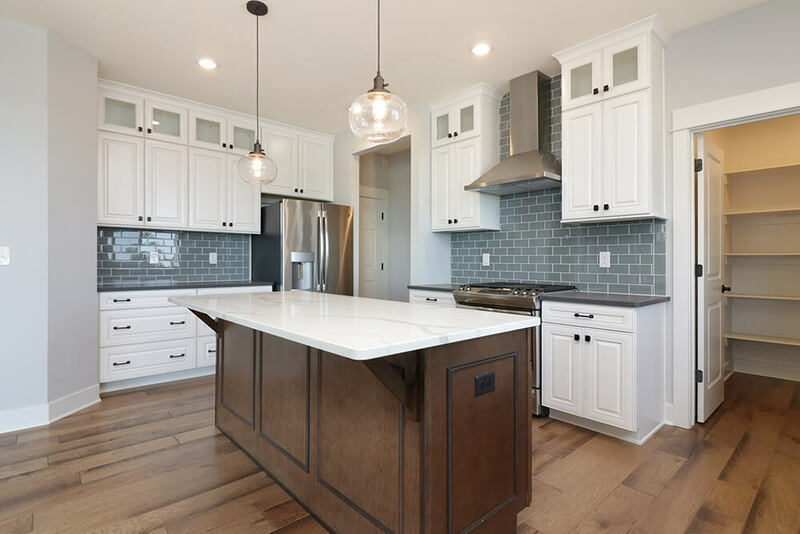 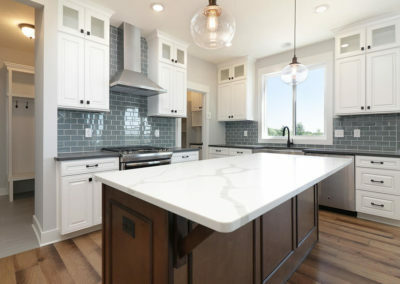 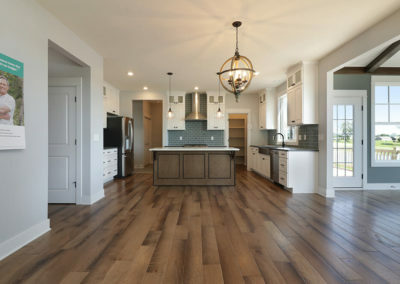 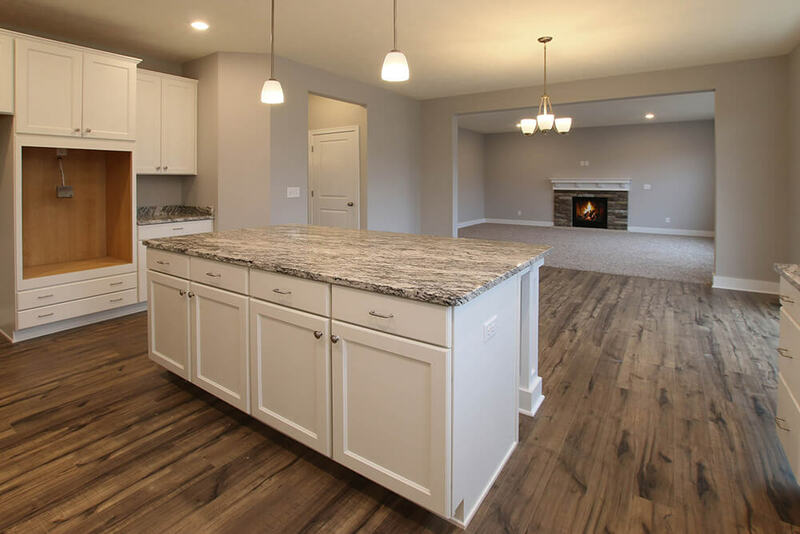 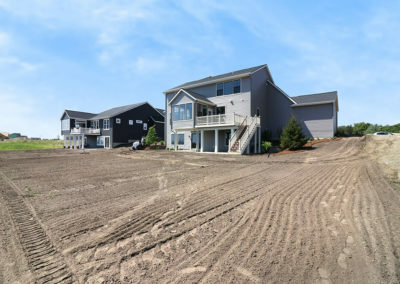 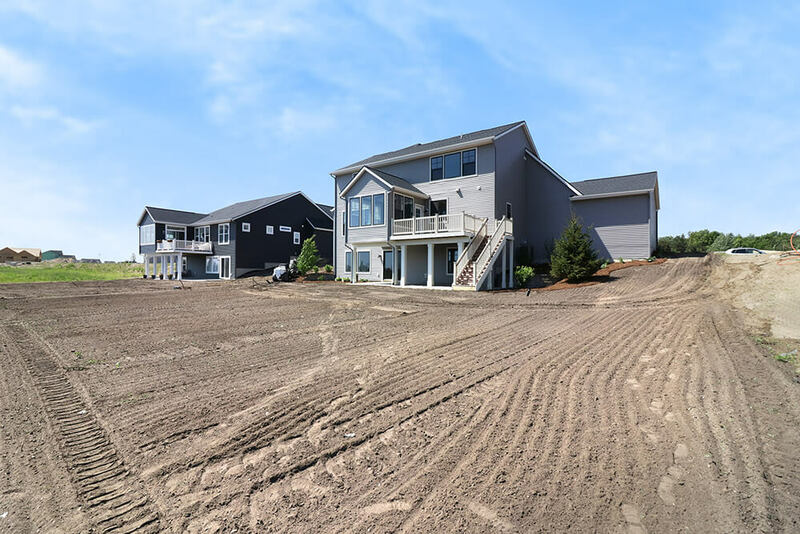 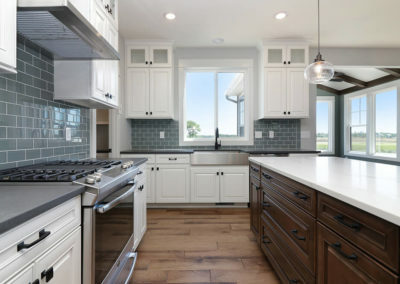 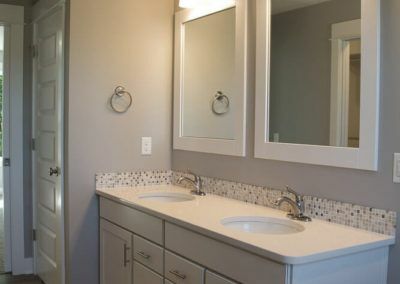 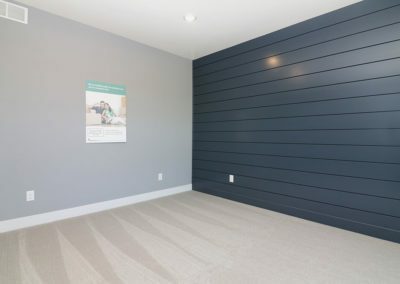 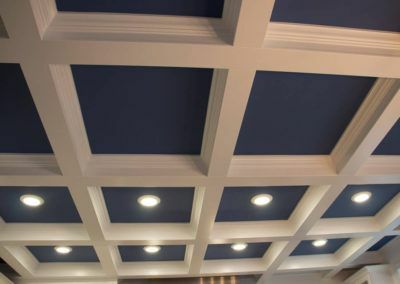 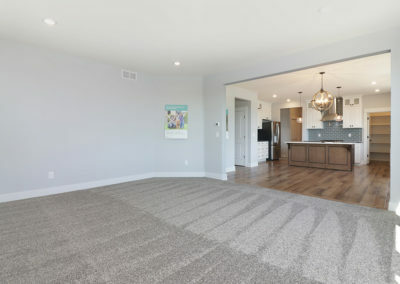 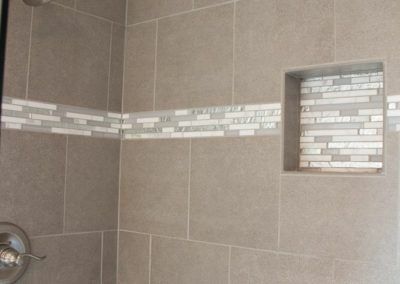 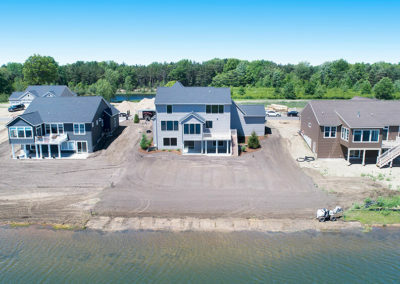 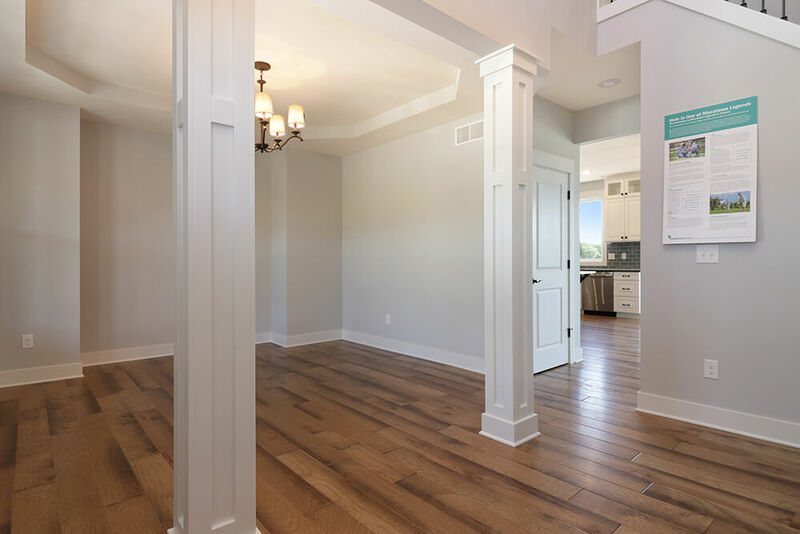 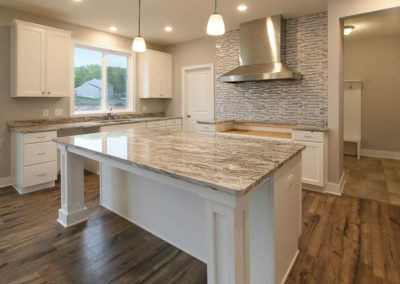 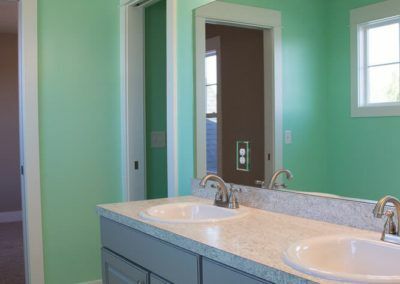 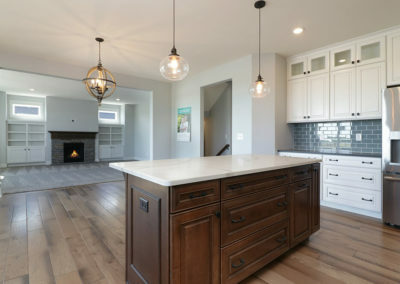 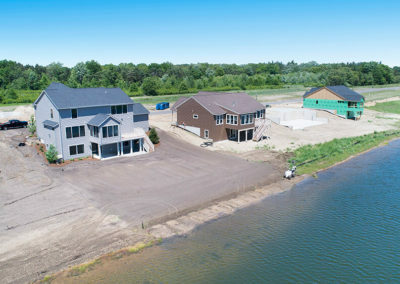 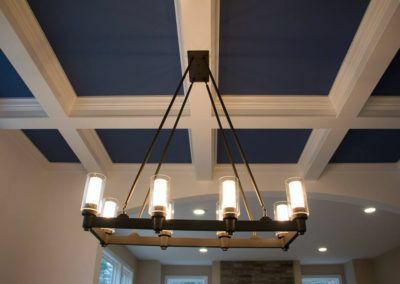 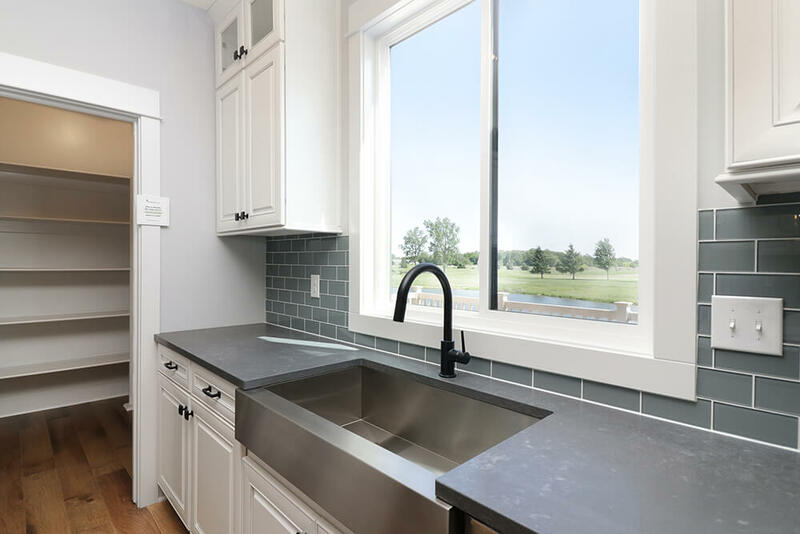 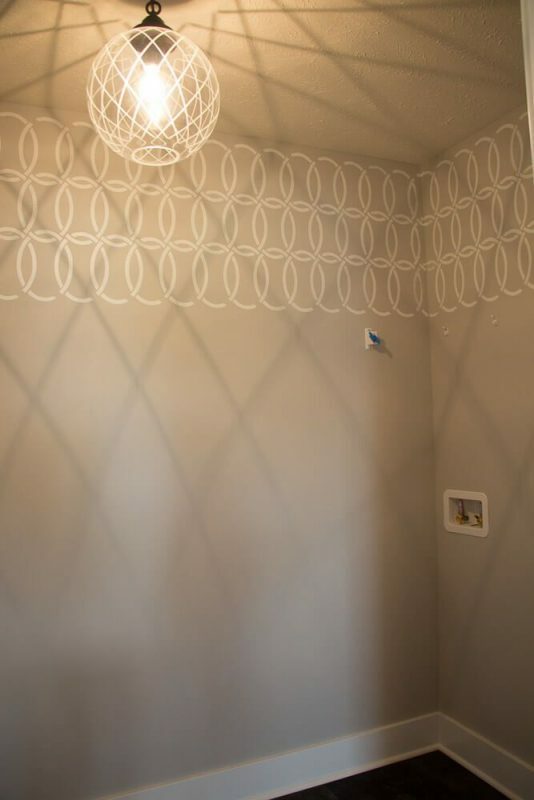 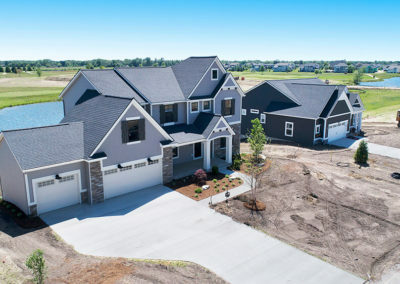 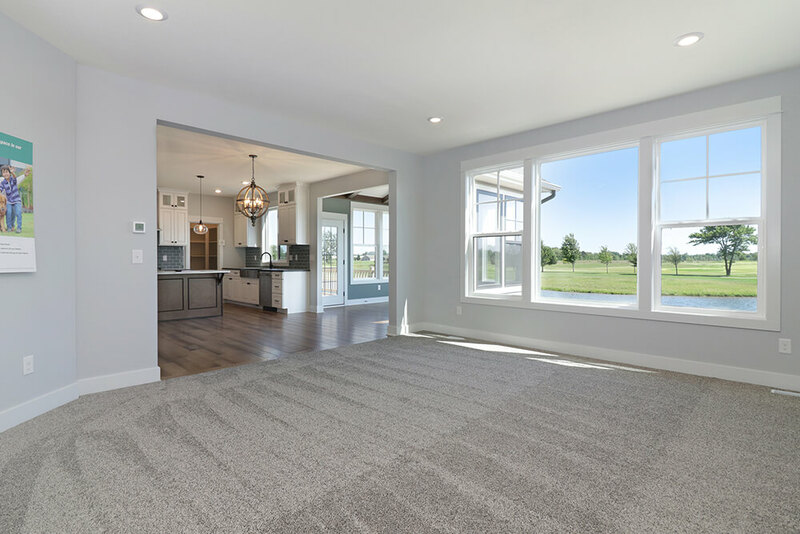 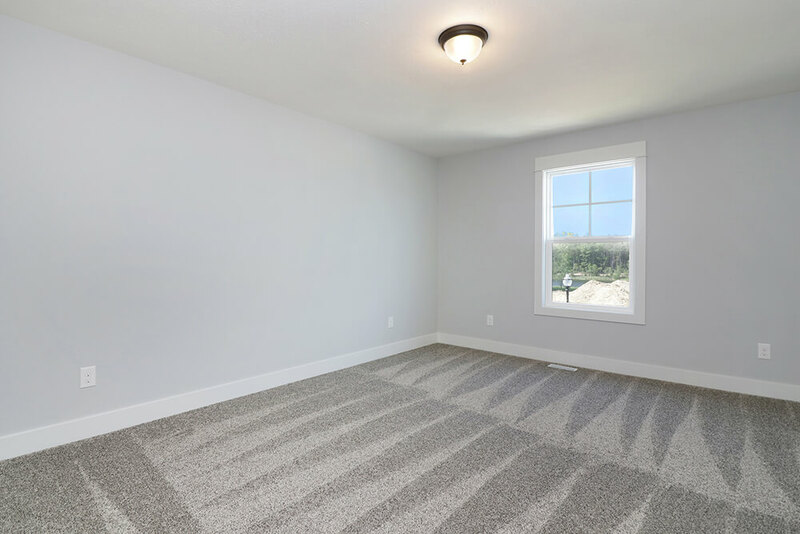 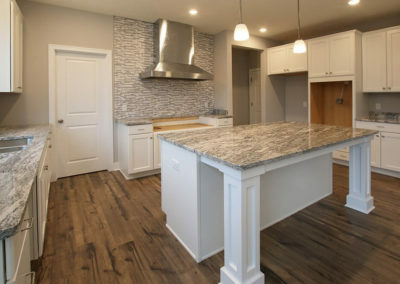 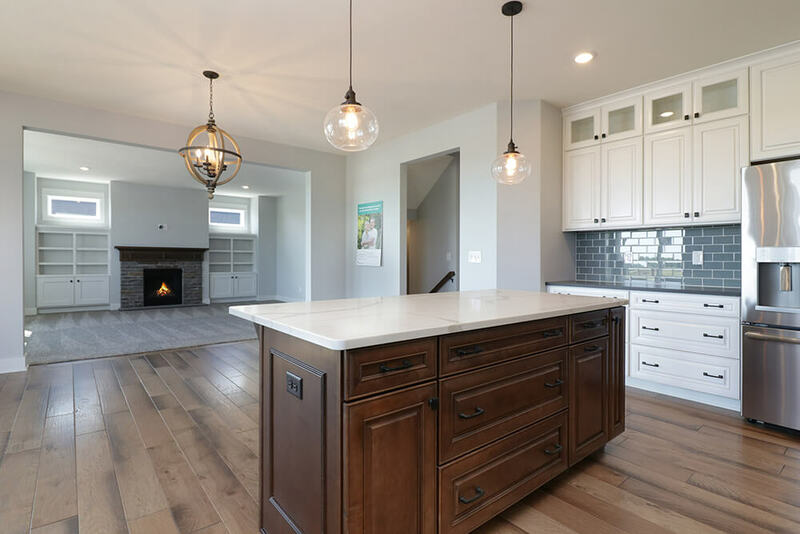 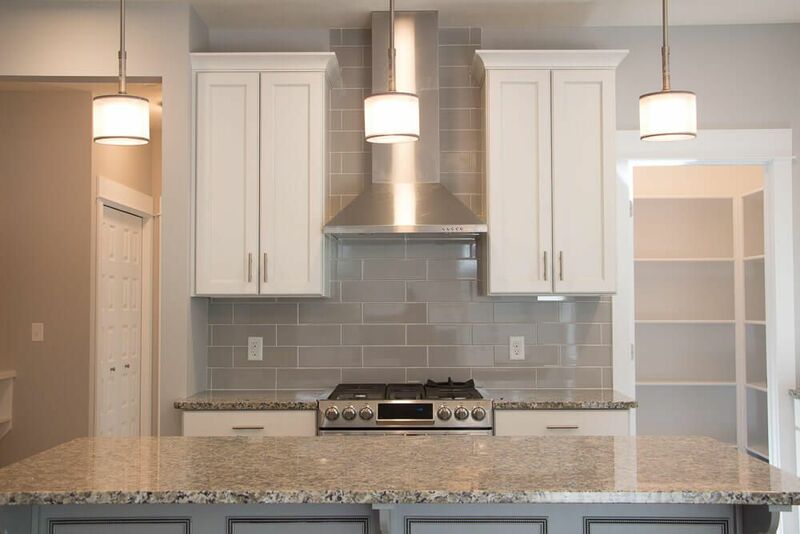 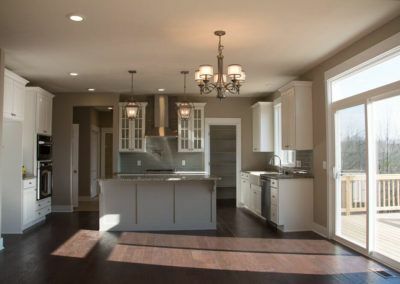 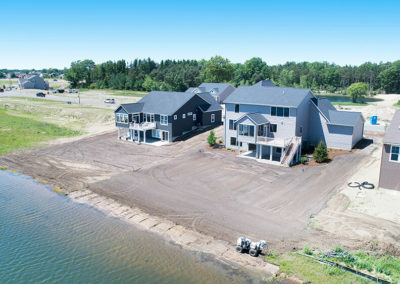 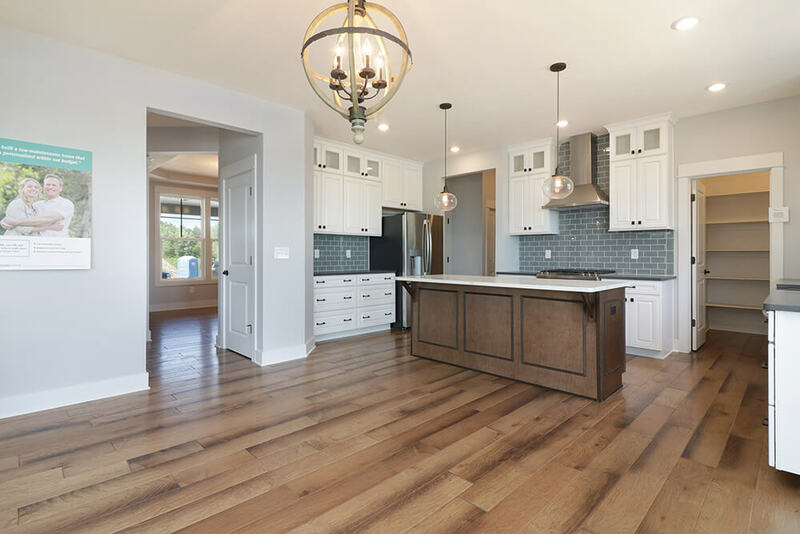 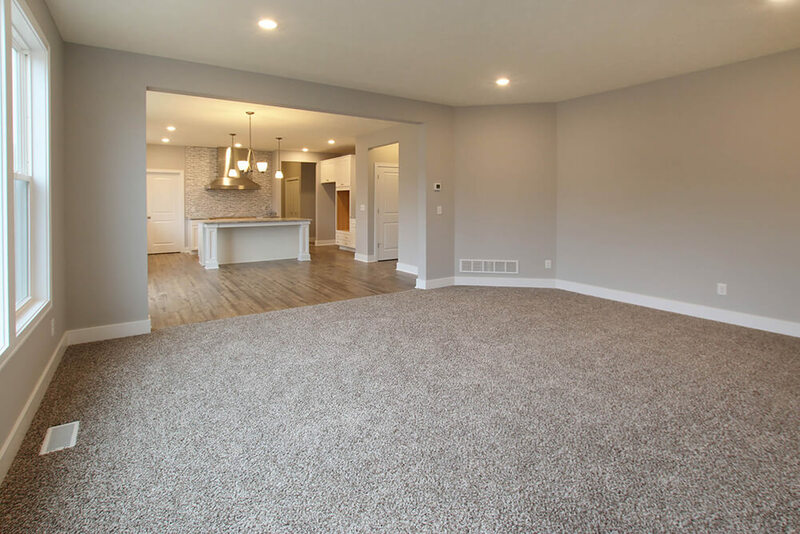 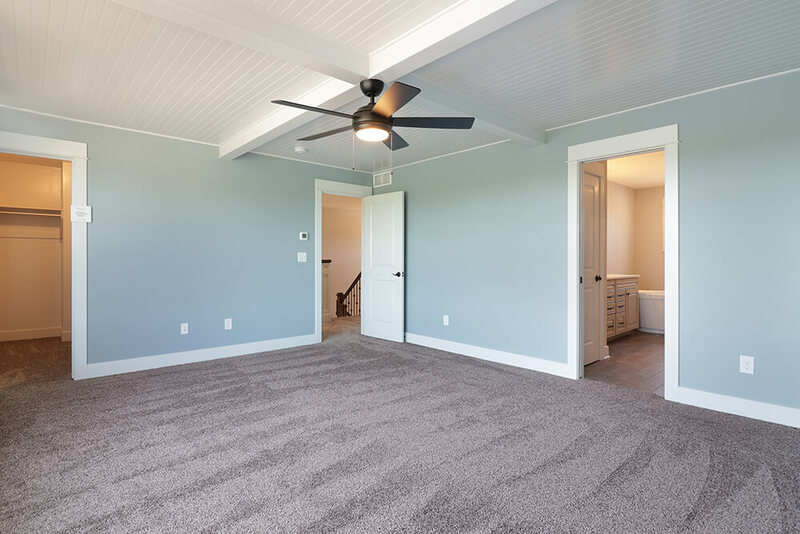 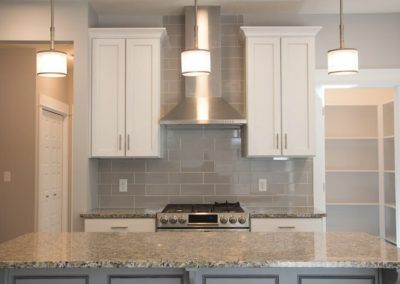 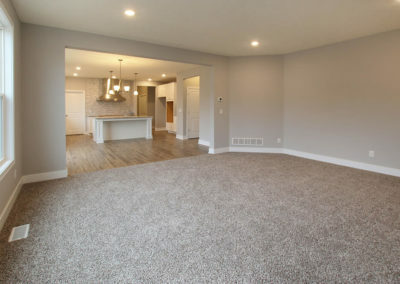 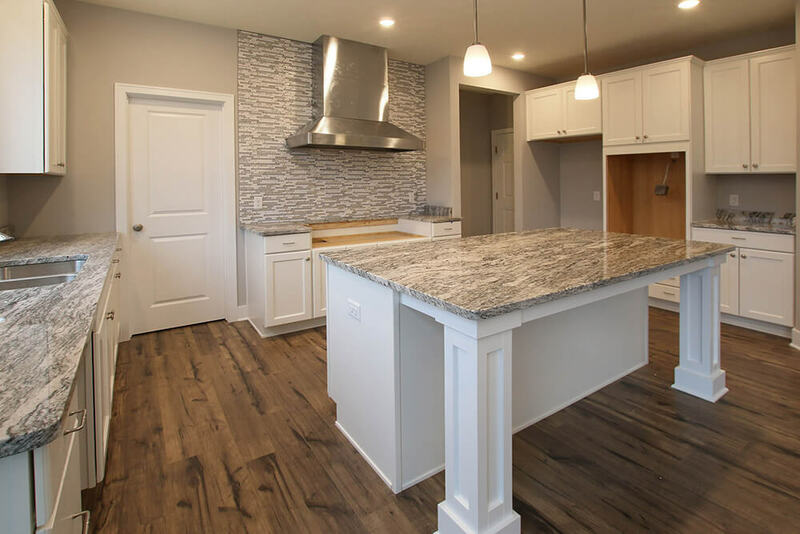 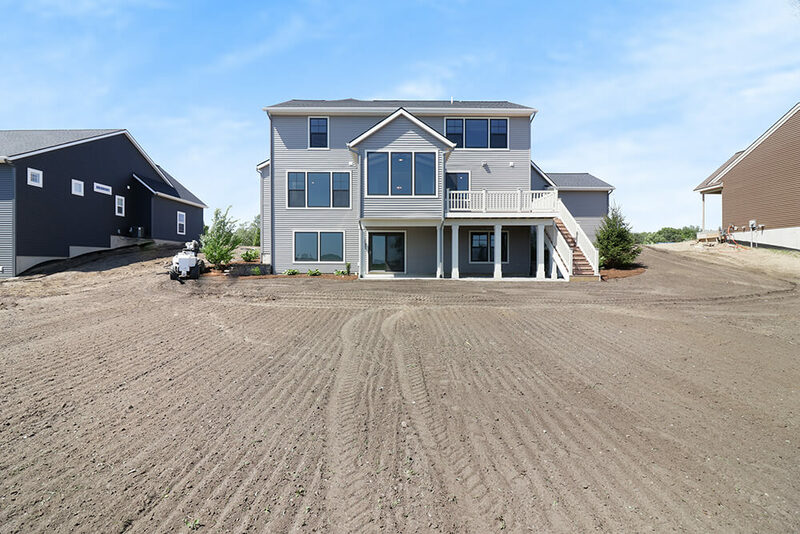 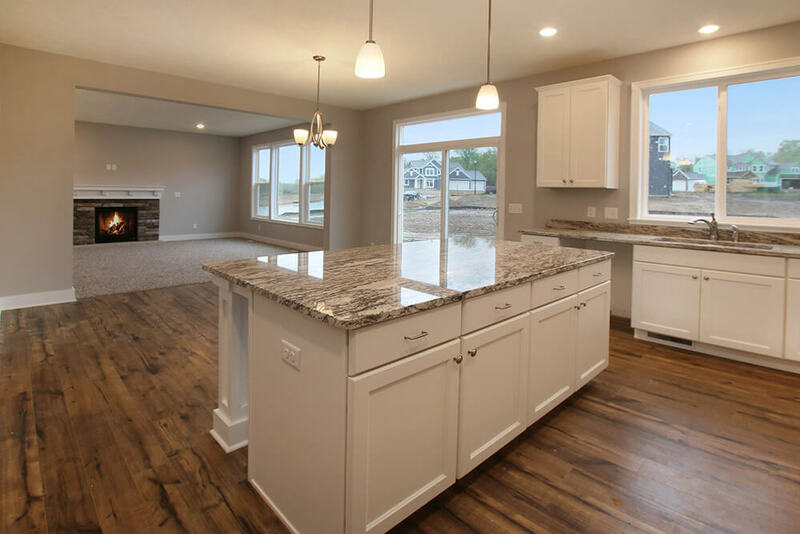 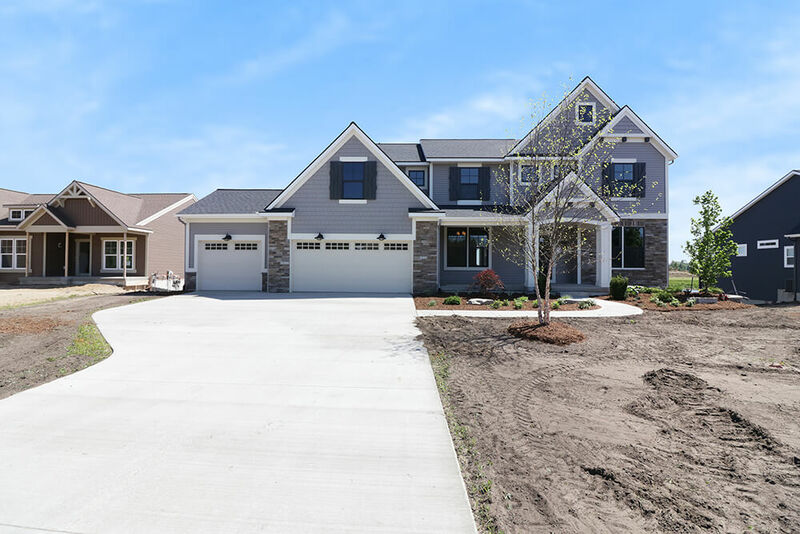 The plan offers four bedrooms, two and a half baths, and 2528 square feet of finished living space with the option to add even more space and an array of personalized touches. 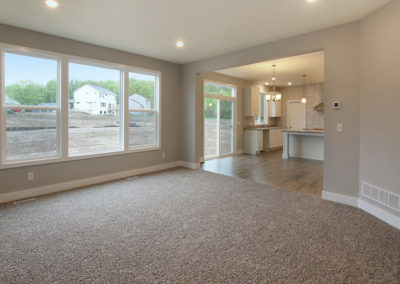 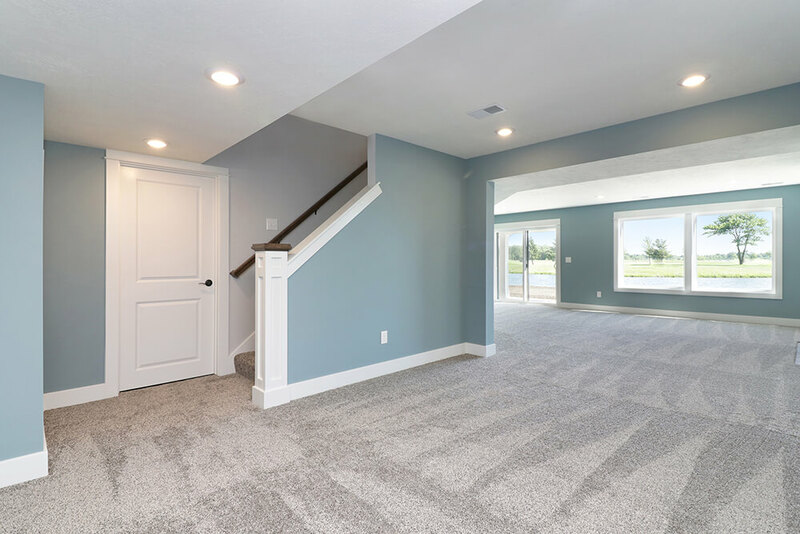 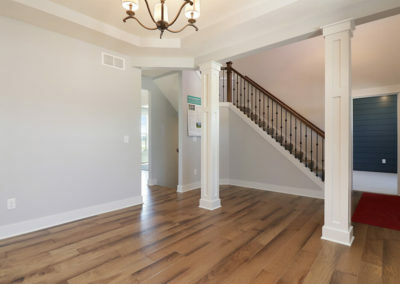 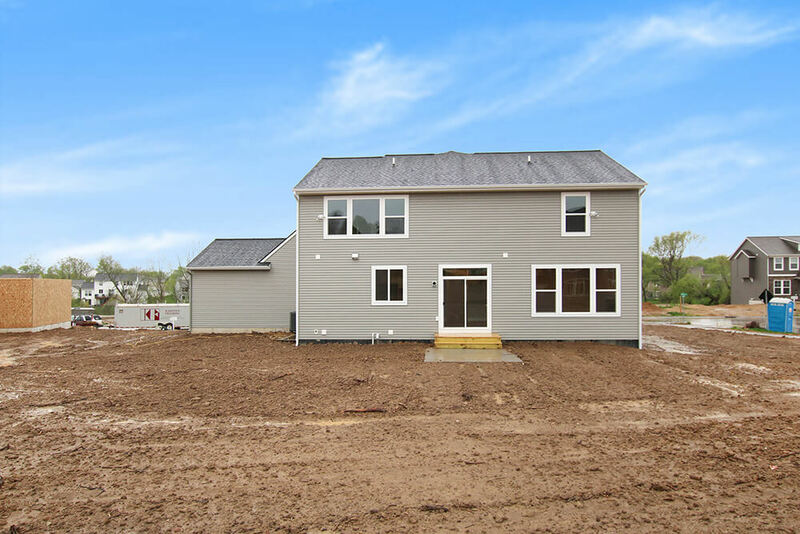 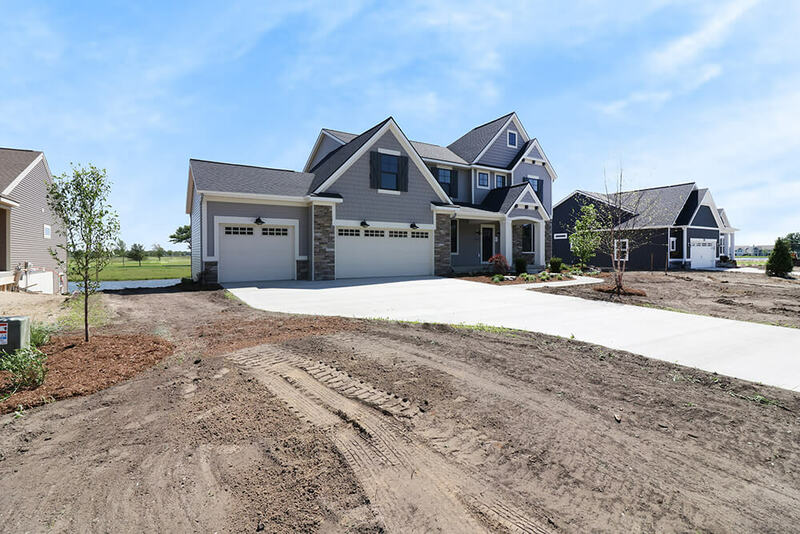 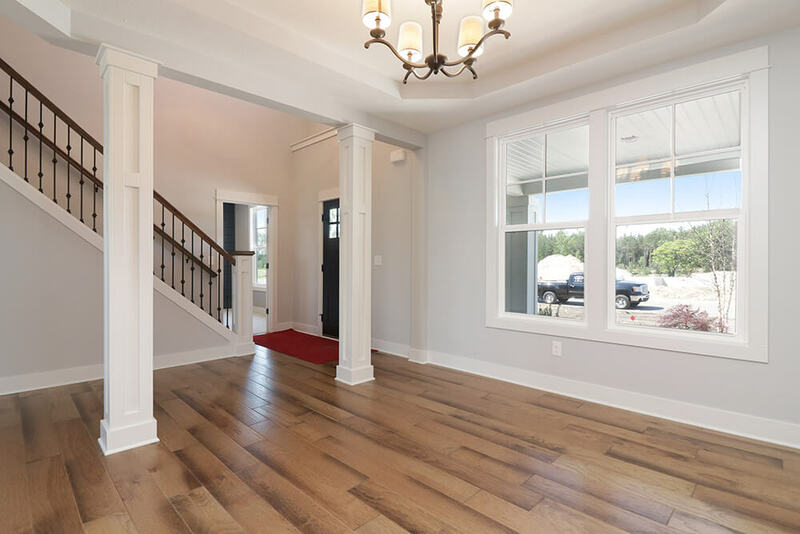 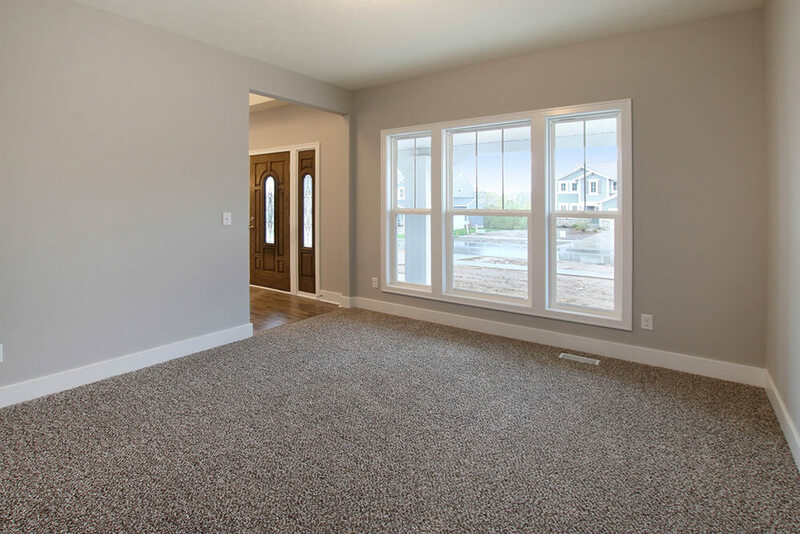 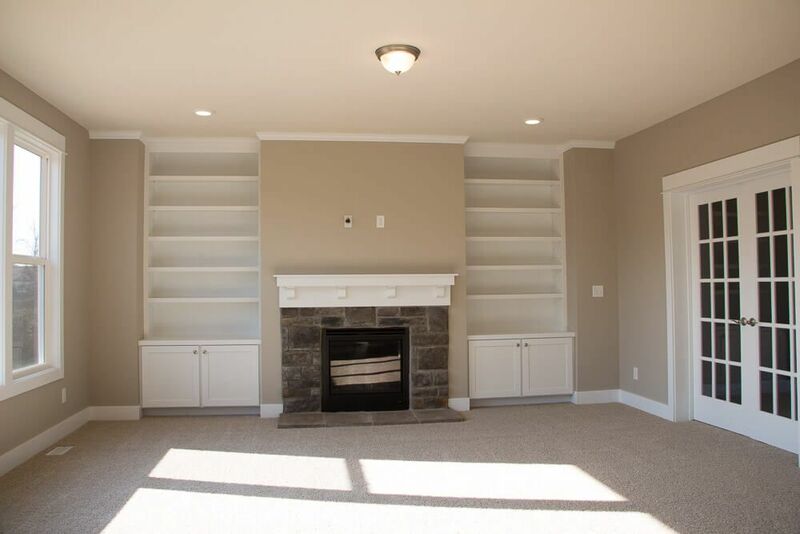 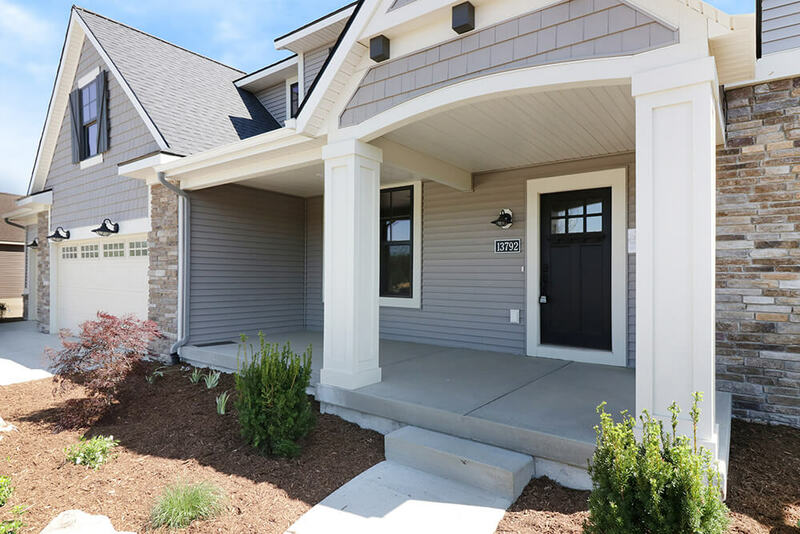 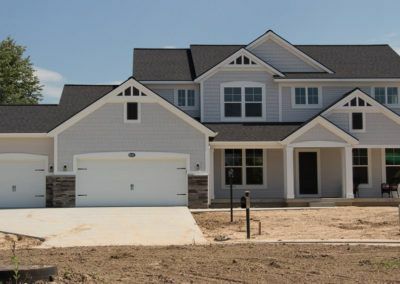 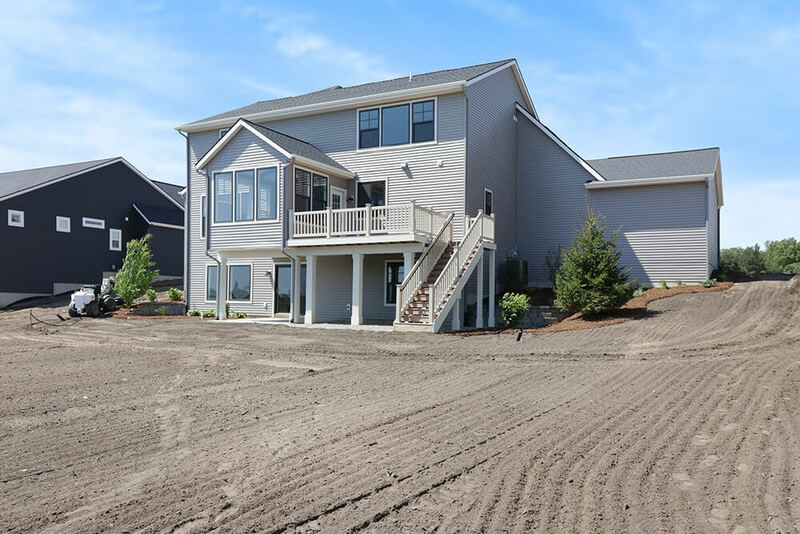 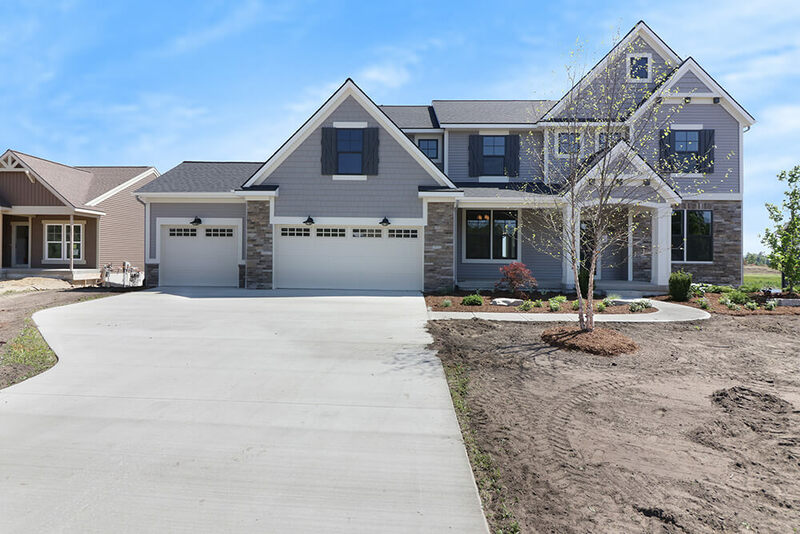 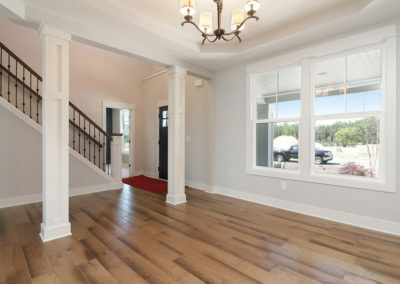 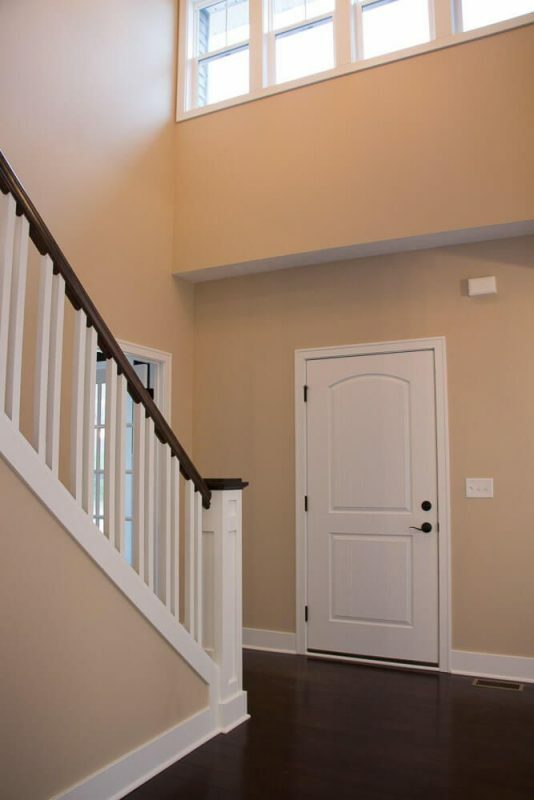 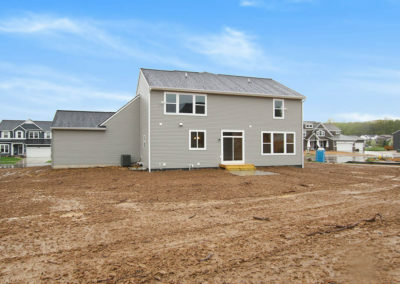 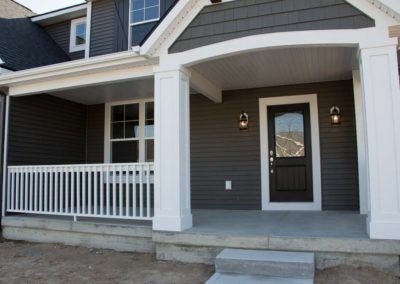 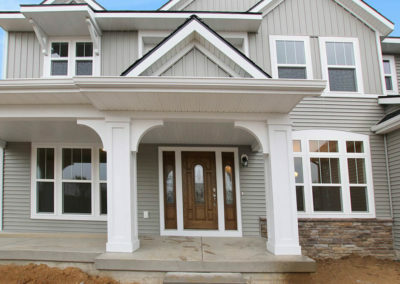 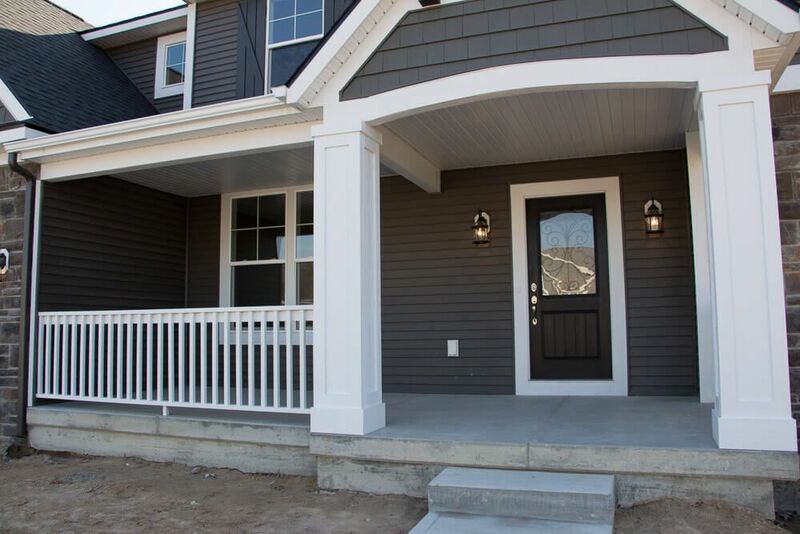 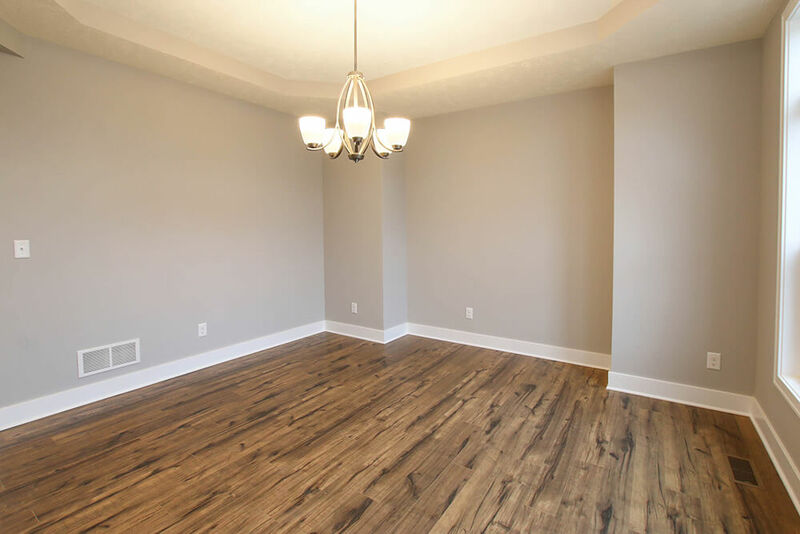 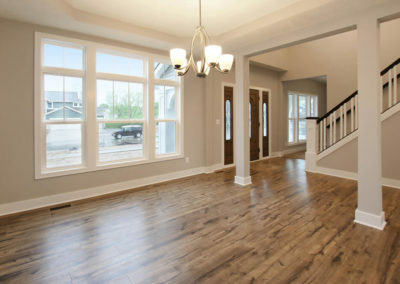 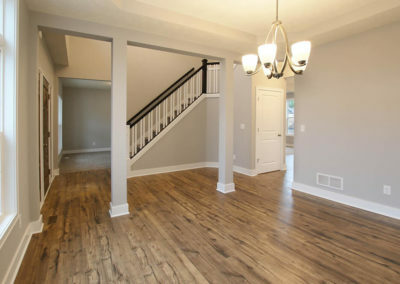 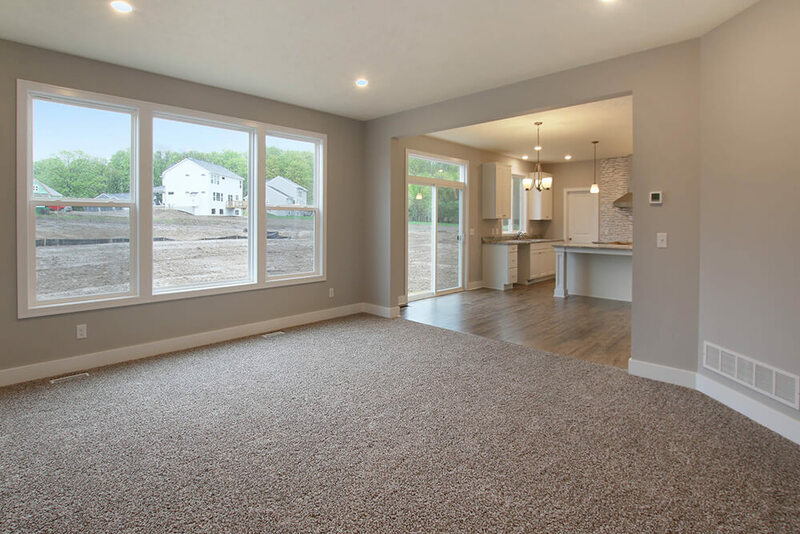 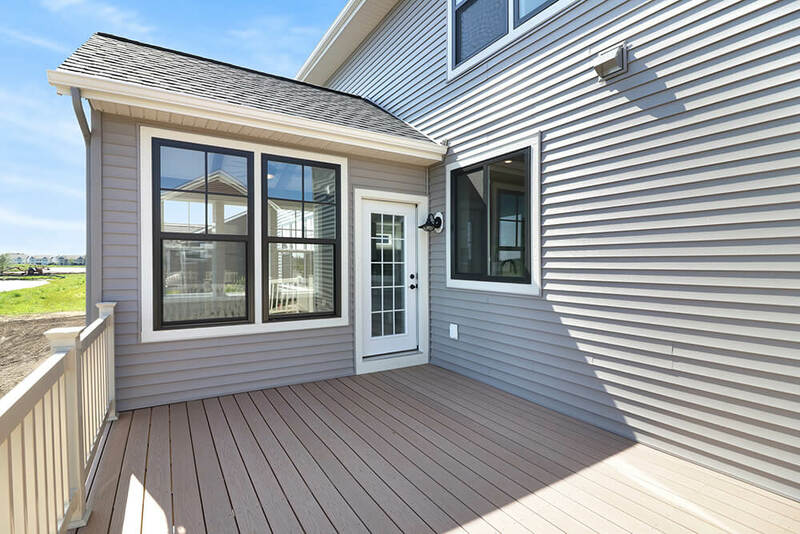 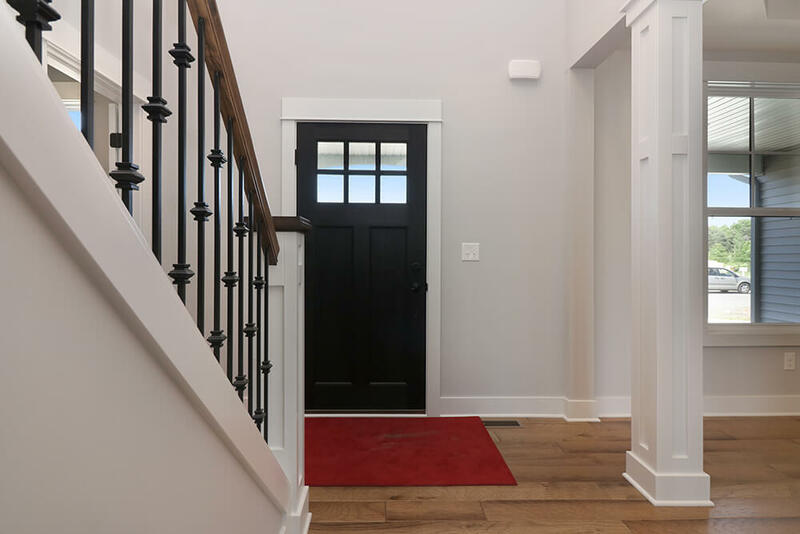 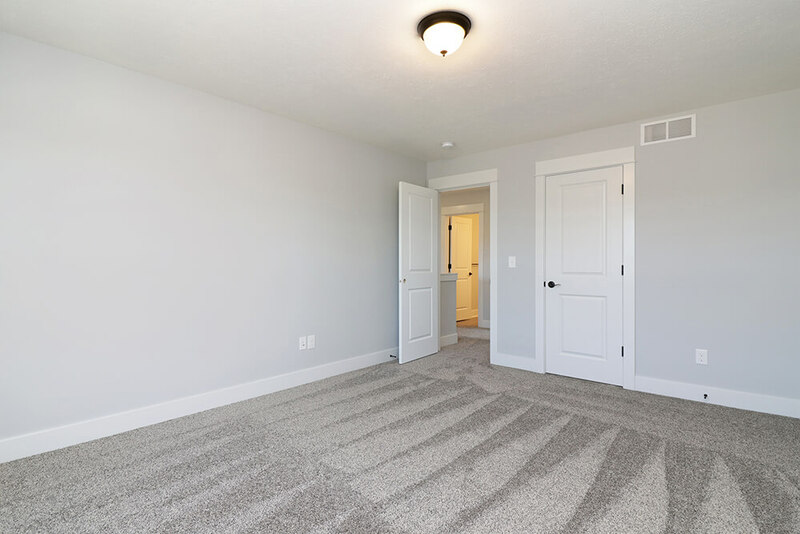 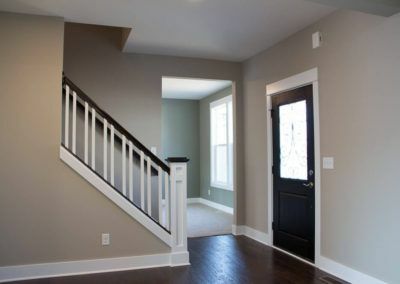 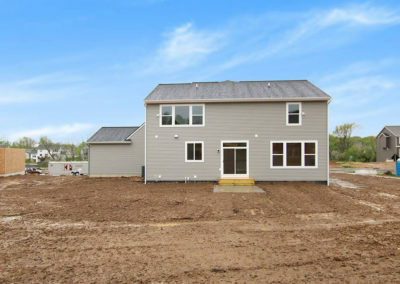 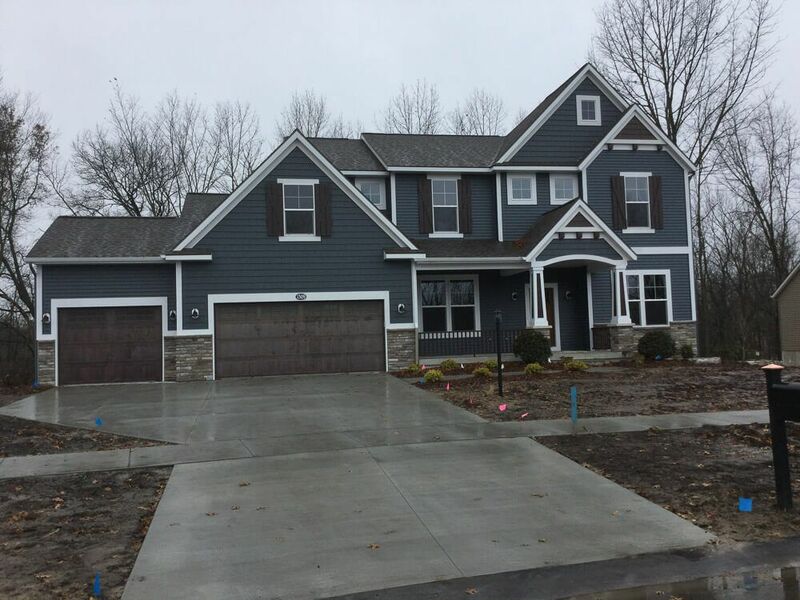 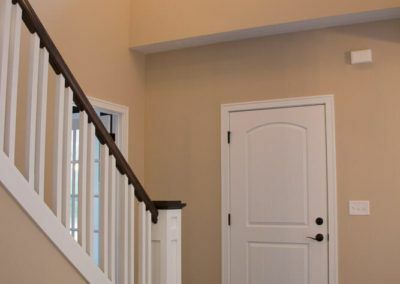 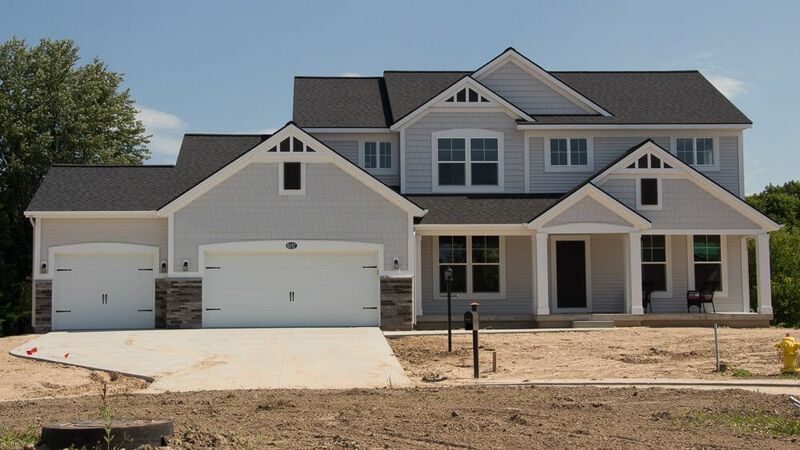 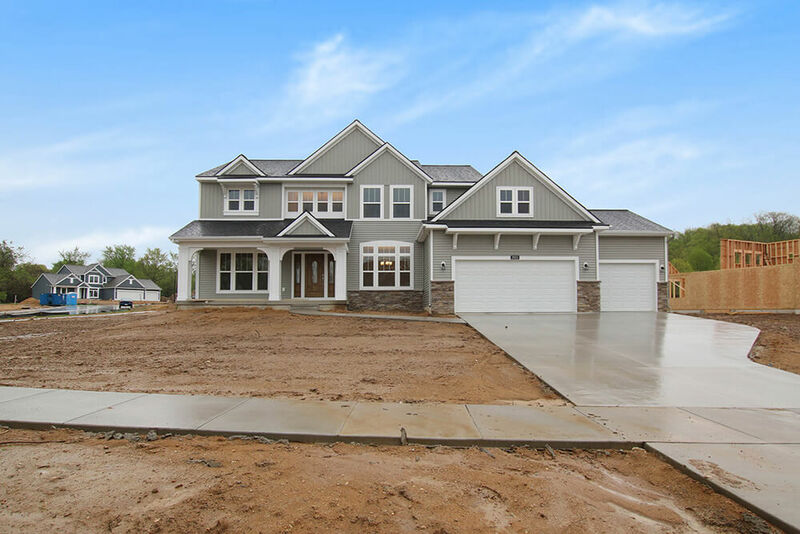 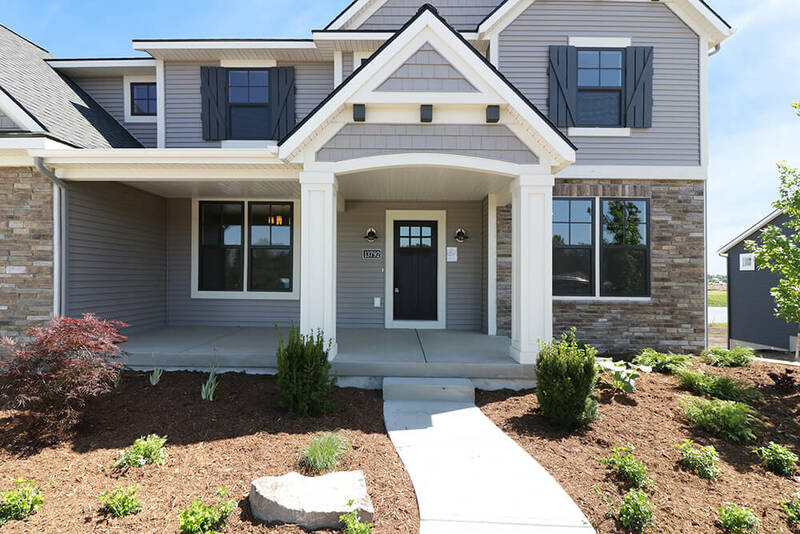 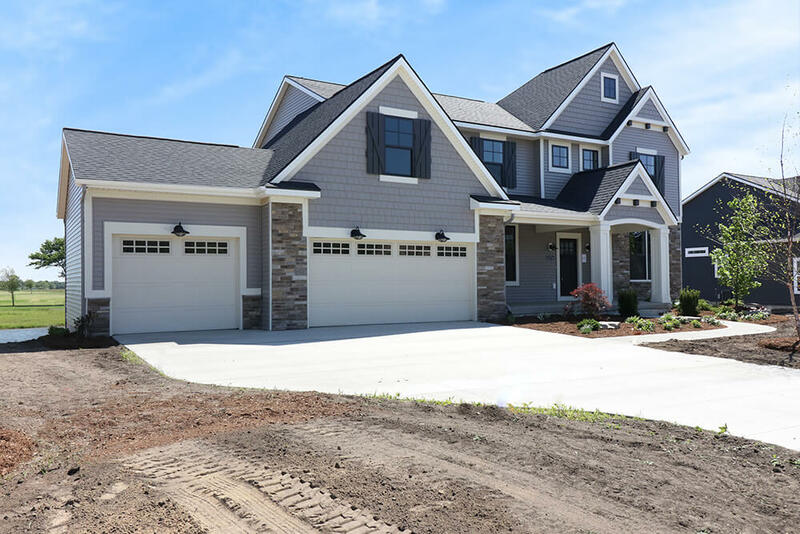 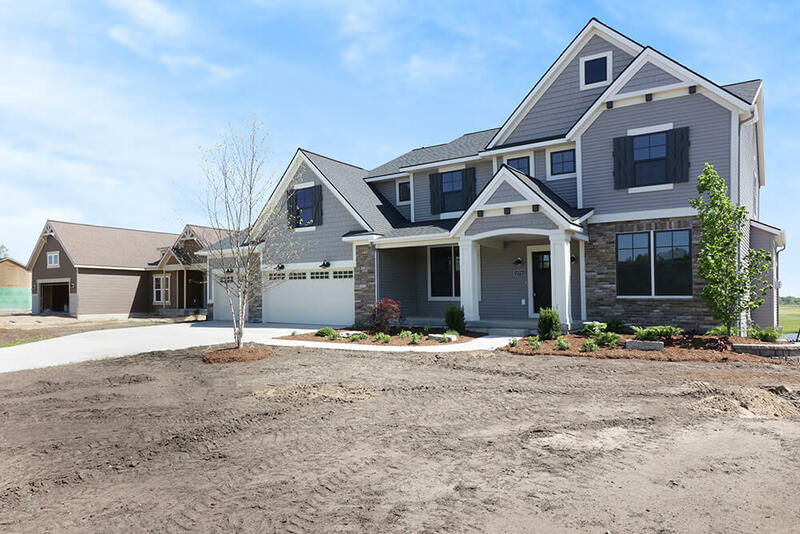 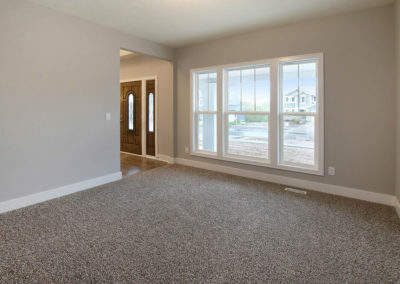 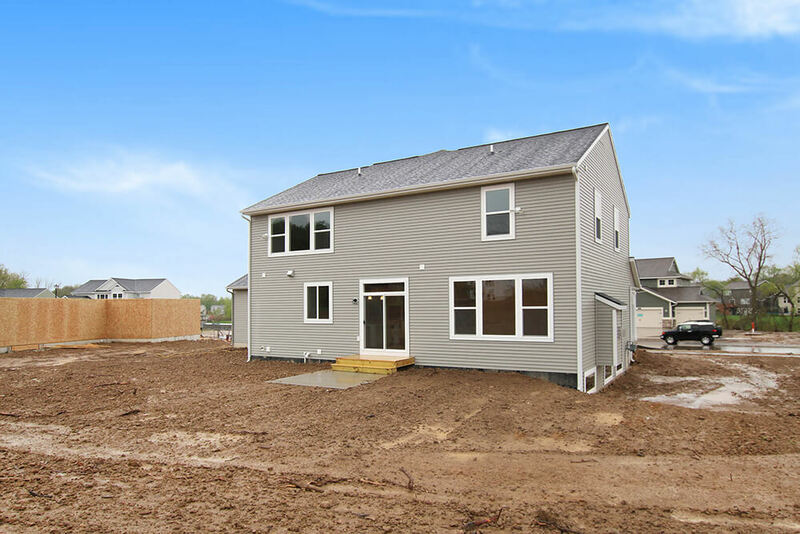 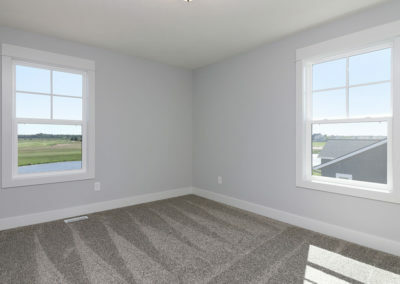 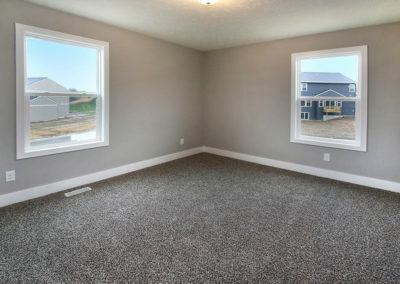 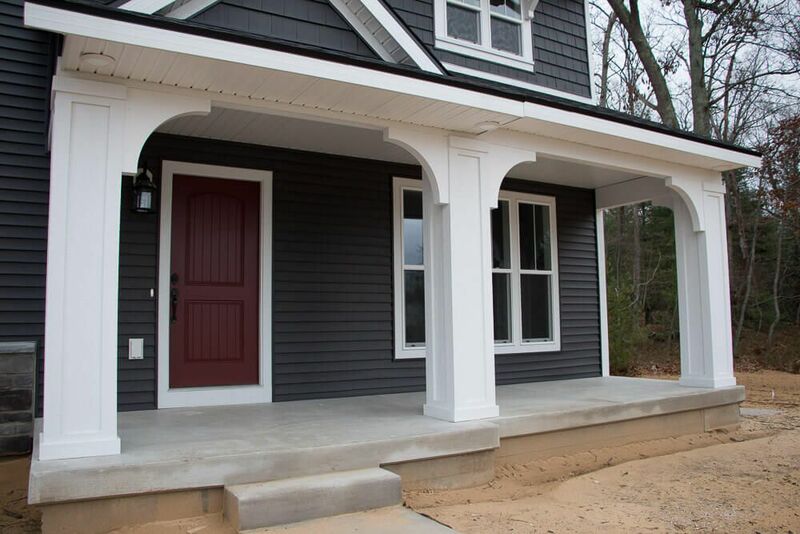 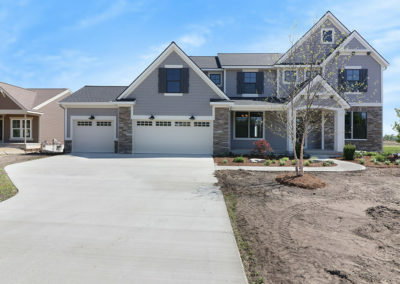 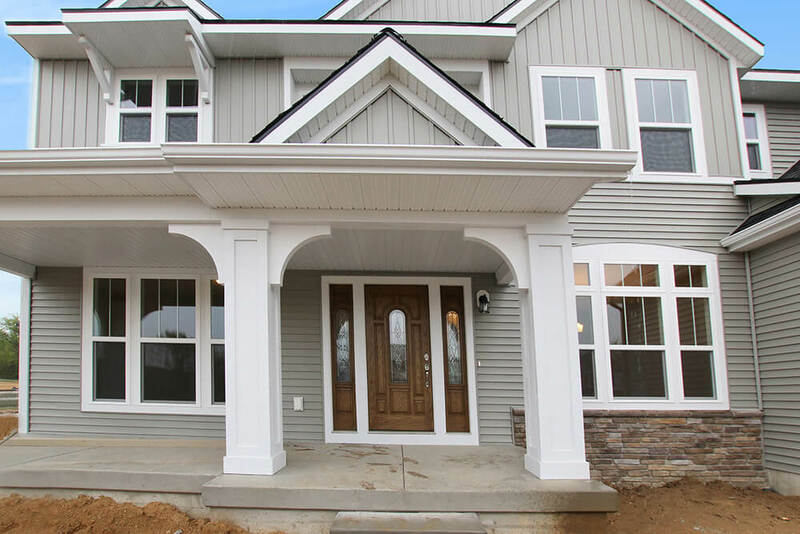 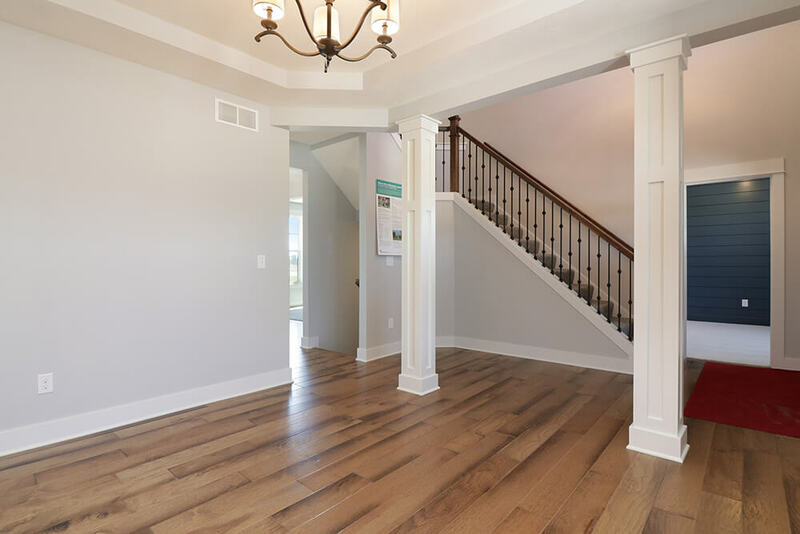 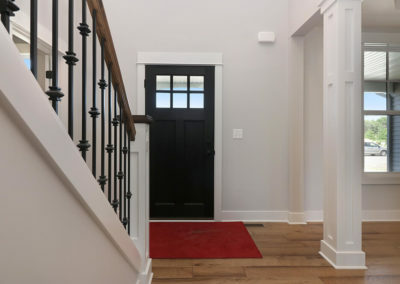 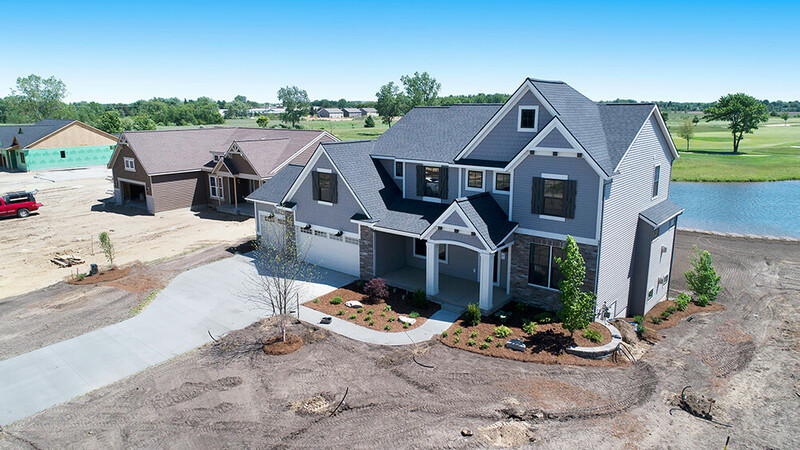 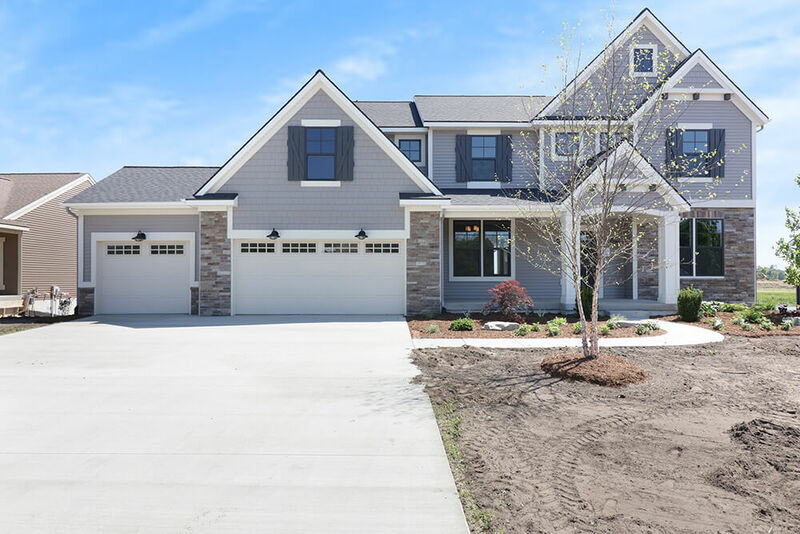 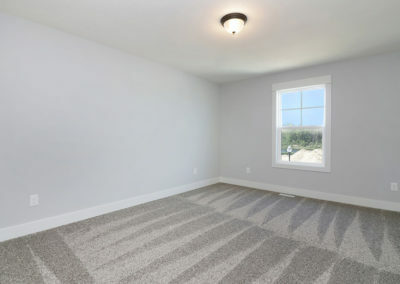 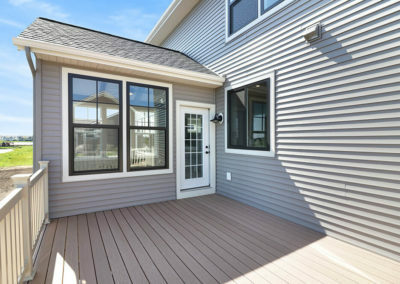 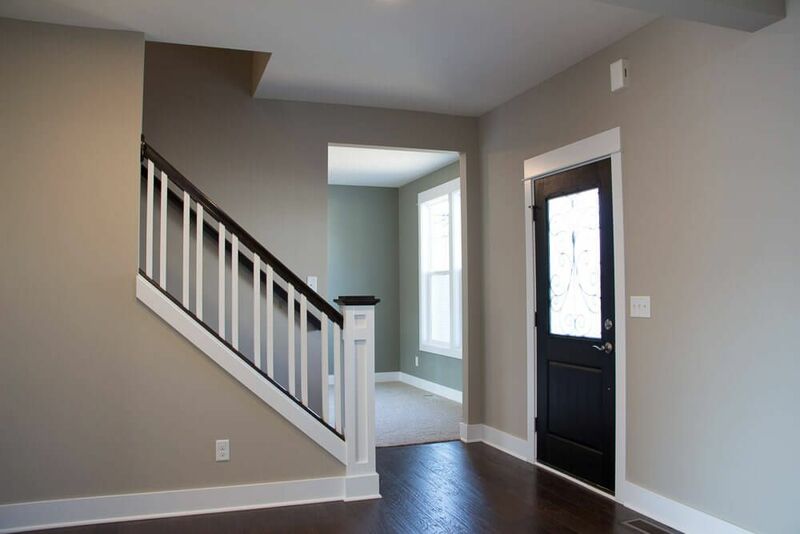 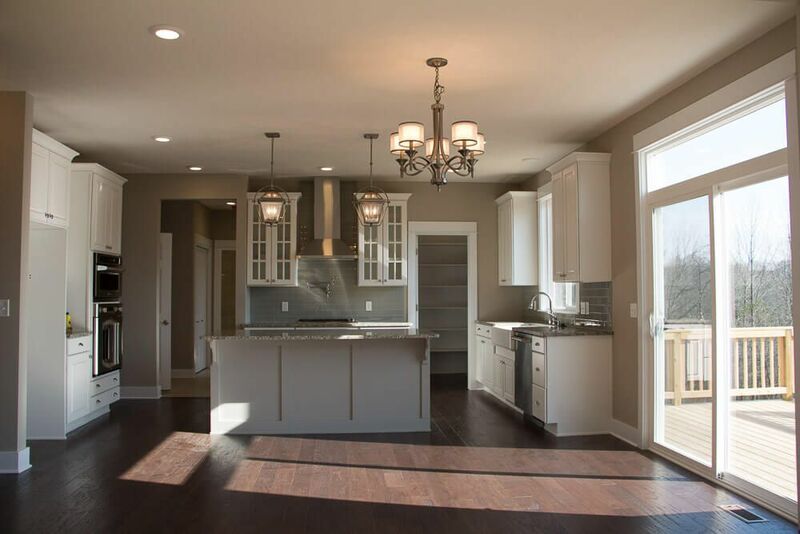 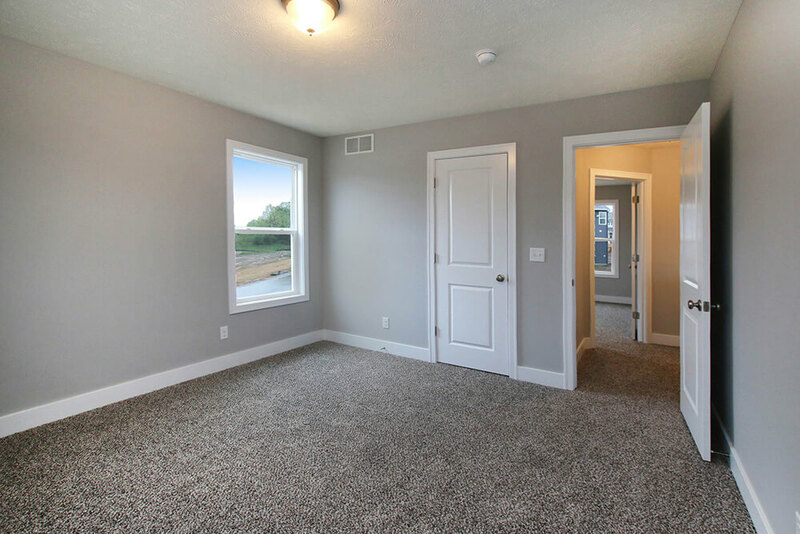 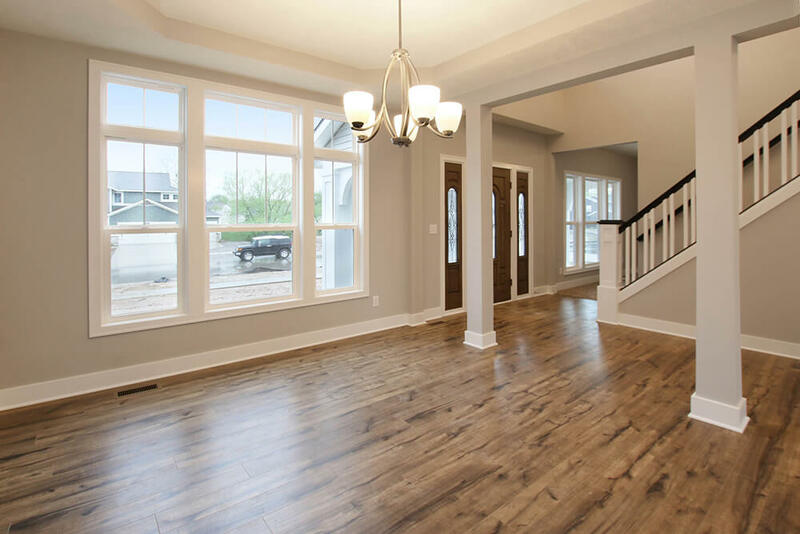 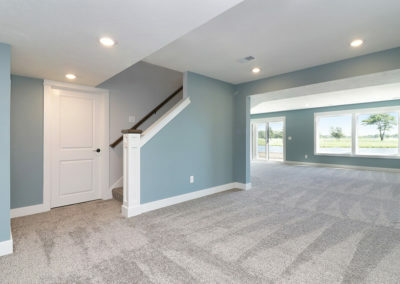 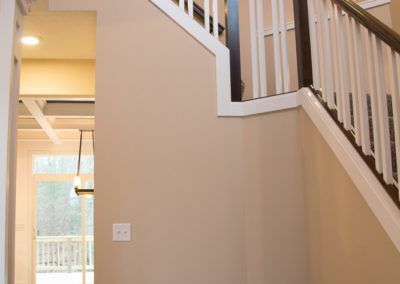 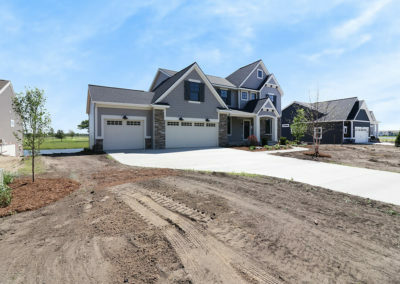 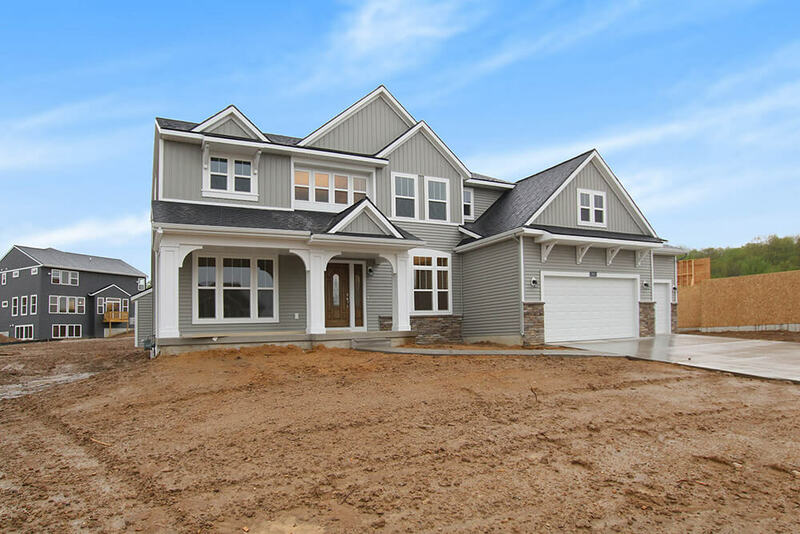 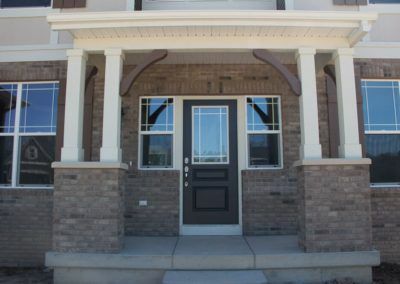 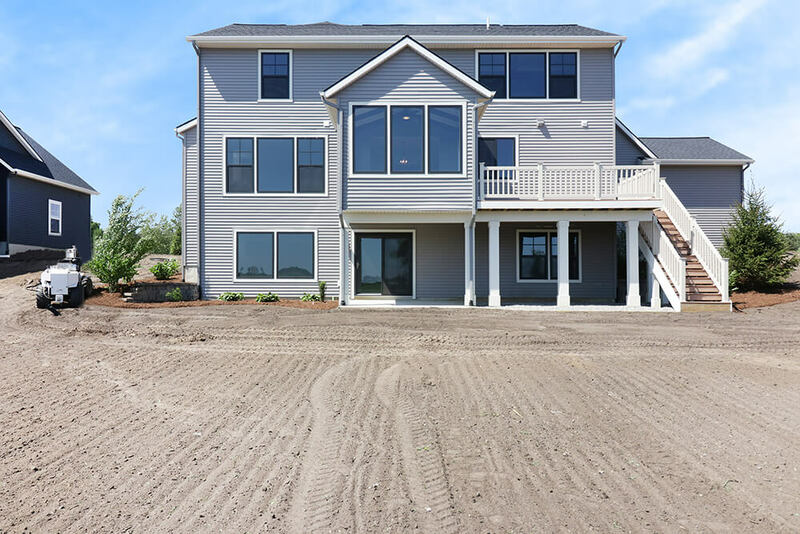 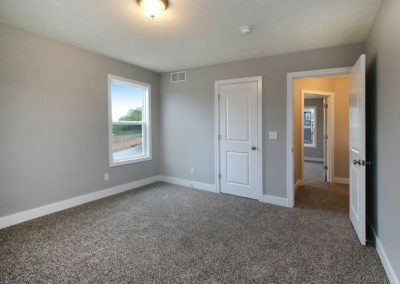 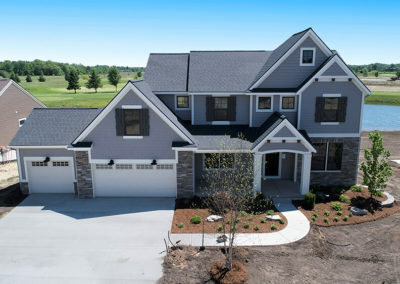 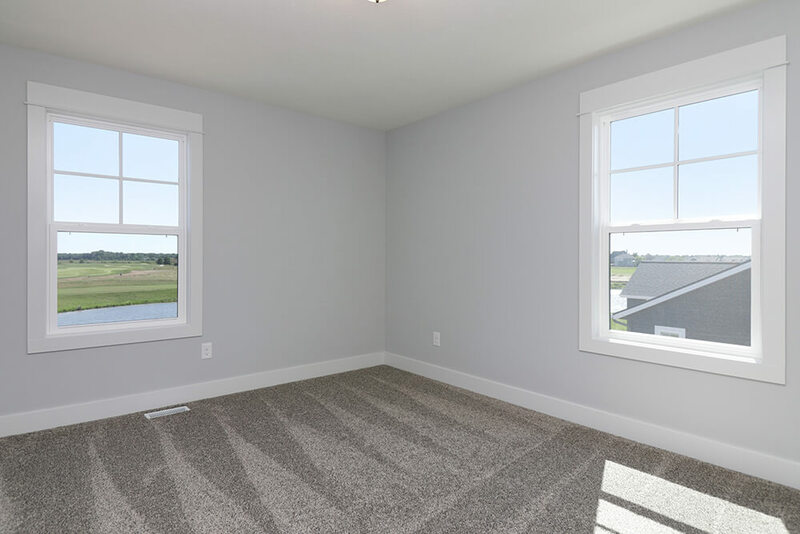 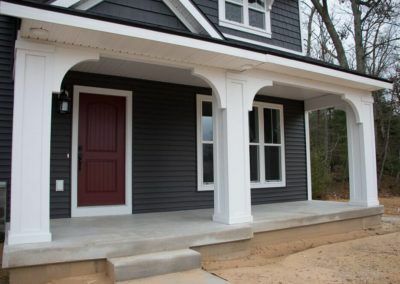 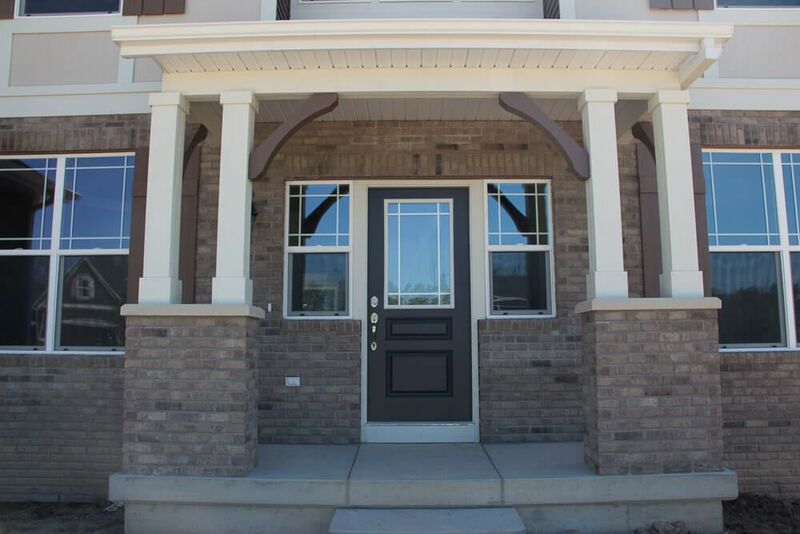 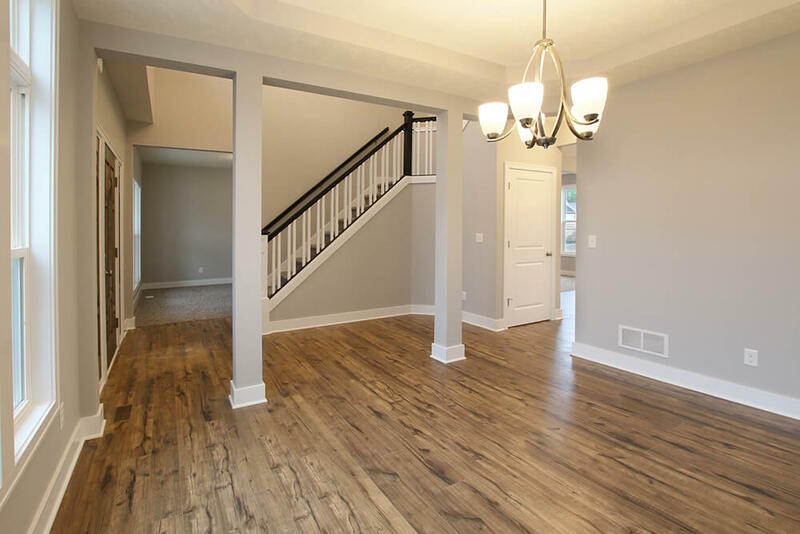 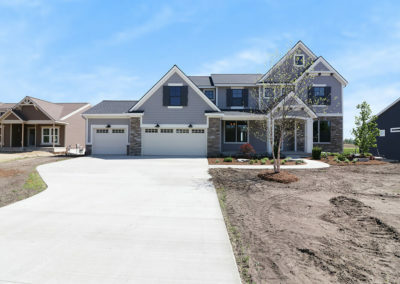 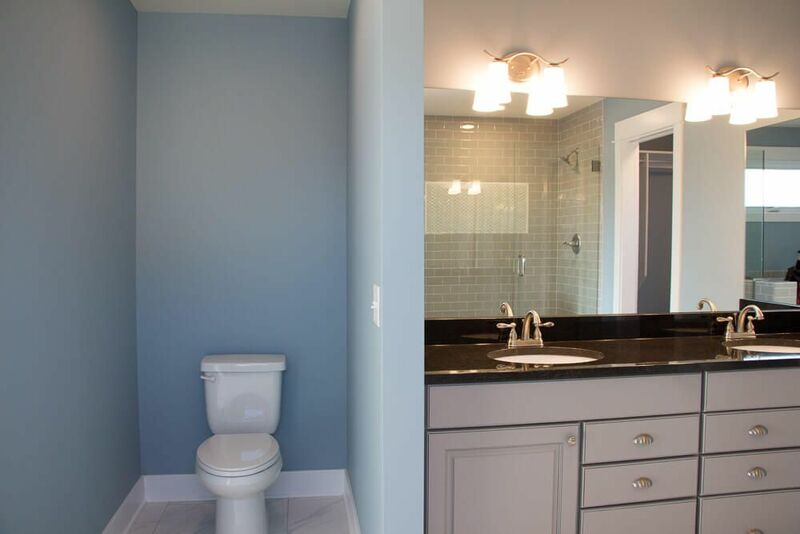 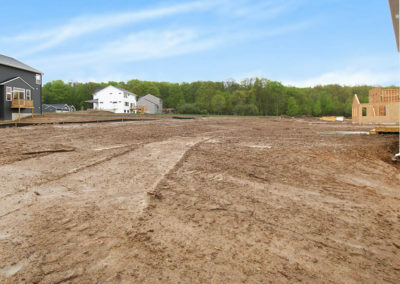 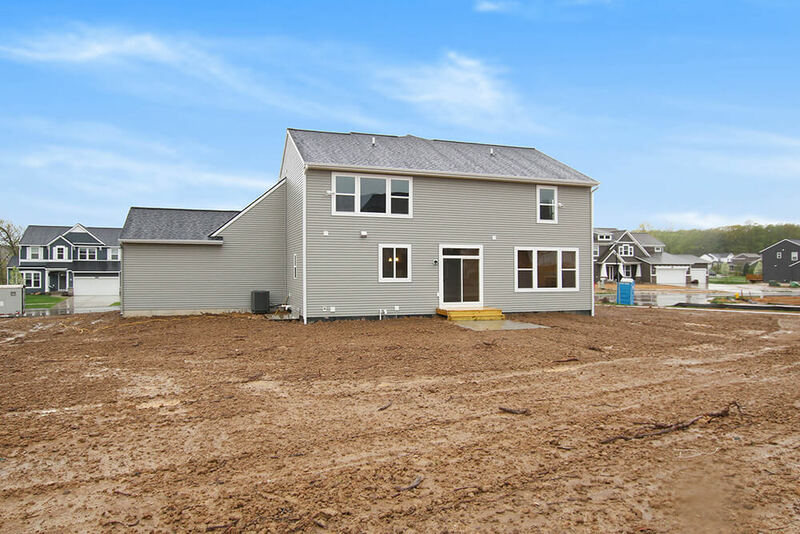 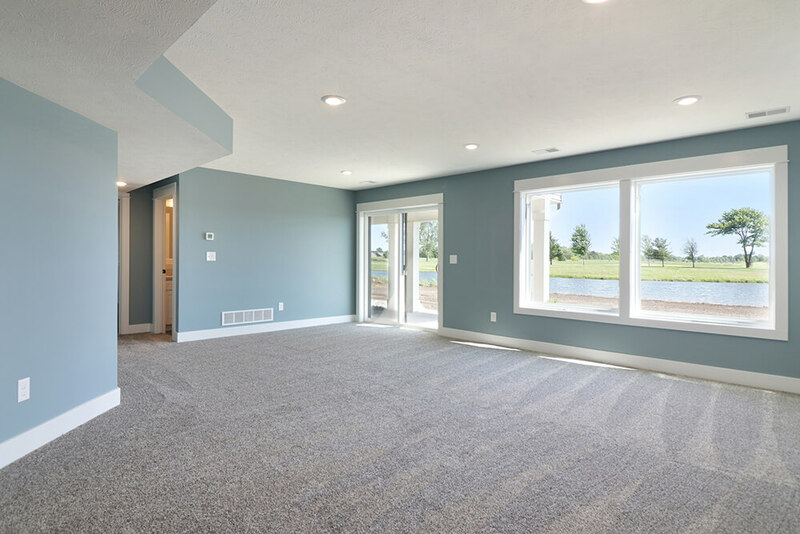 The front door of your new Crestview home opens from the front porch into the two story foyer. 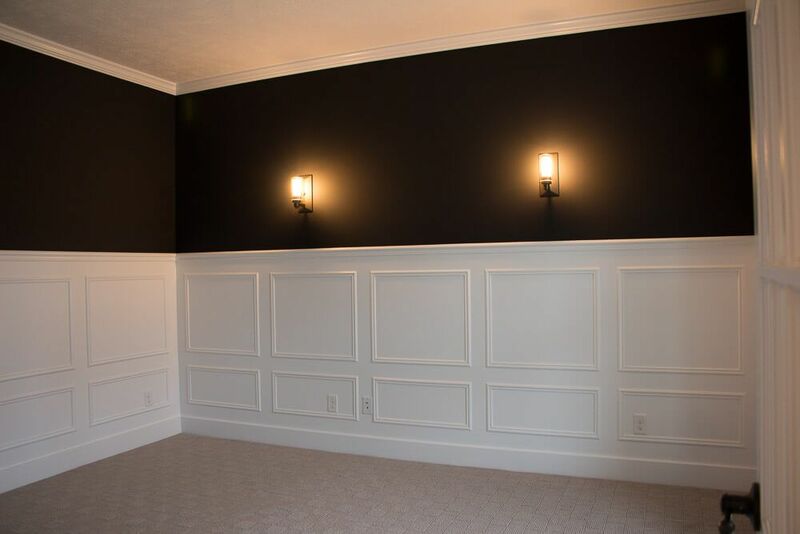 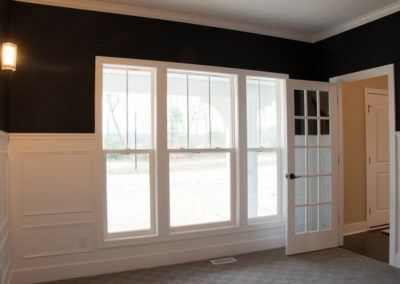 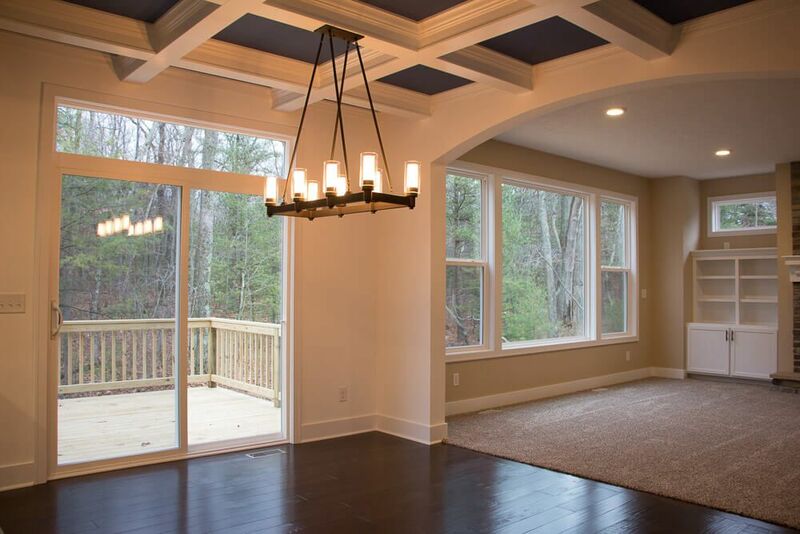 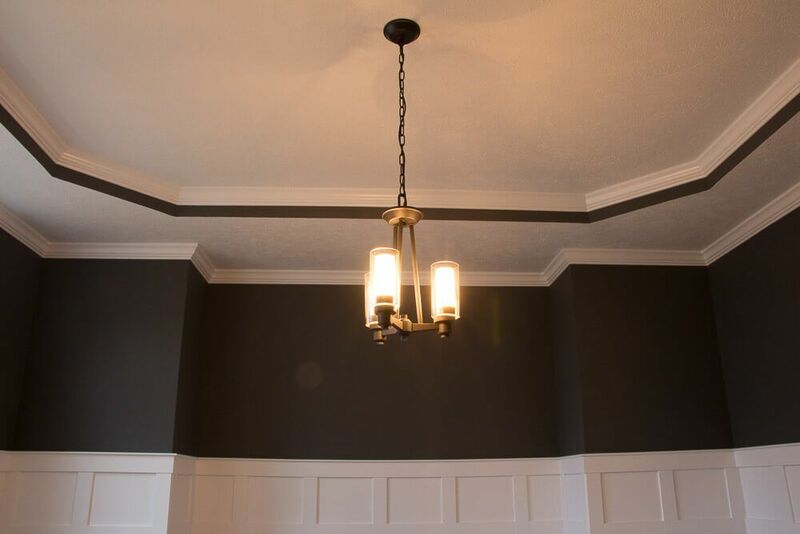 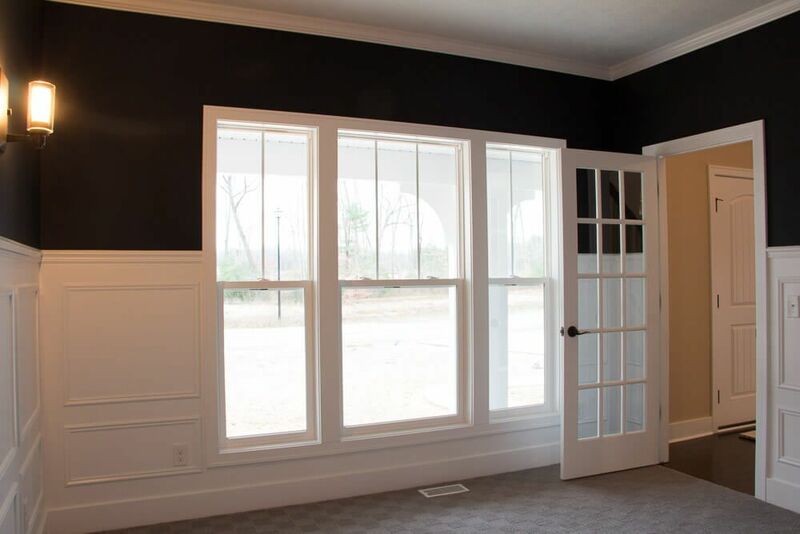 The entry way is open to the formal dining room with its stately tray ceiling, as well as the front living room. 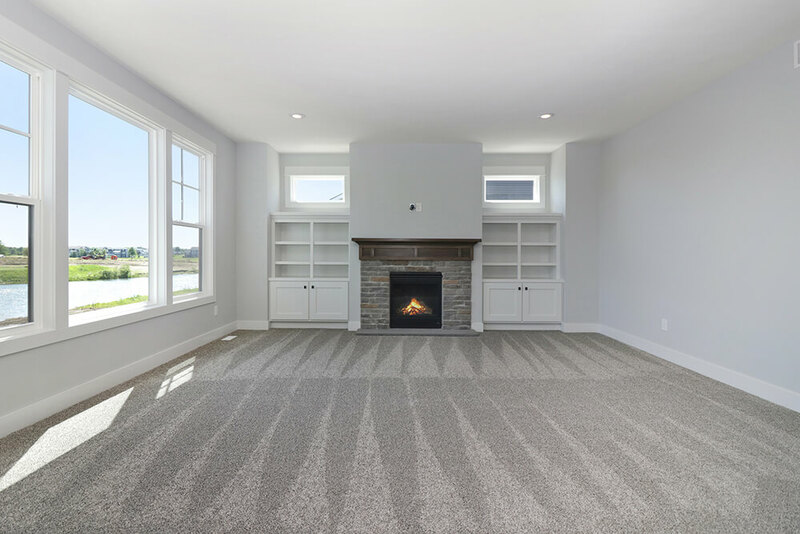 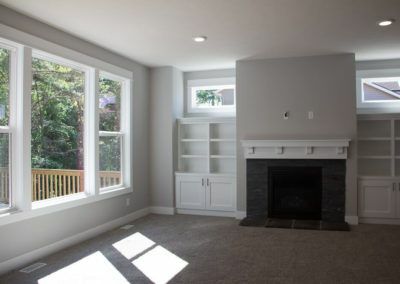 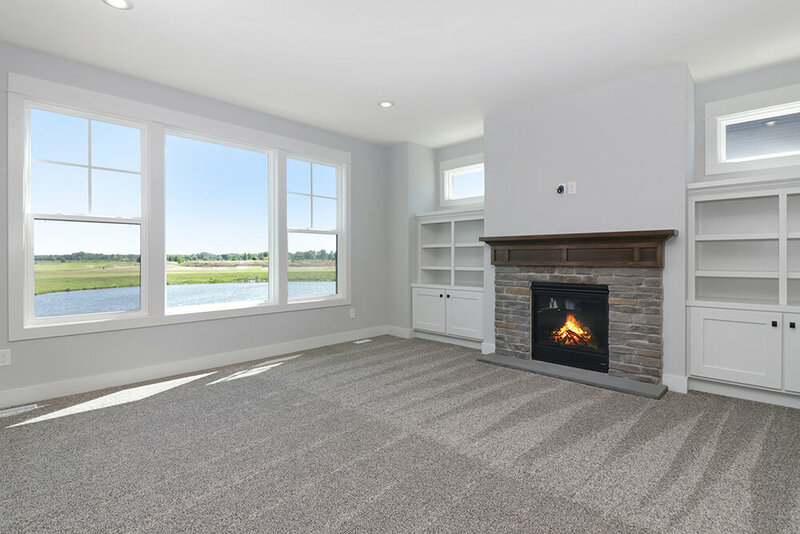 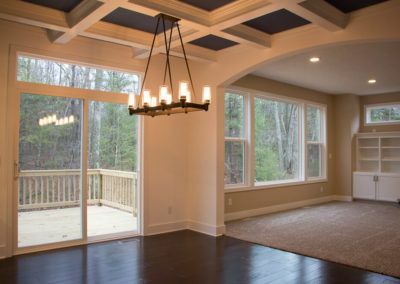 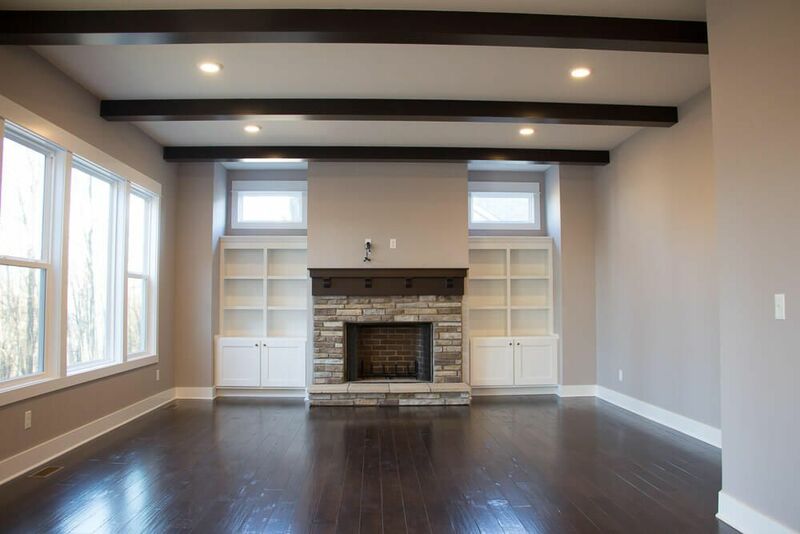 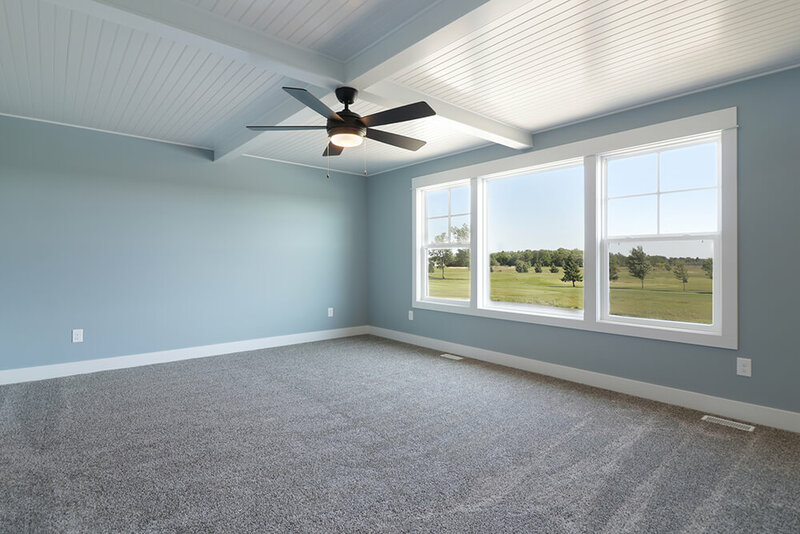 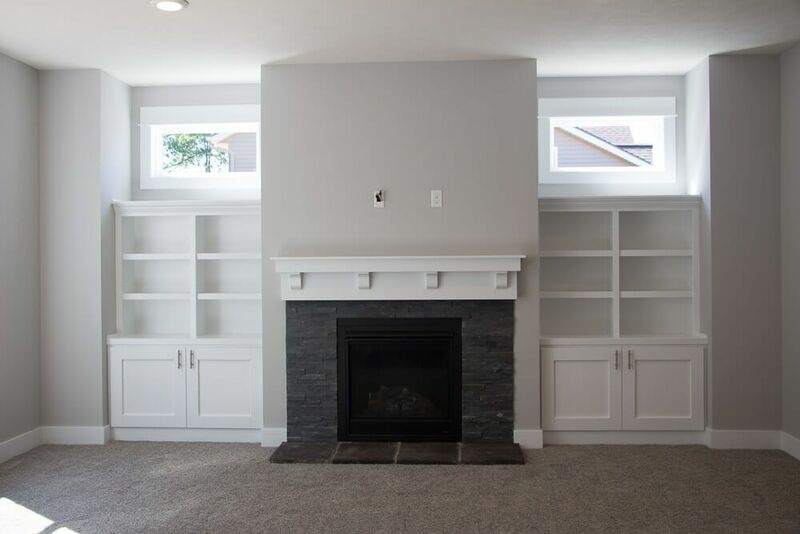 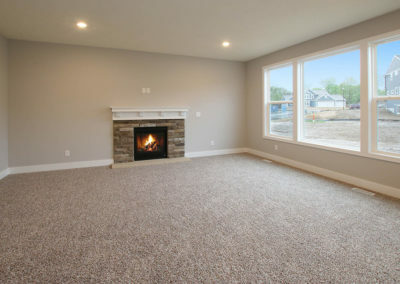 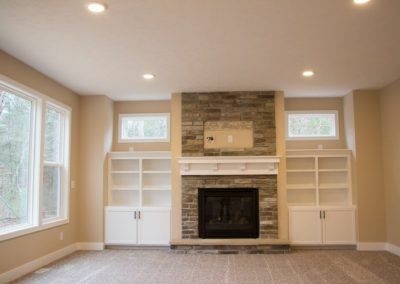 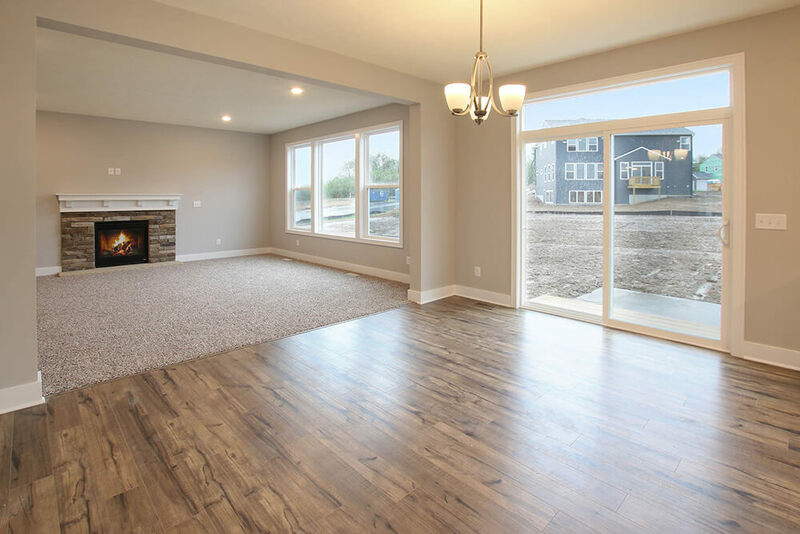 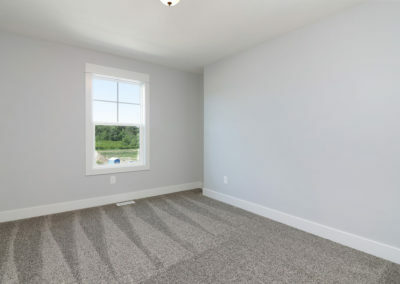 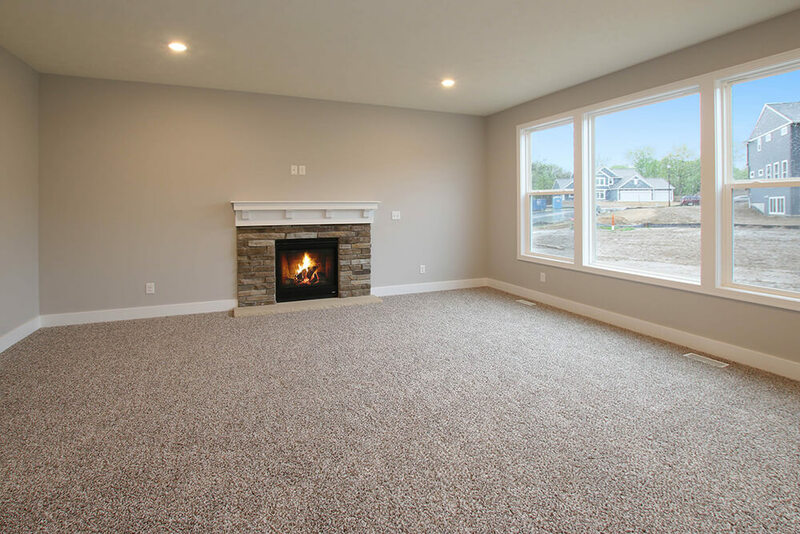 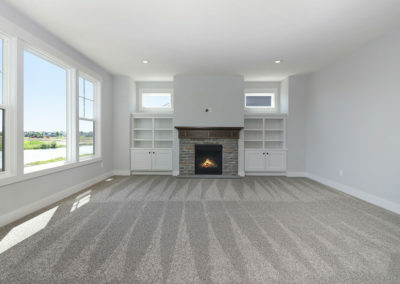 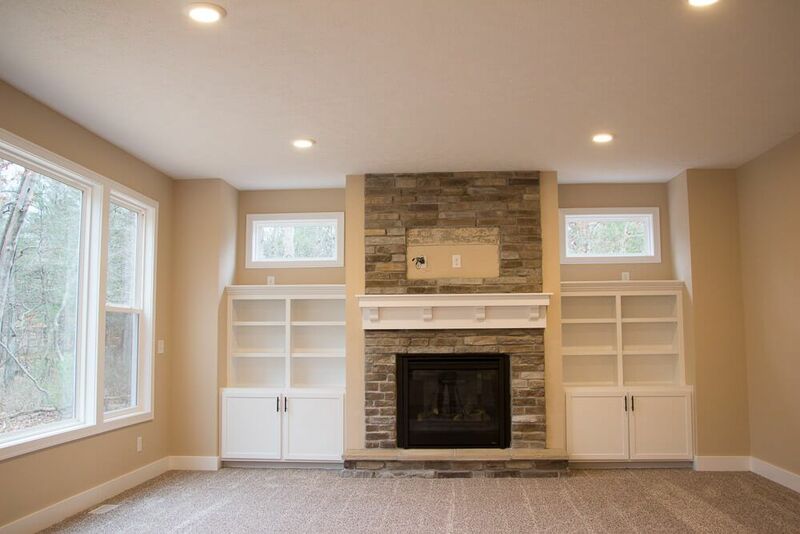 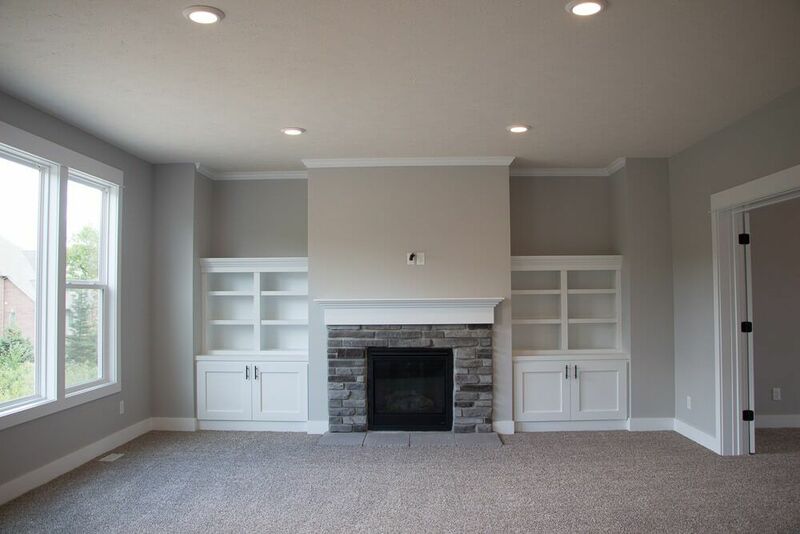 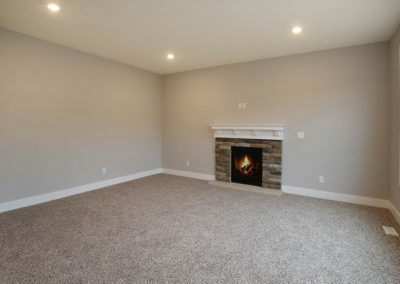 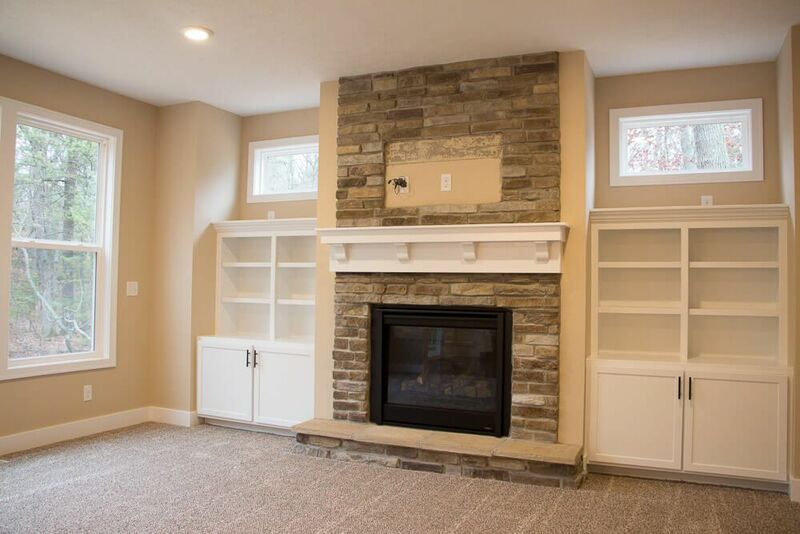 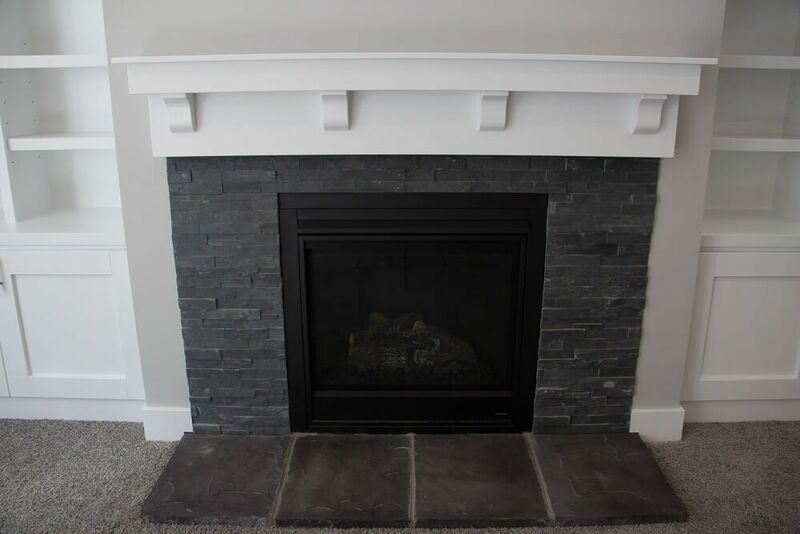 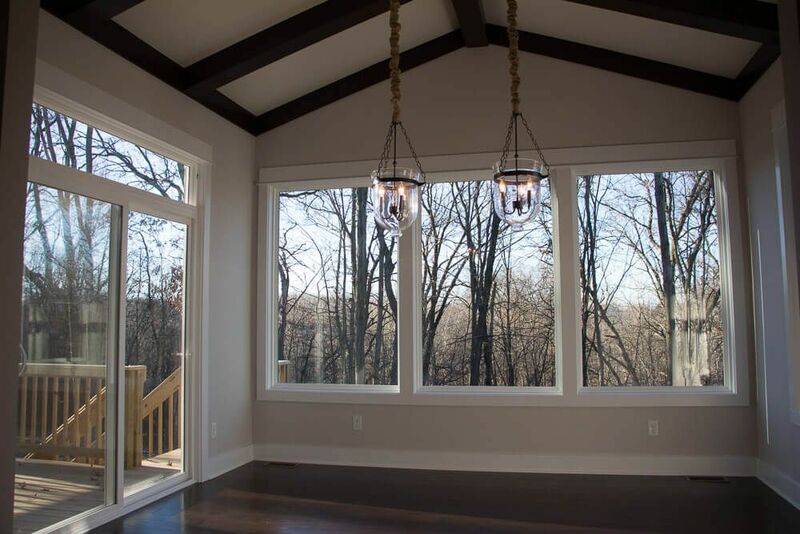 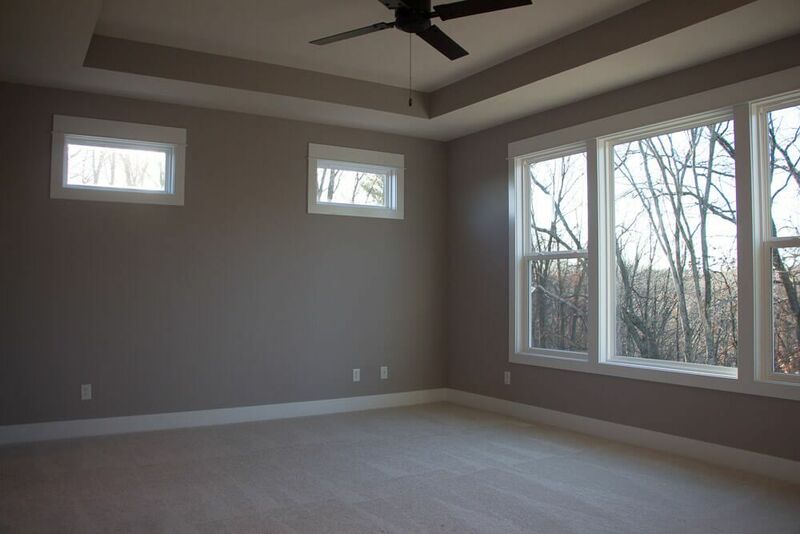 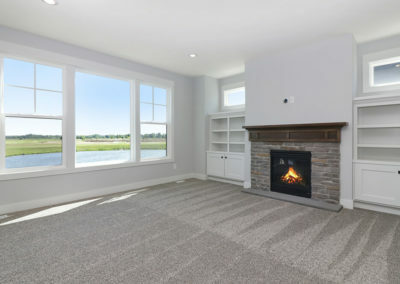 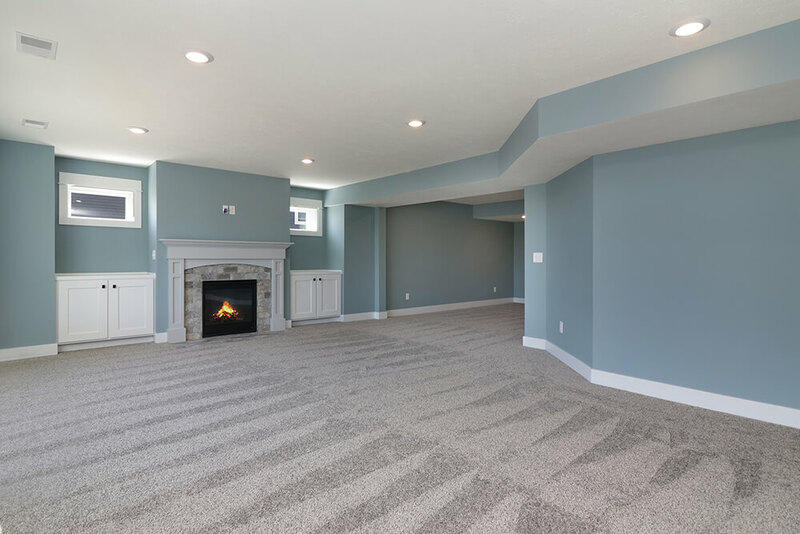 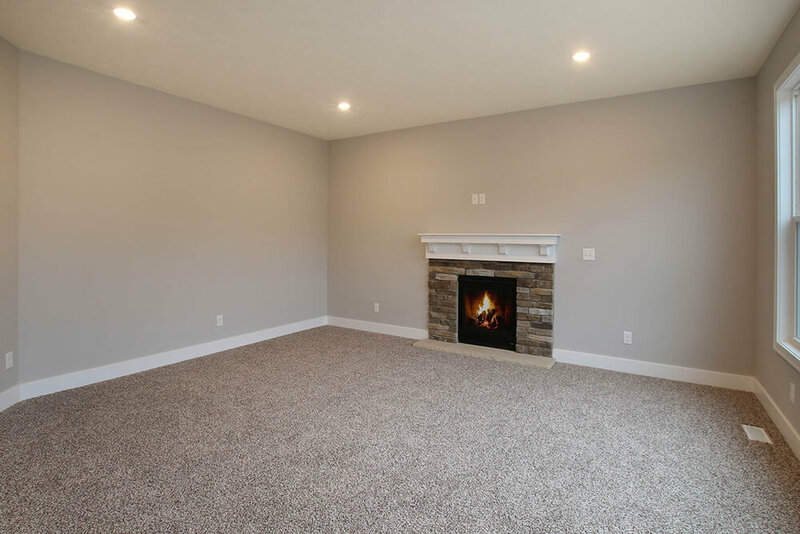 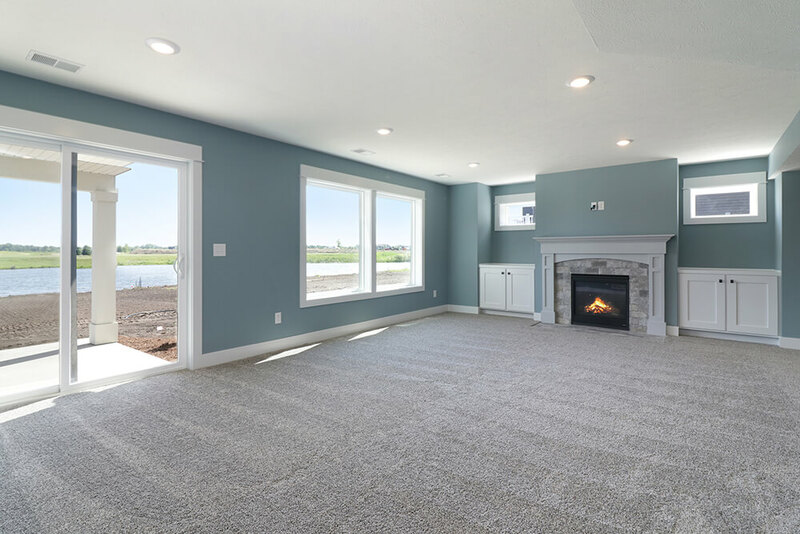 Moving further into the home, the cozy family room includes a fireplace and offers the option to add even more sunny windows. 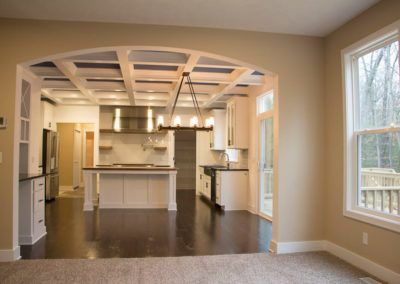 From the living room, the breakfast area and kitchen form a large, open, free-flowing unit. 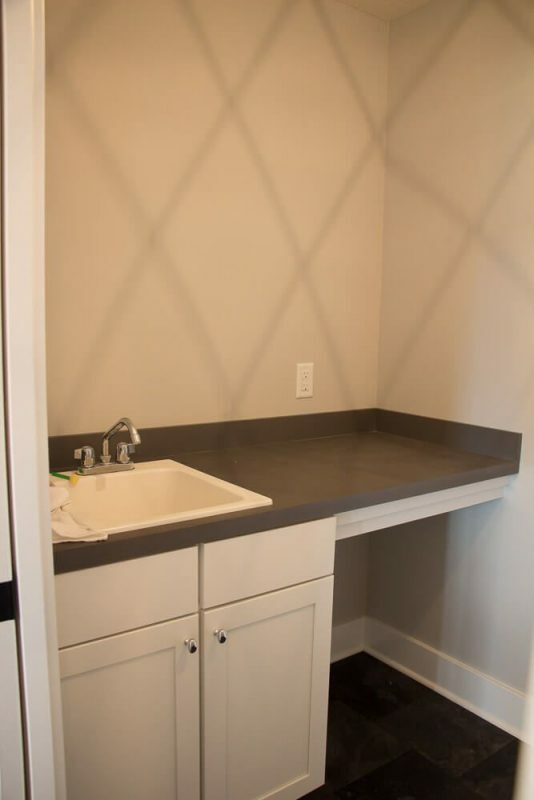 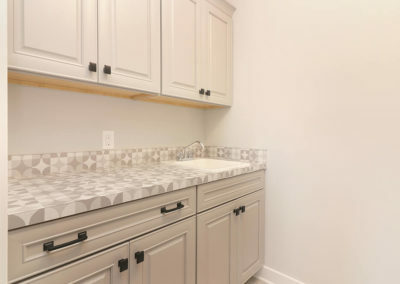 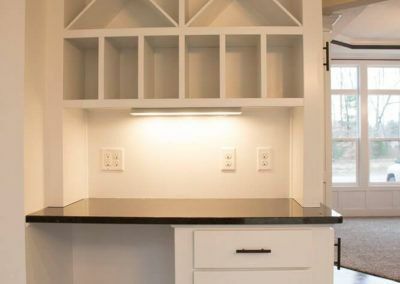 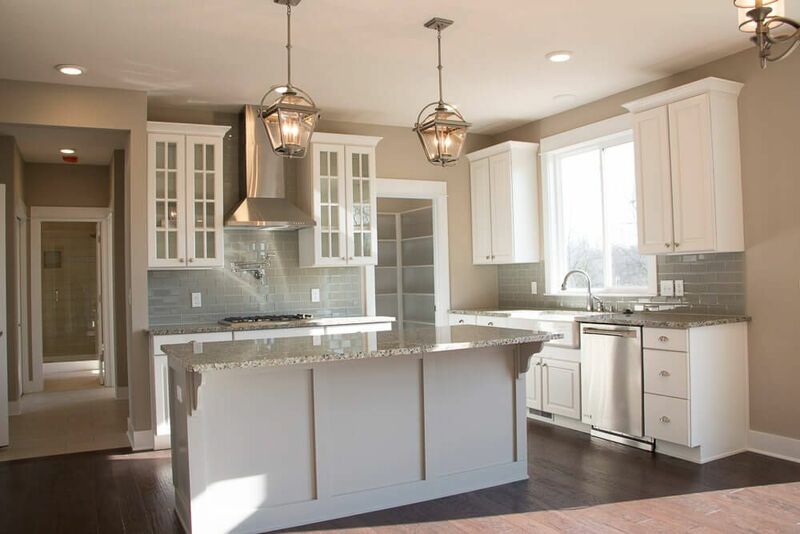 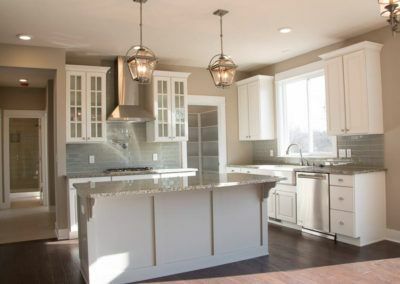 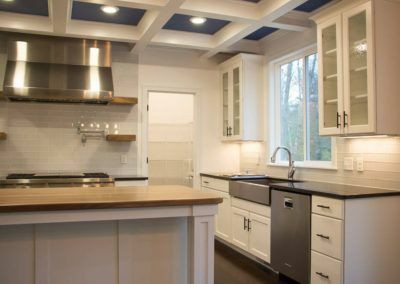 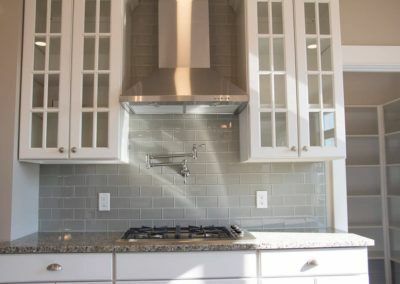 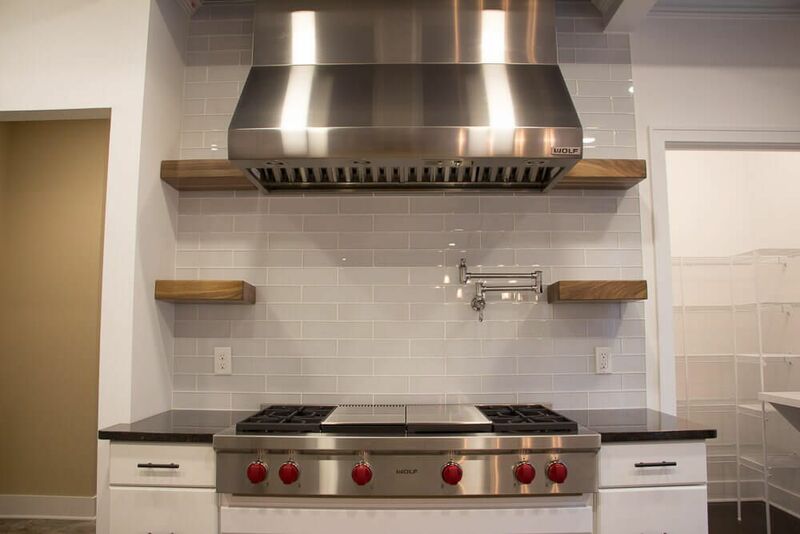 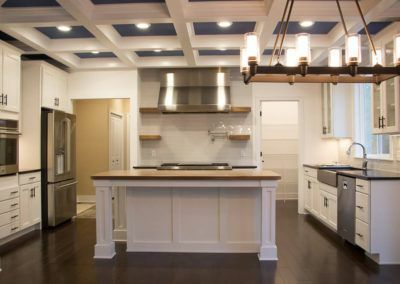 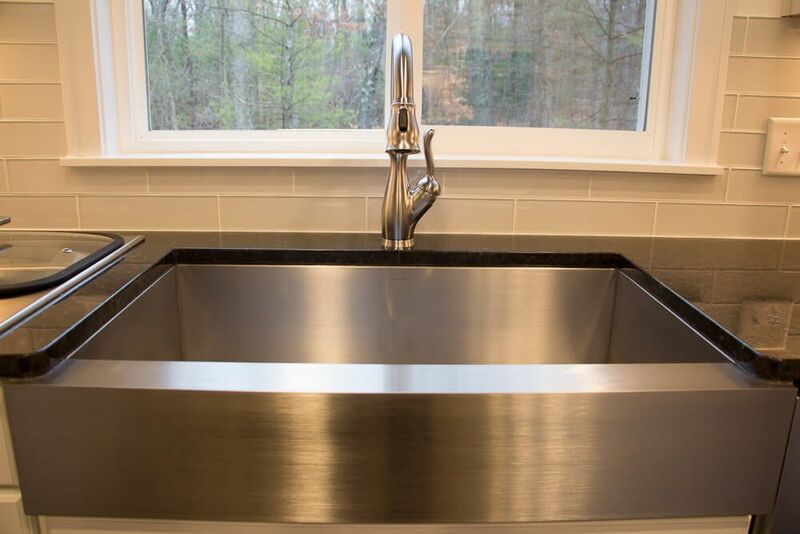 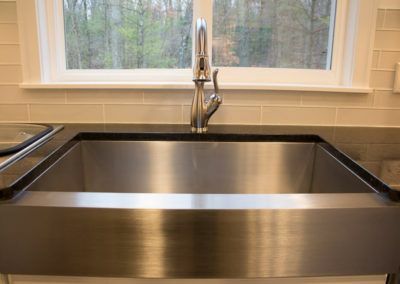 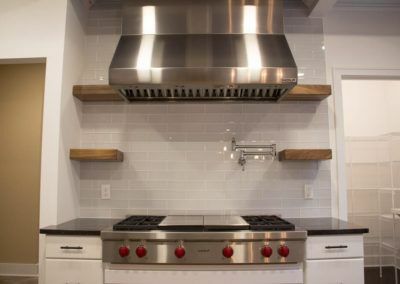 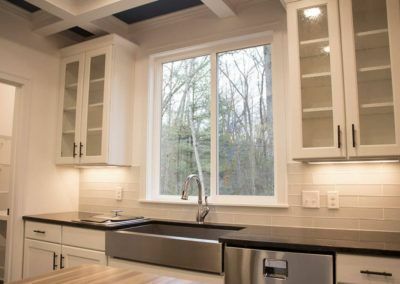 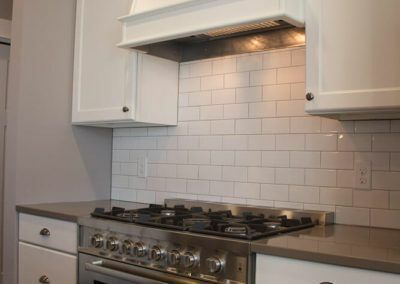 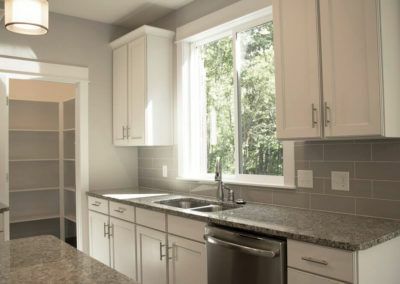 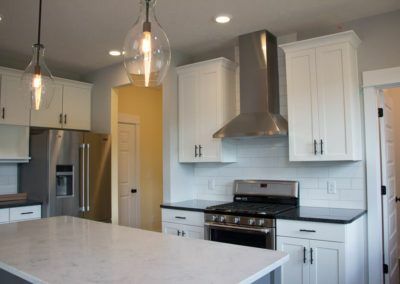 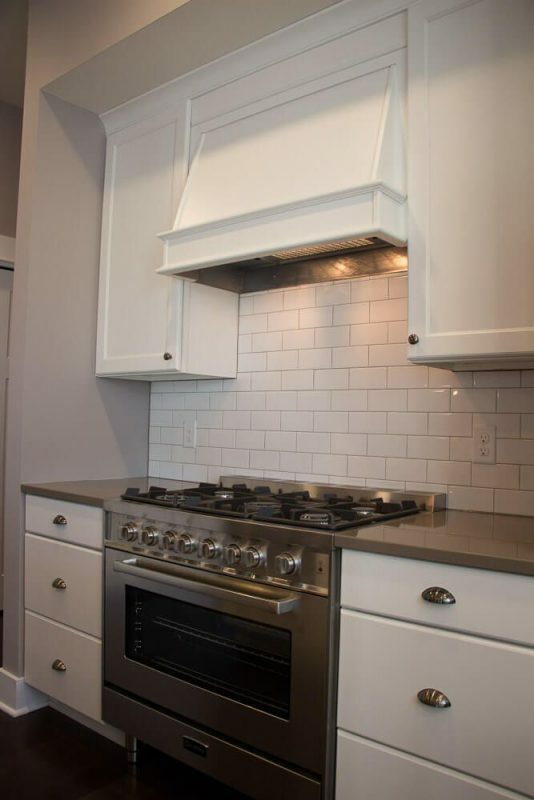 The kitchen includes a large central island and includes ample counter and cupboard space. 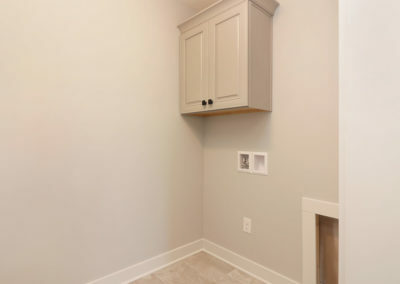 Connected to the kitchen is the main level laundry room, the half bath, and the entry way to the two or three car garage. 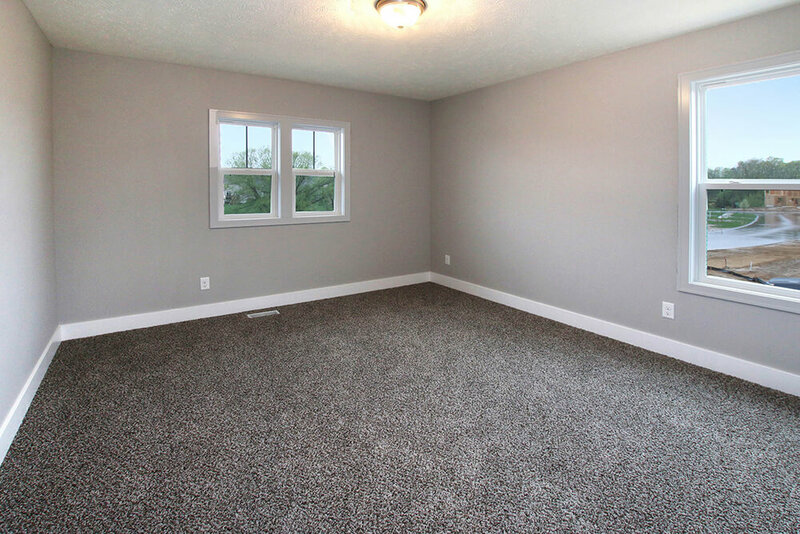 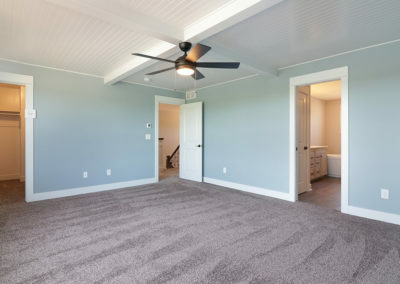 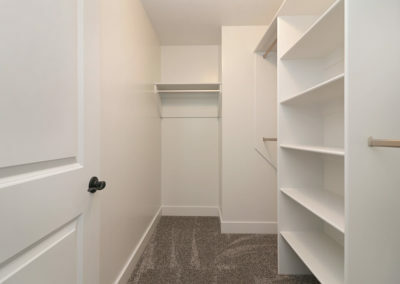 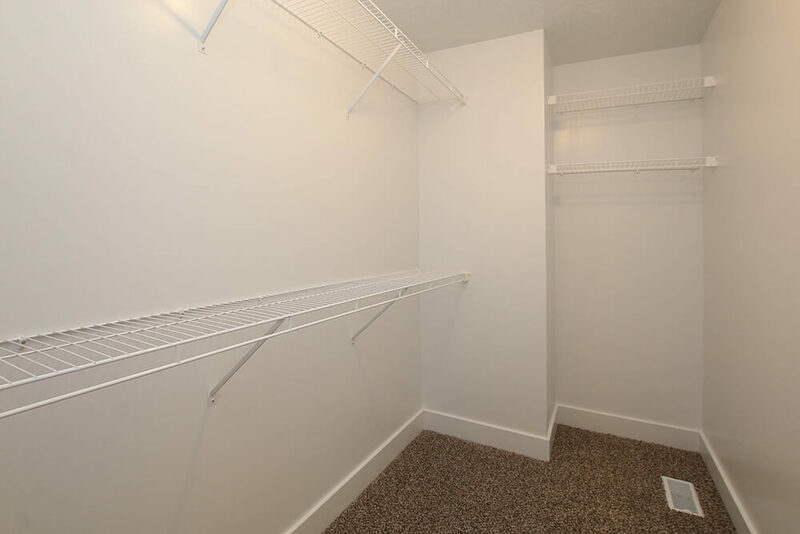 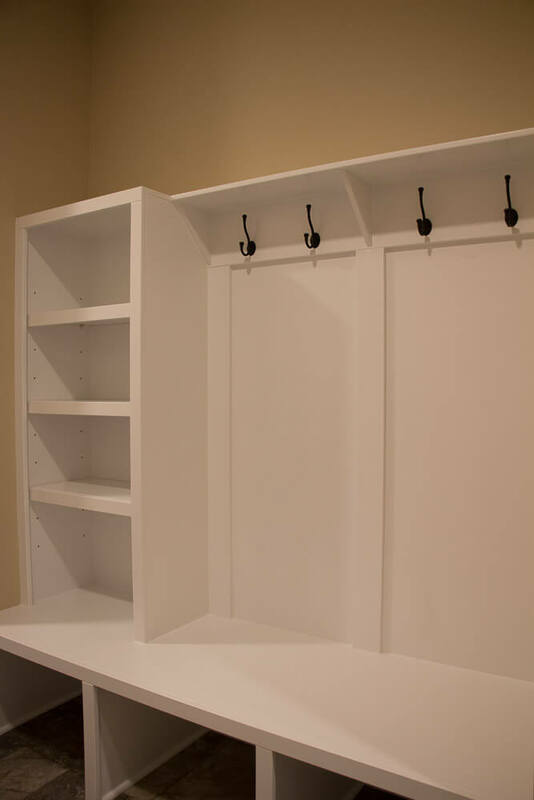 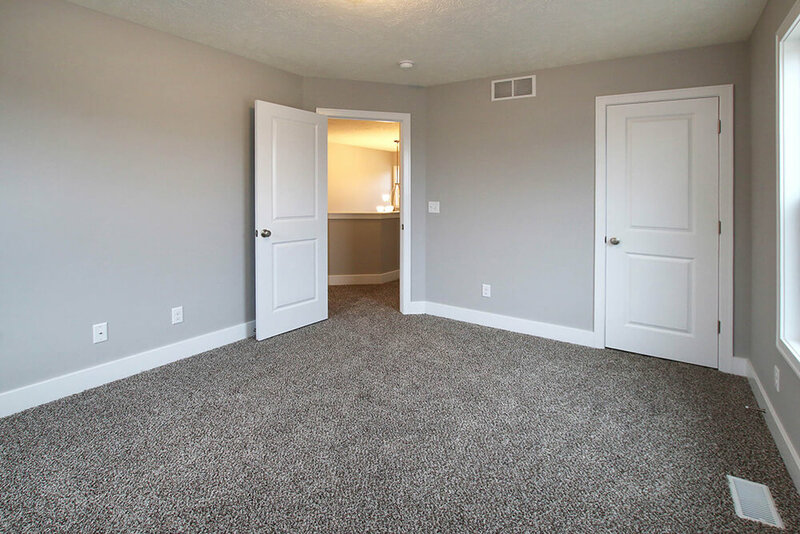 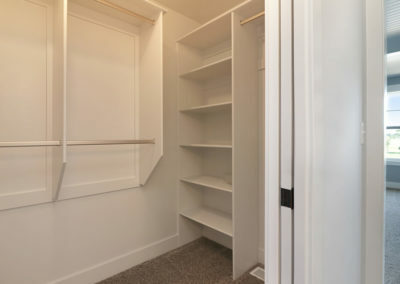 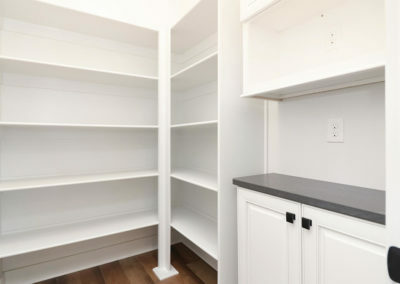 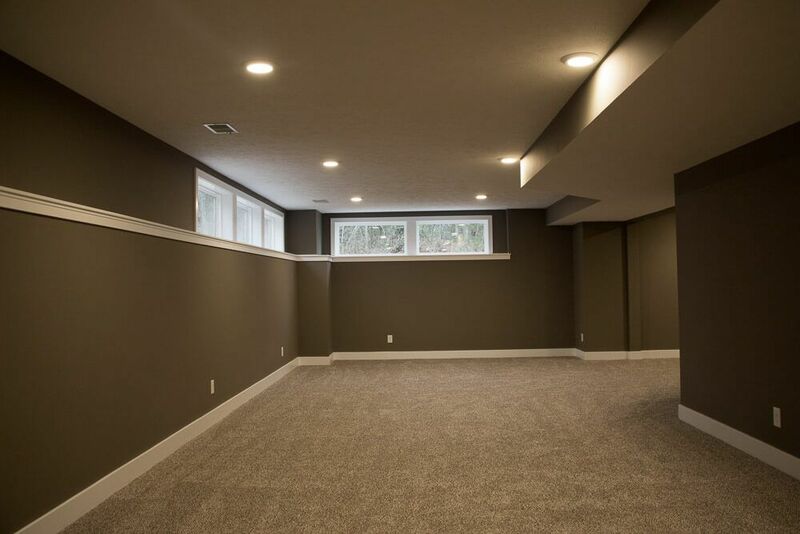 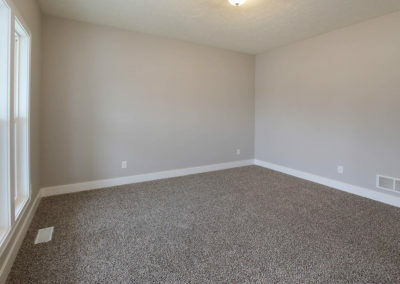 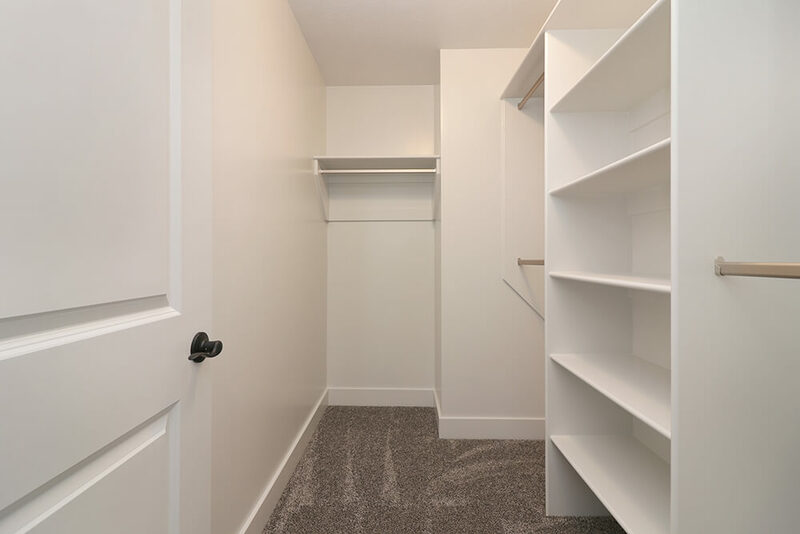 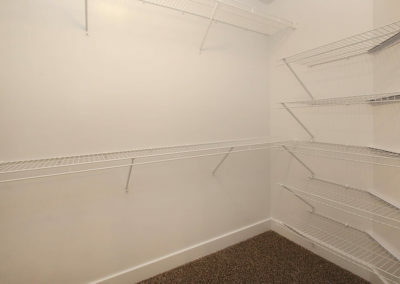 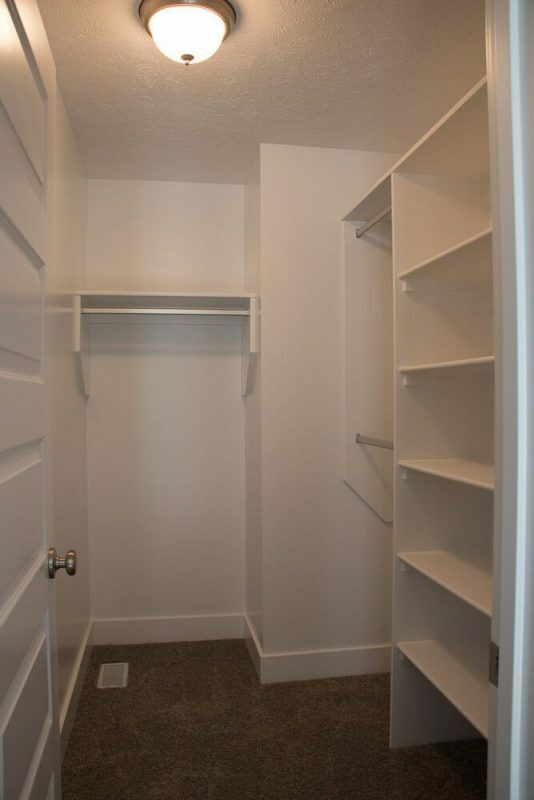 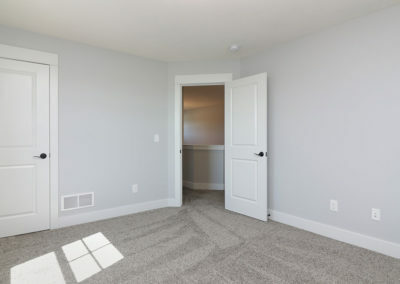 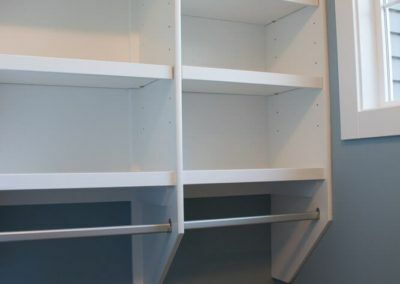 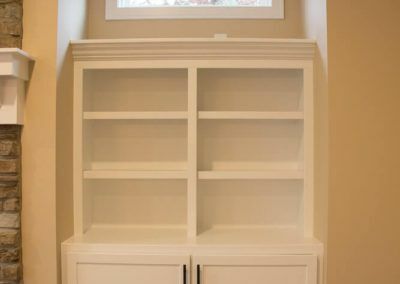 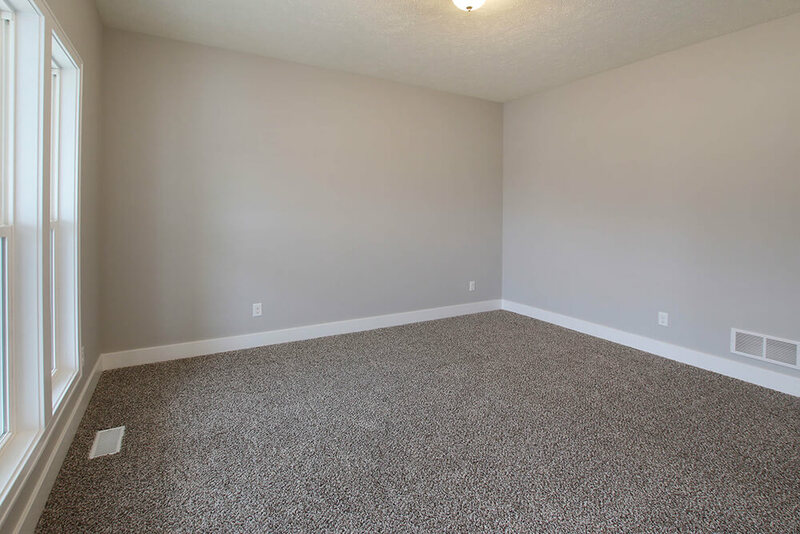 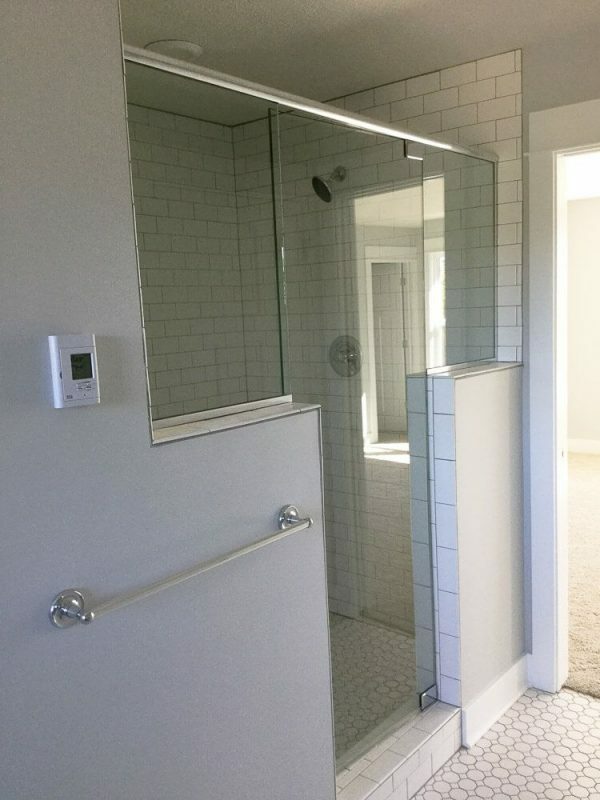 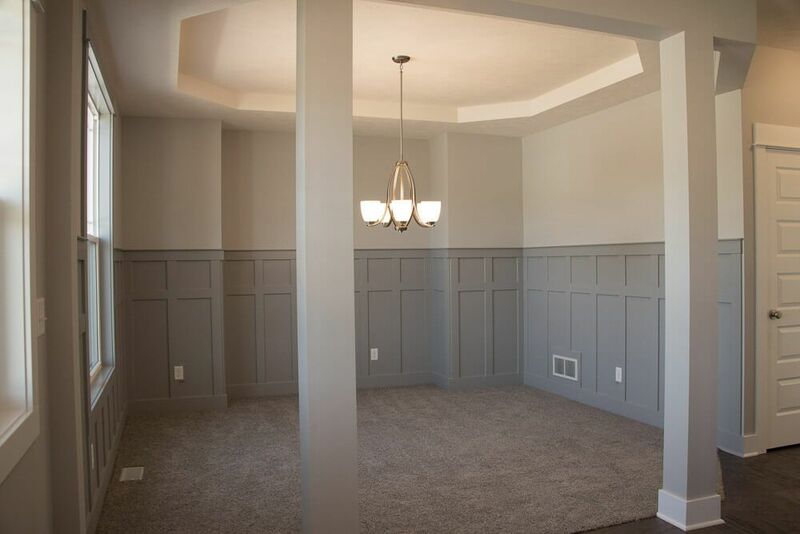 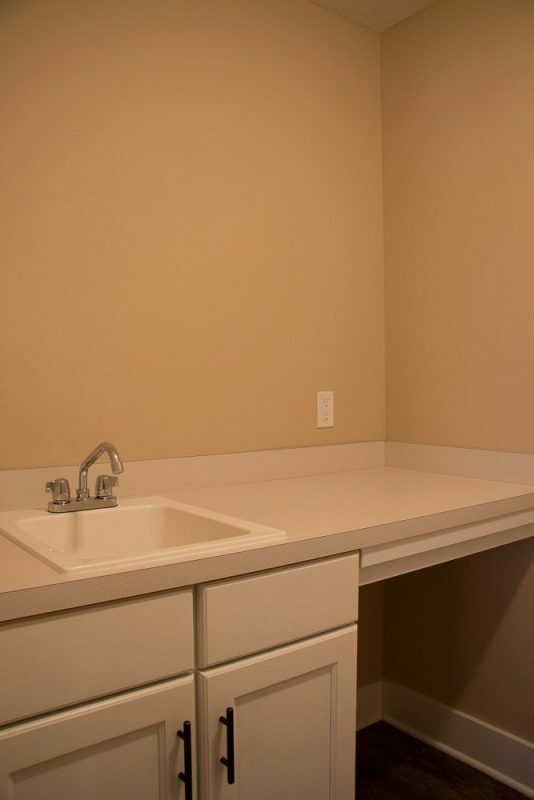 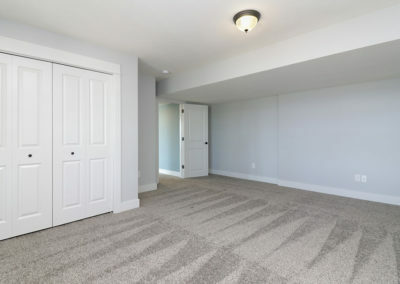 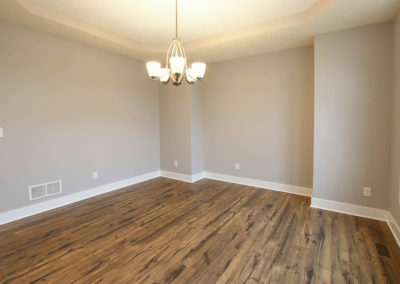 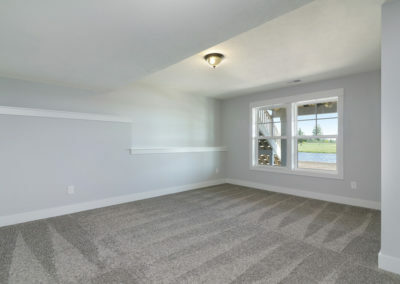 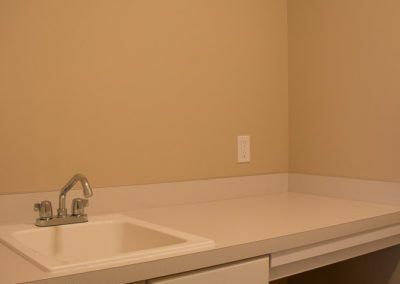 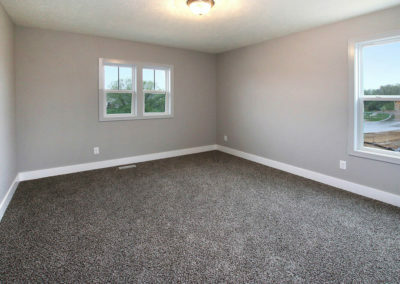 To add extra space to the main level, you can choose the flex room option. 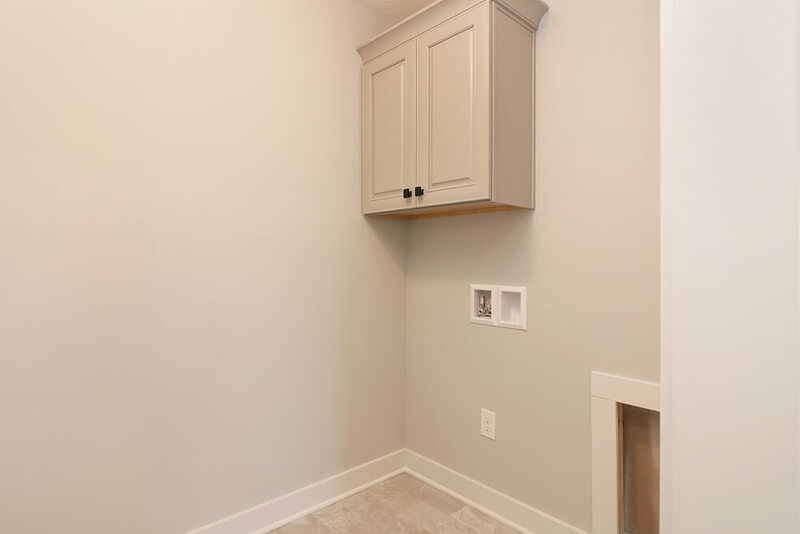 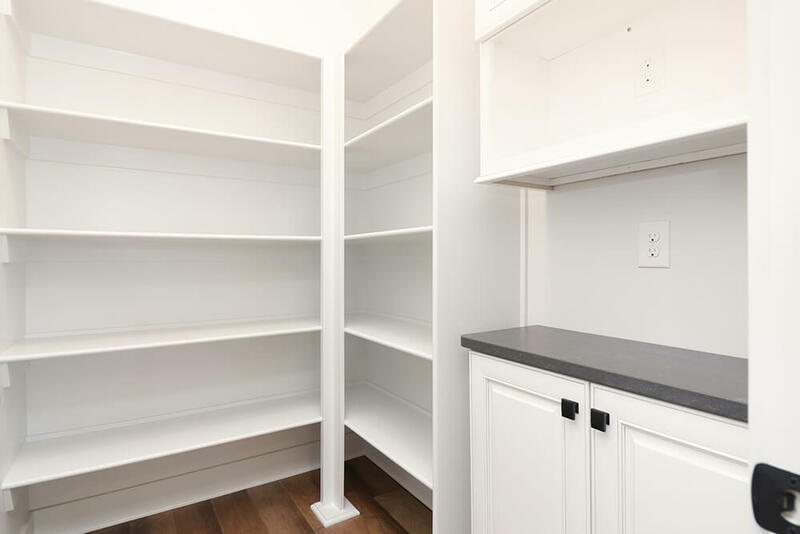 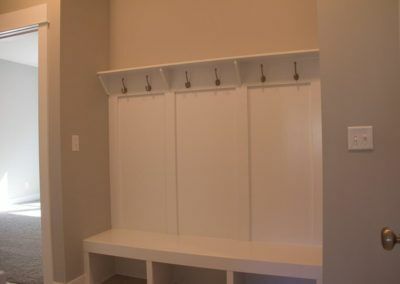 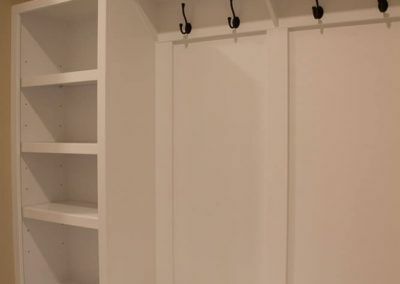 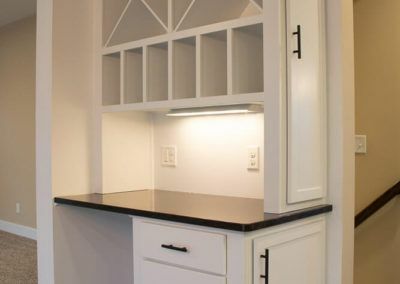 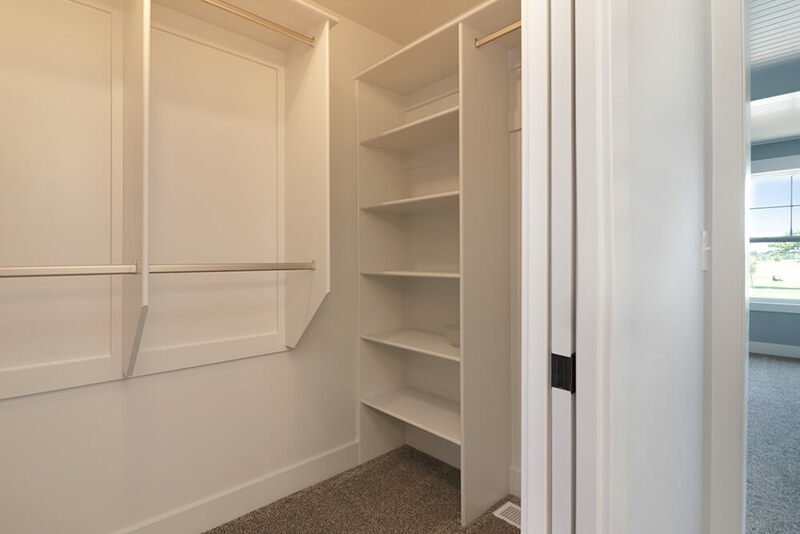 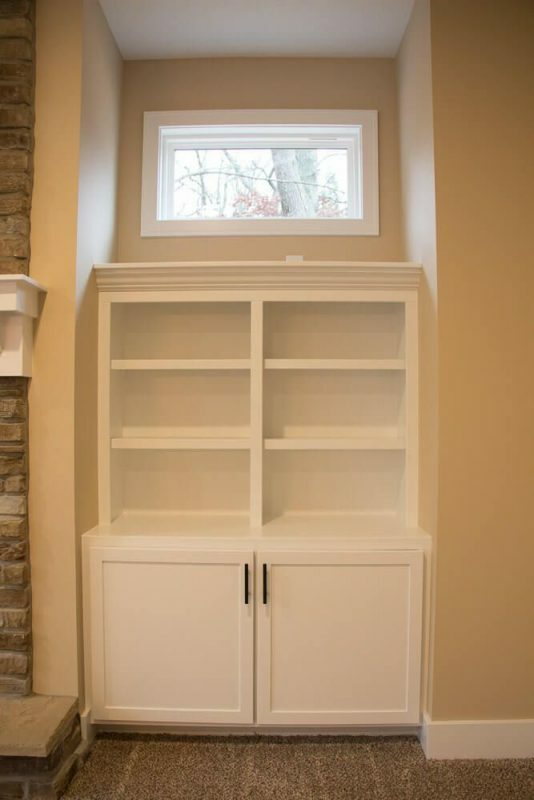 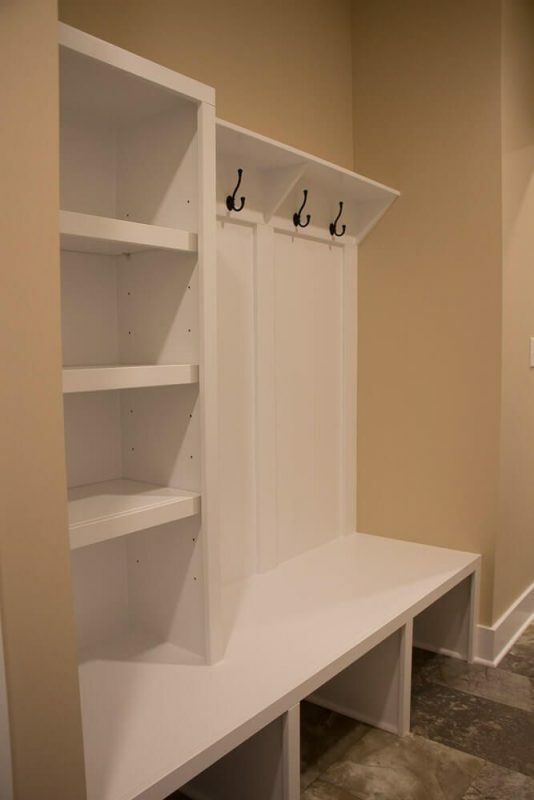 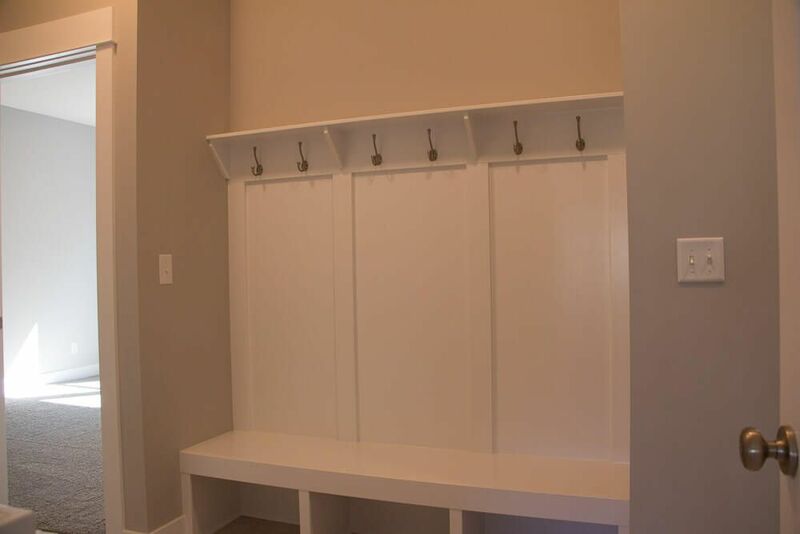 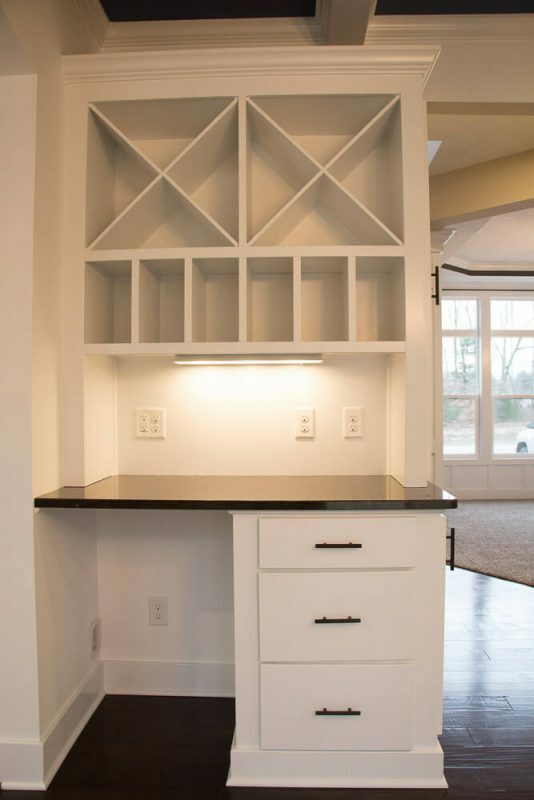 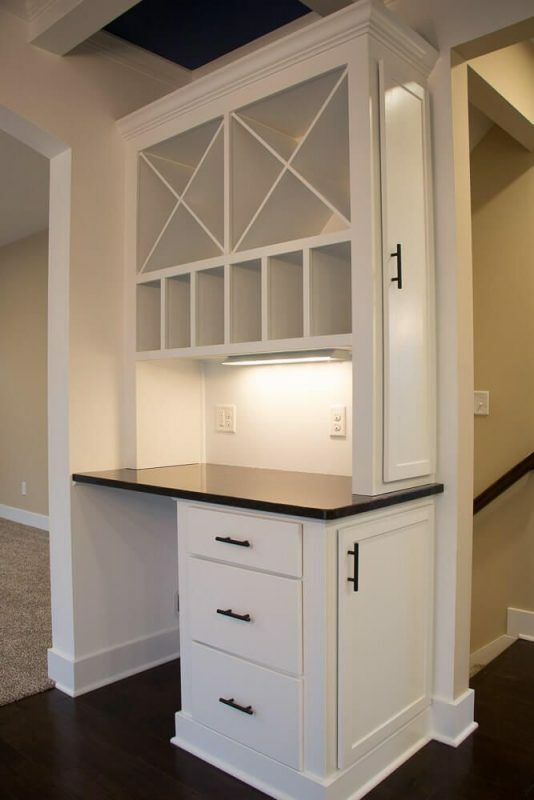 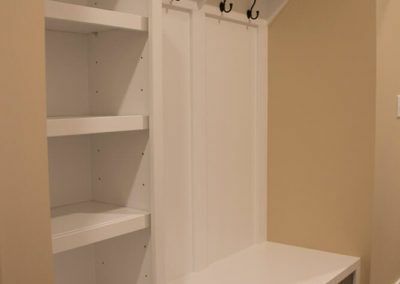 This home plan selection adds a large walk-in pantry to the kitchen, expands the garage entry into a mudroom, and adds a quiet room to the rear corner of the house. 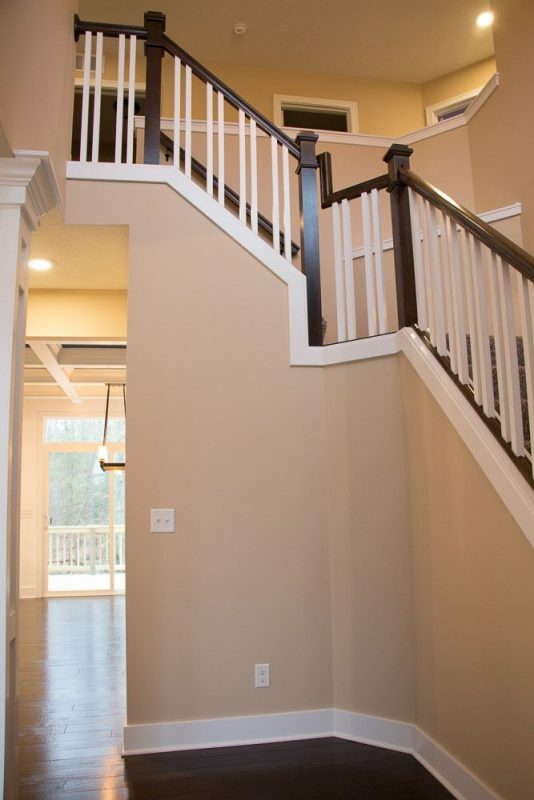 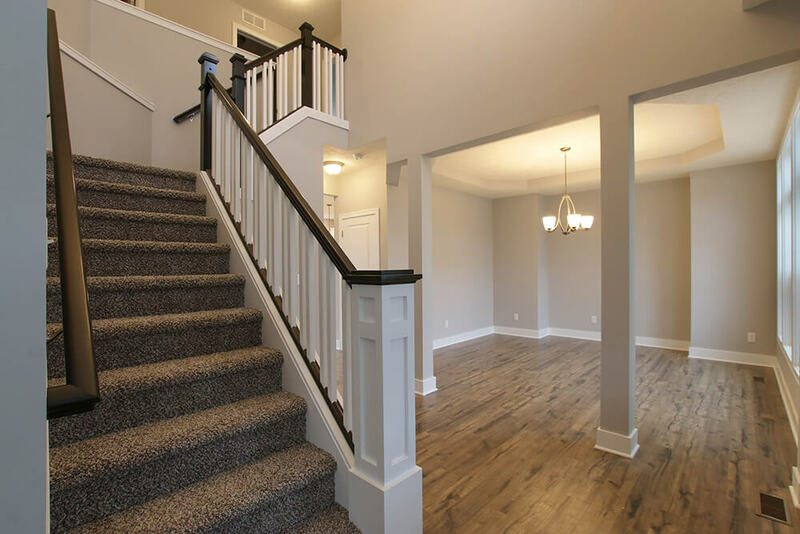 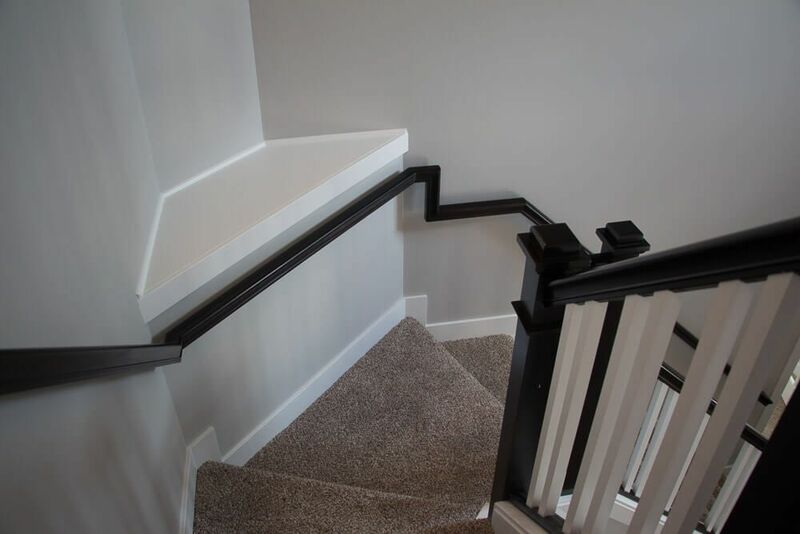 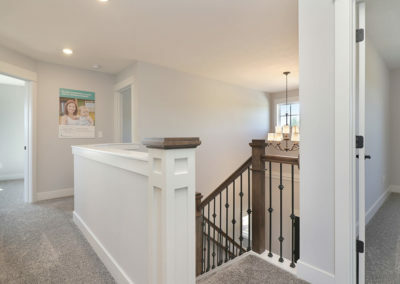 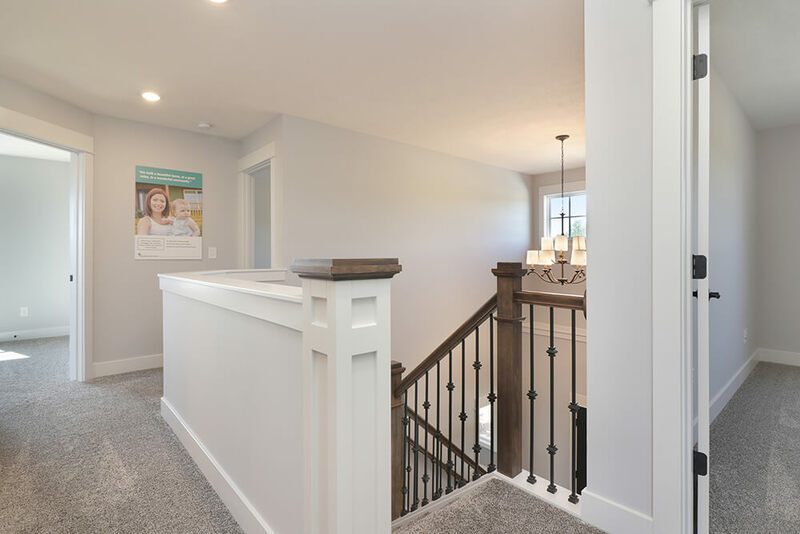 The upper level of the Crestview is accessible via the curved, open staircase in the front foyer. 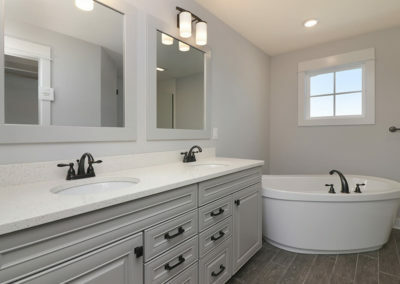 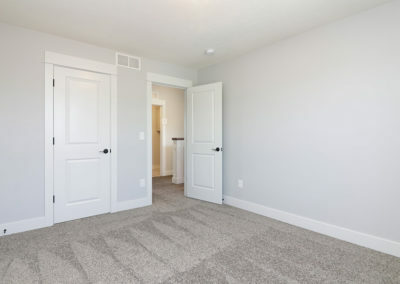 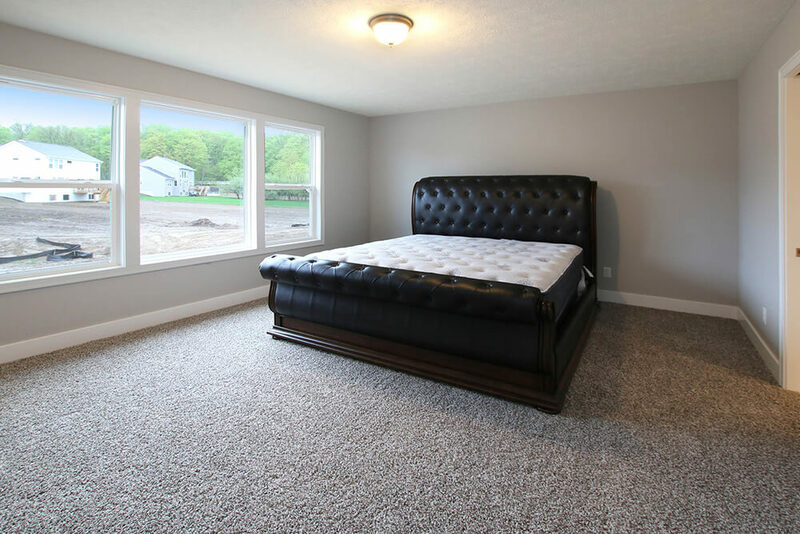 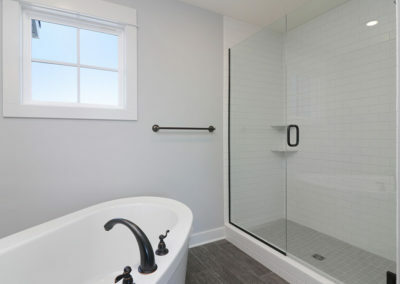 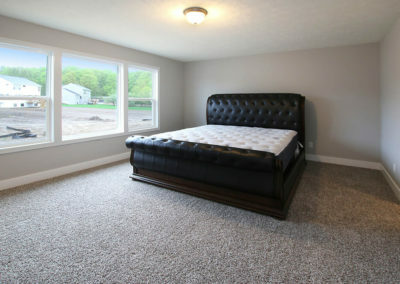 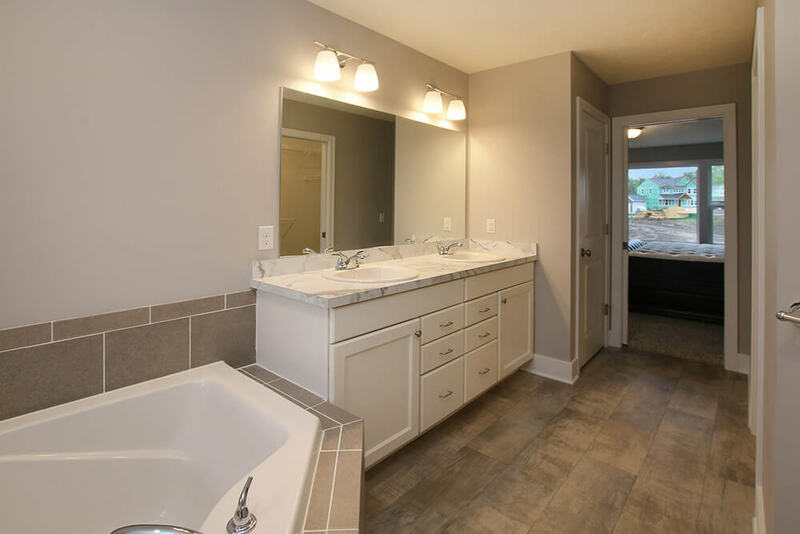 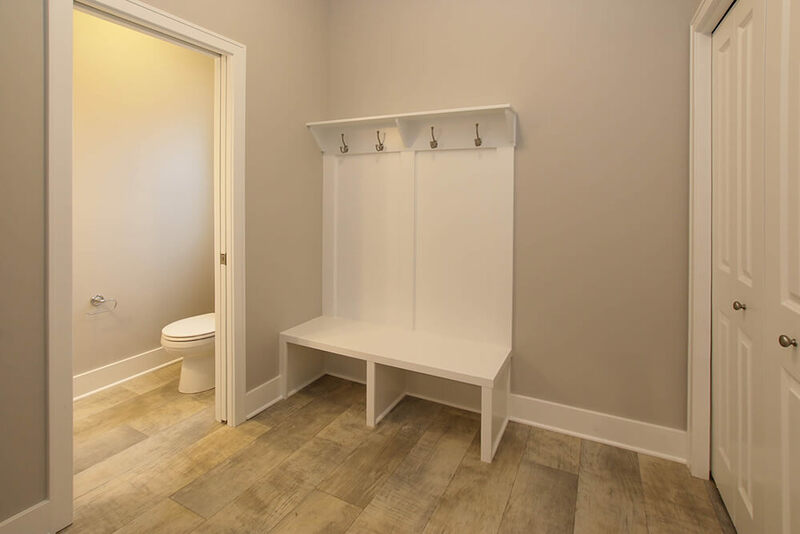 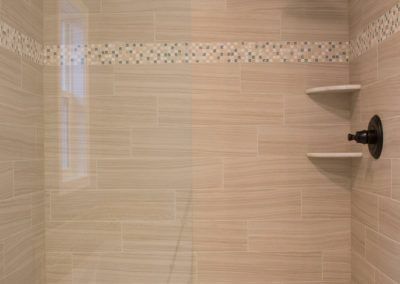 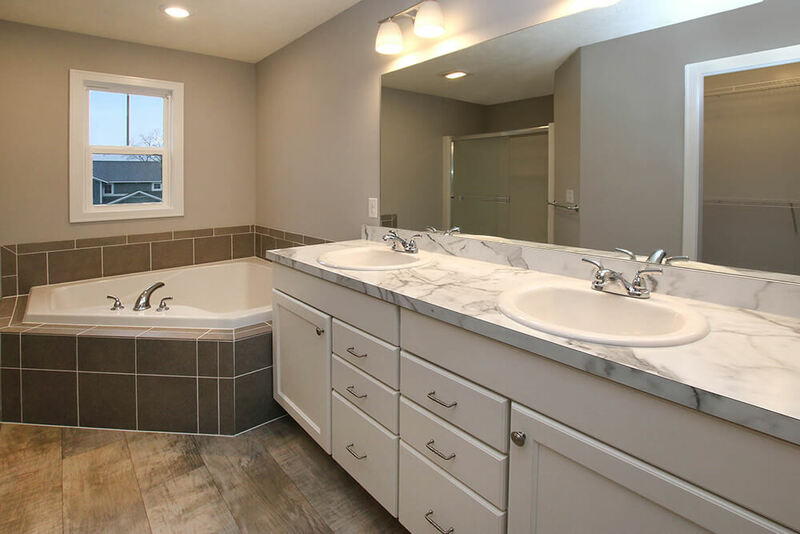 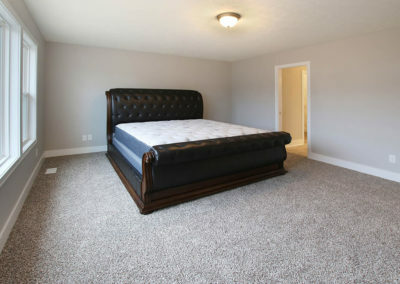 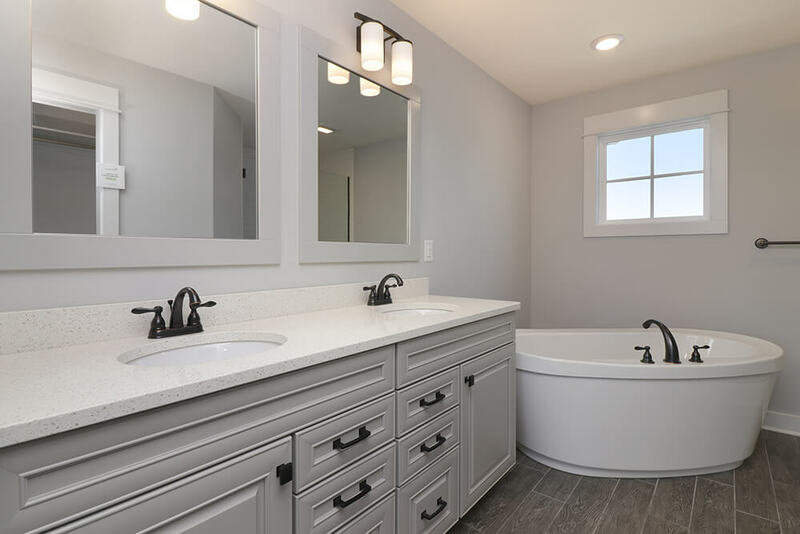 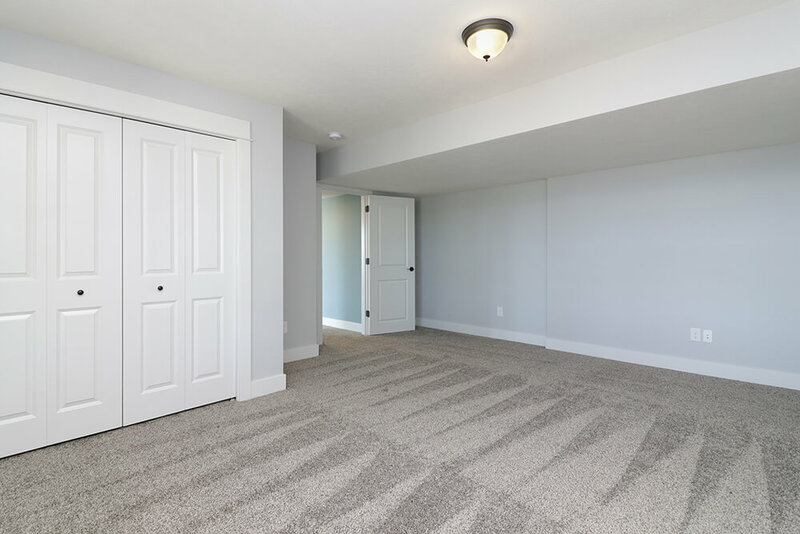 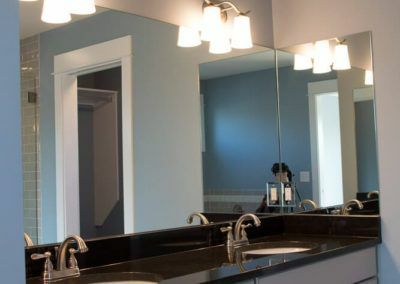 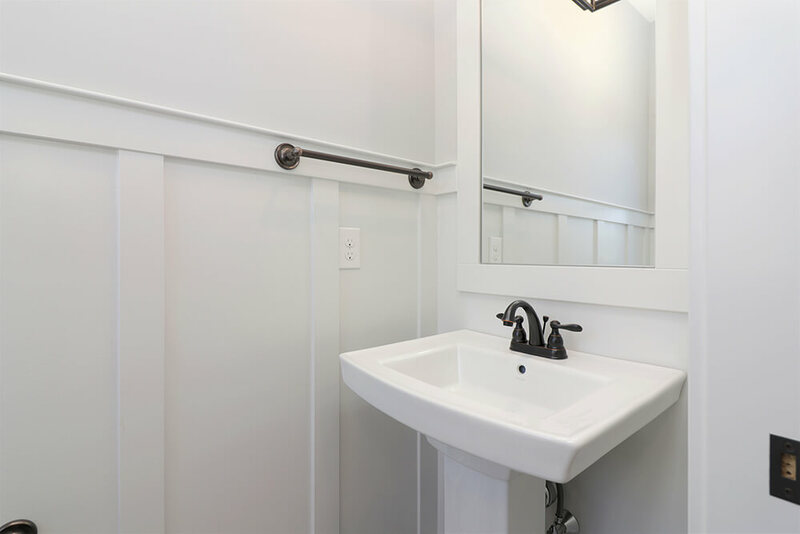 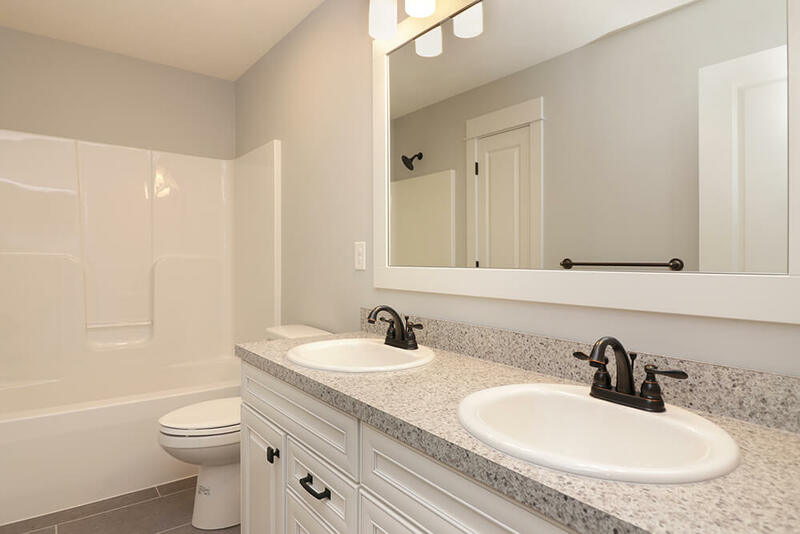 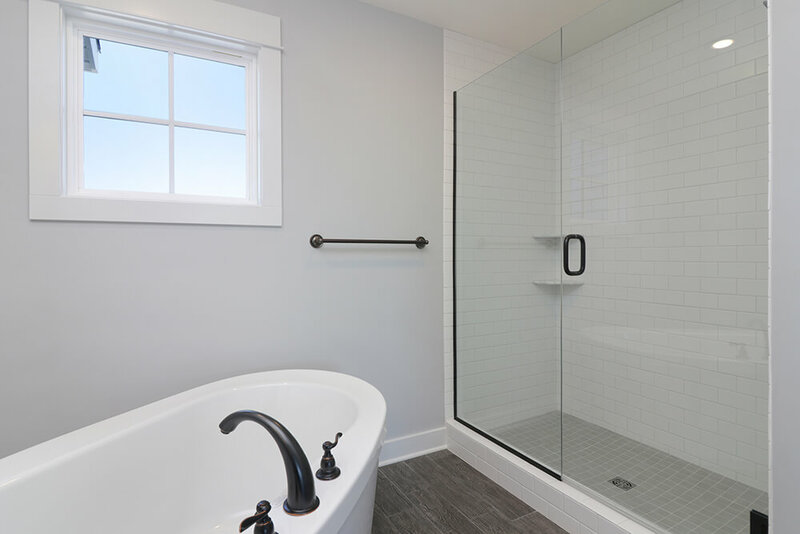 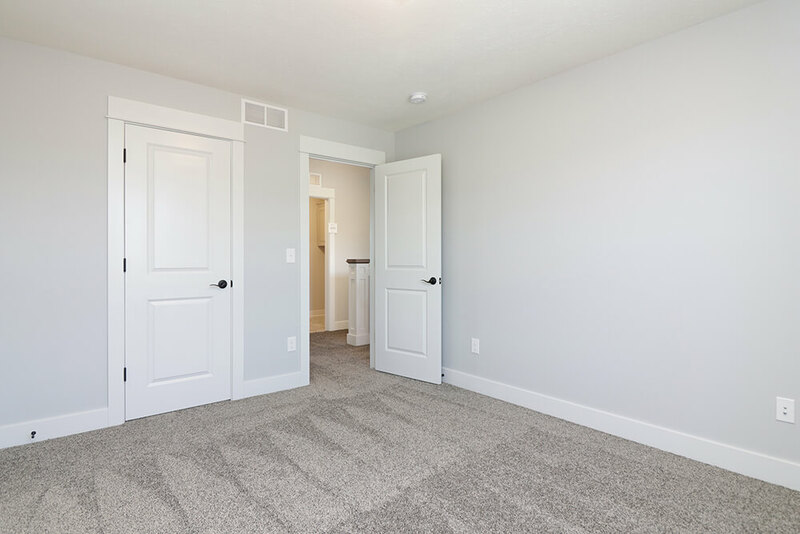 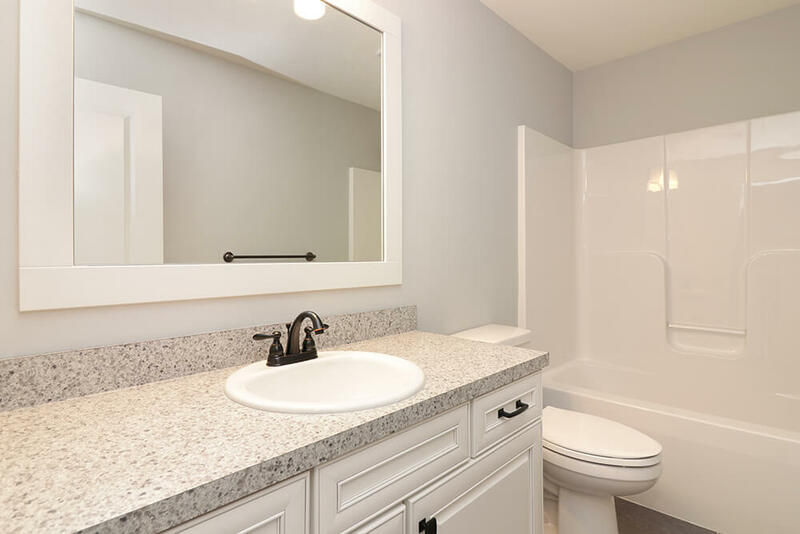 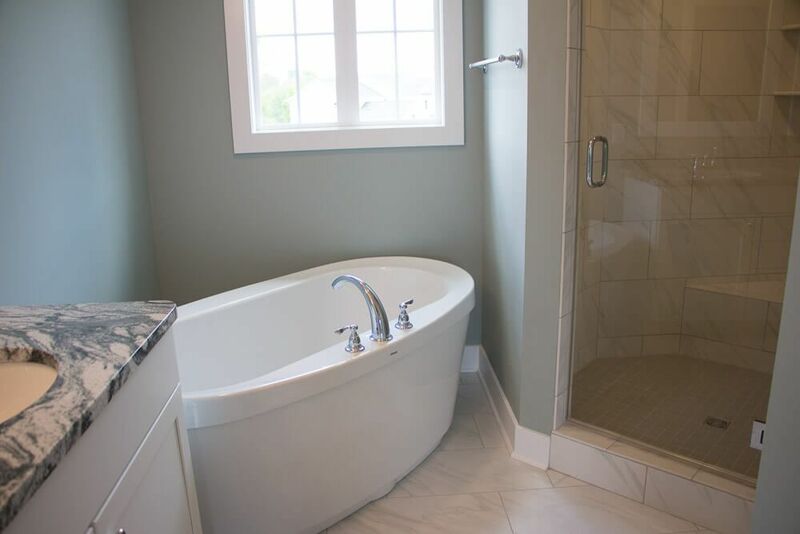 The upper level master suite offers a spacious master bedroom with optional bay window, an included four piece bath with double sink, soaking tub, and step-in shower, and an enormous walk-in closet. 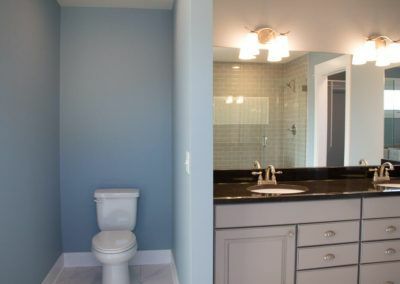 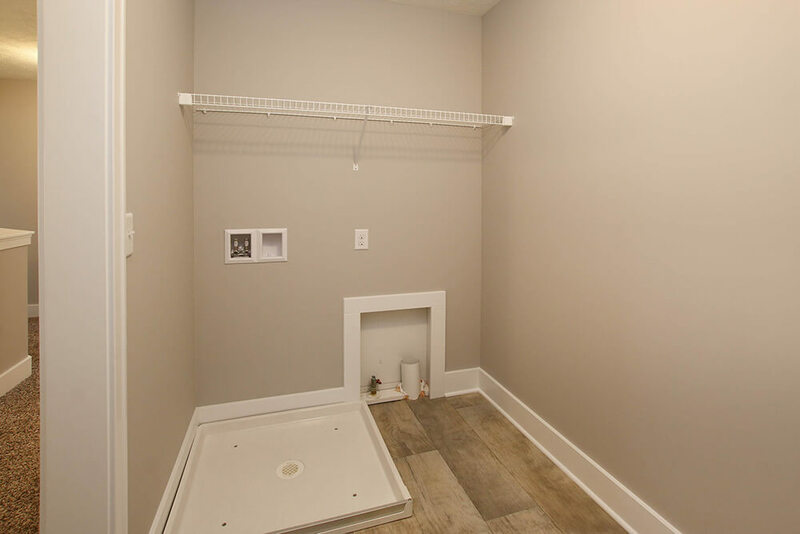 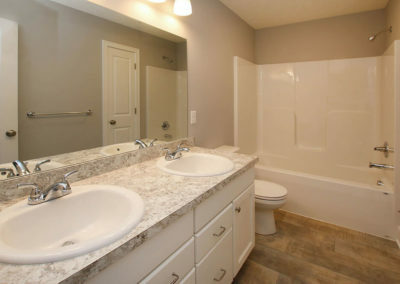 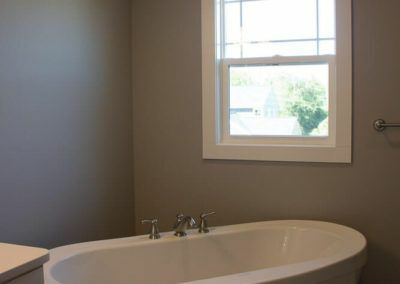 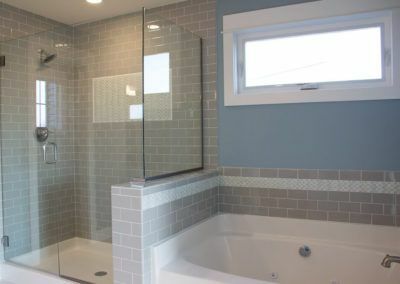 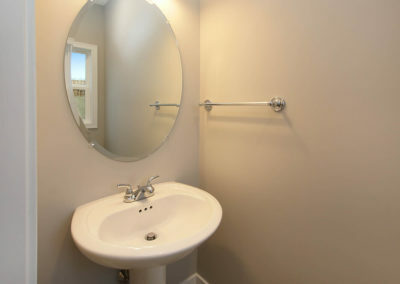 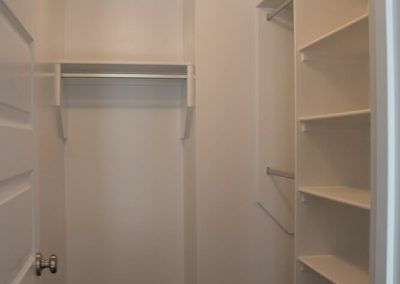 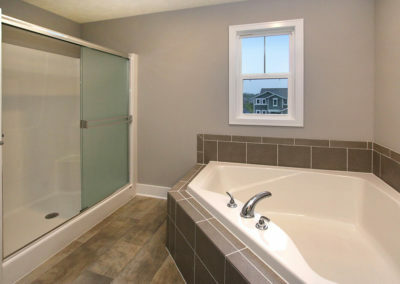 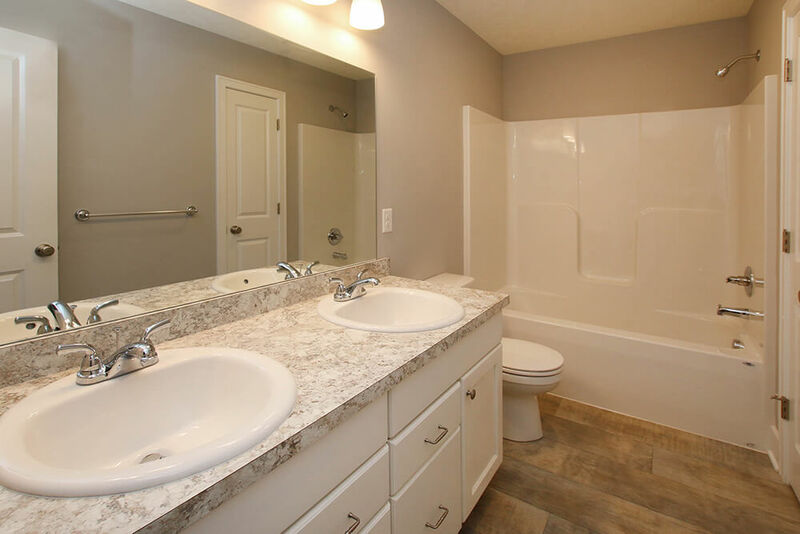 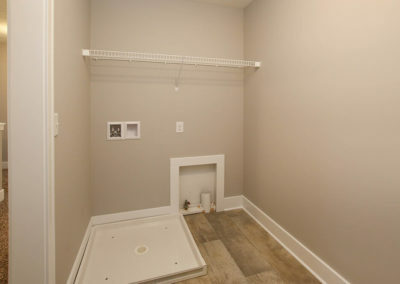 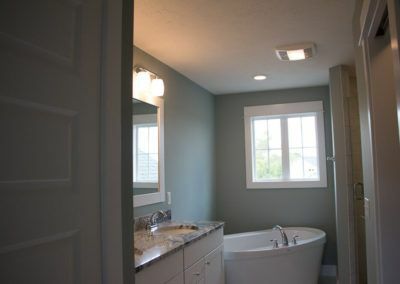 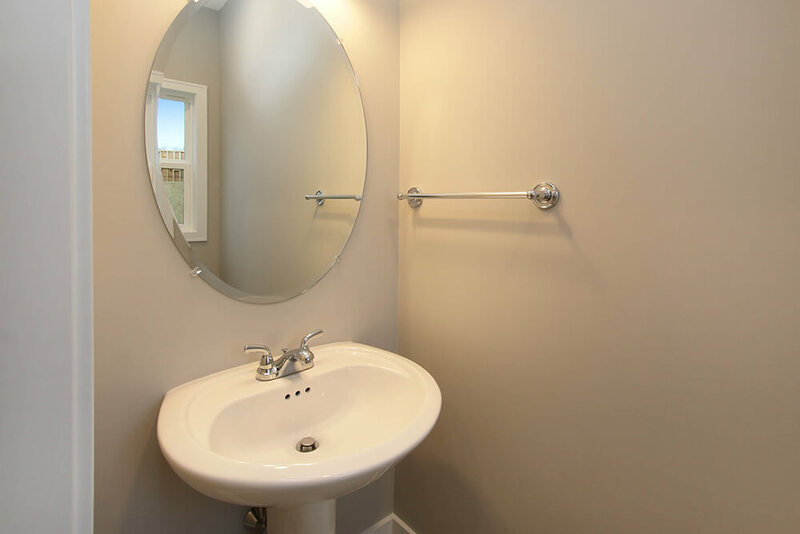 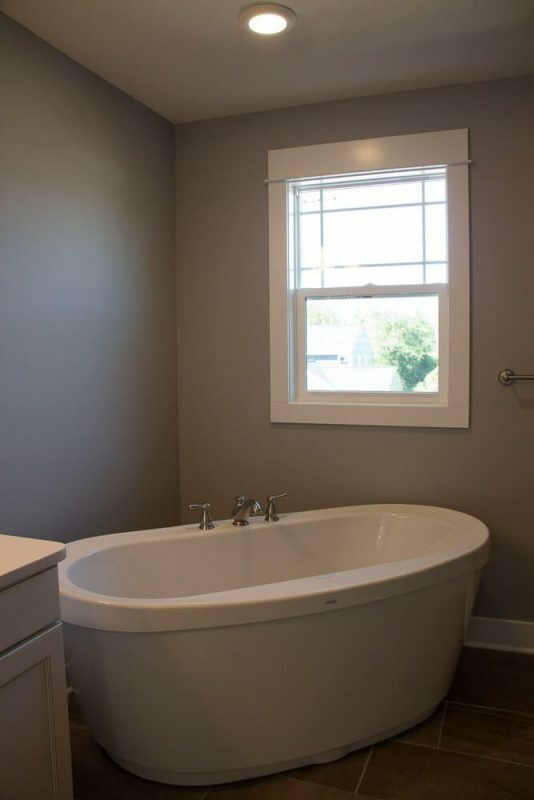 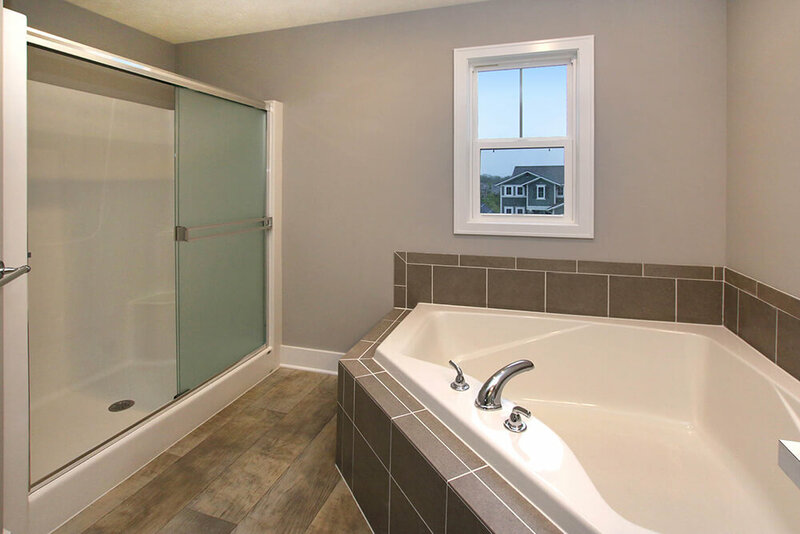 Also on the upper level is another full bath with optional double bowl sink, and three more bedrooms with their own closet space. 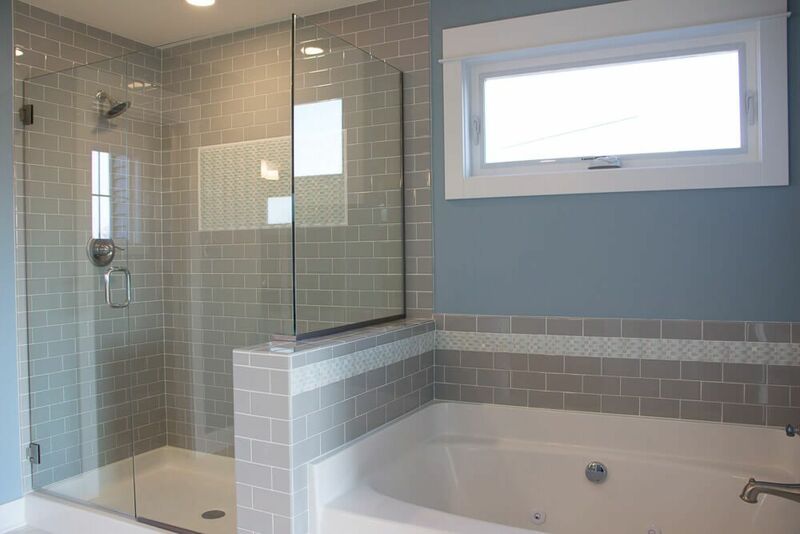 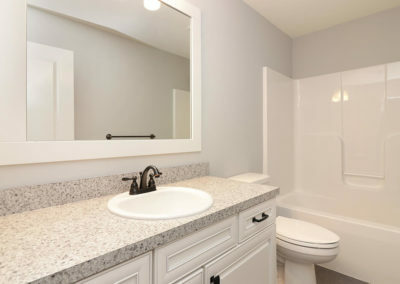 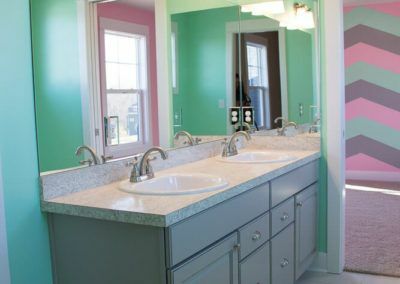 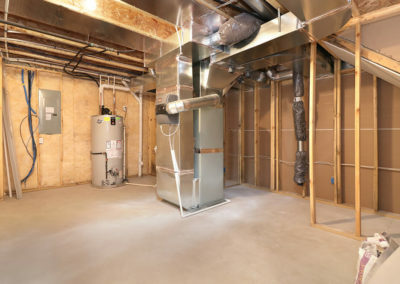 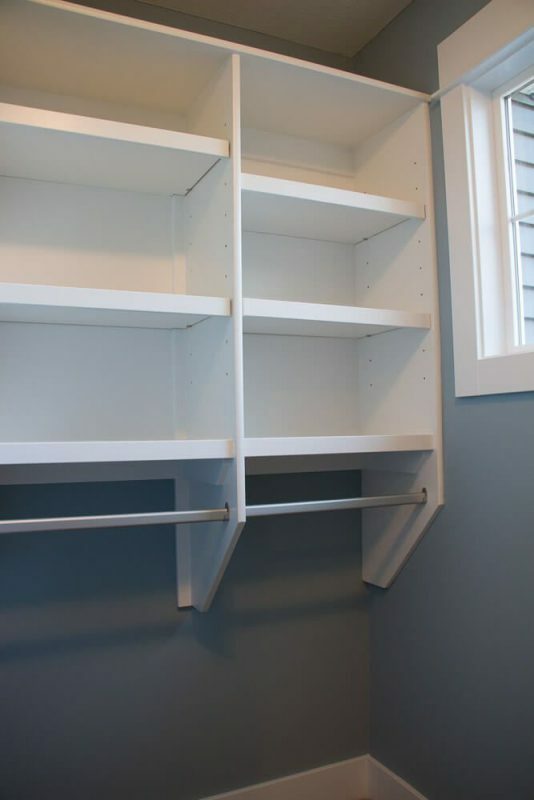 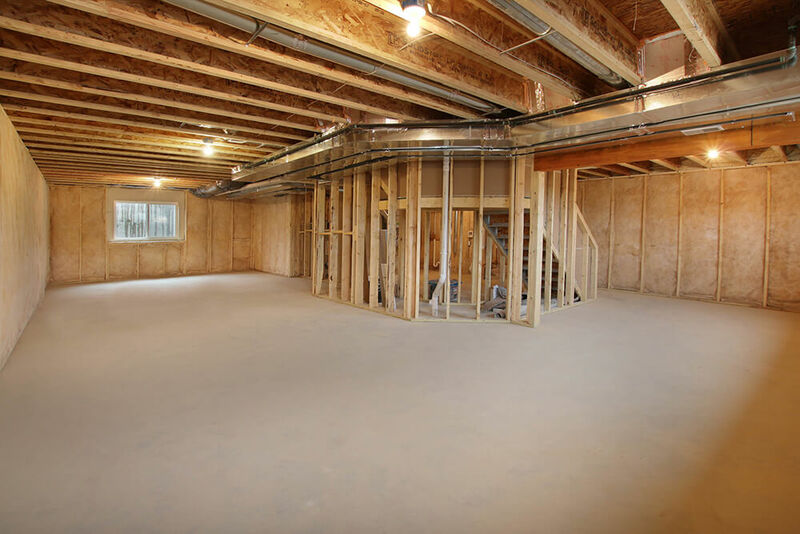 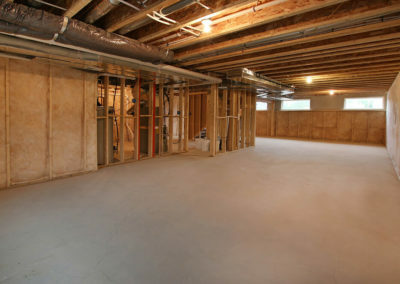 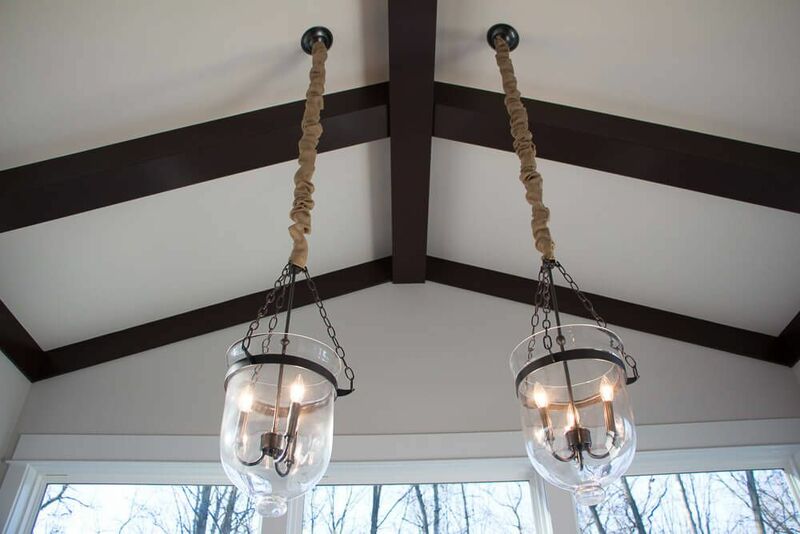 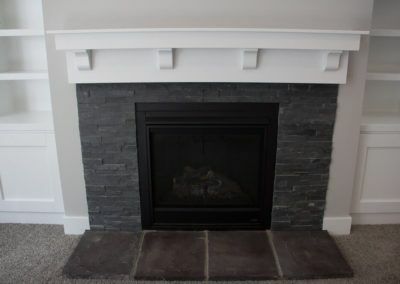 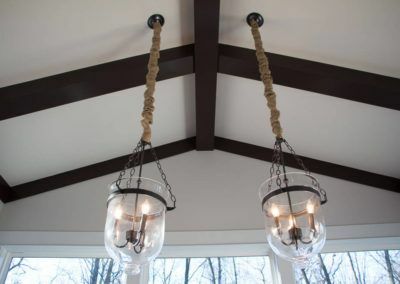 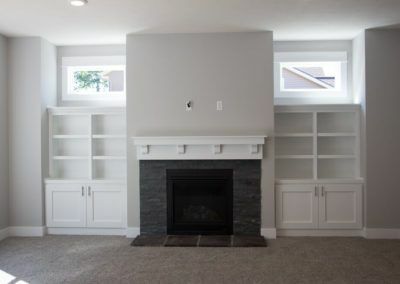 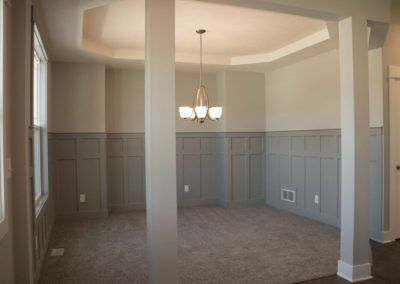 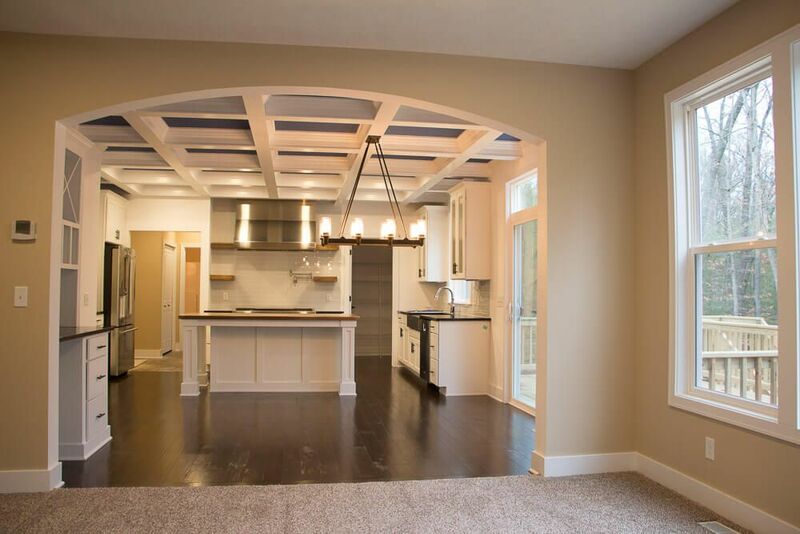 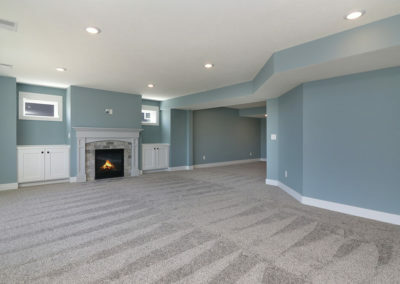 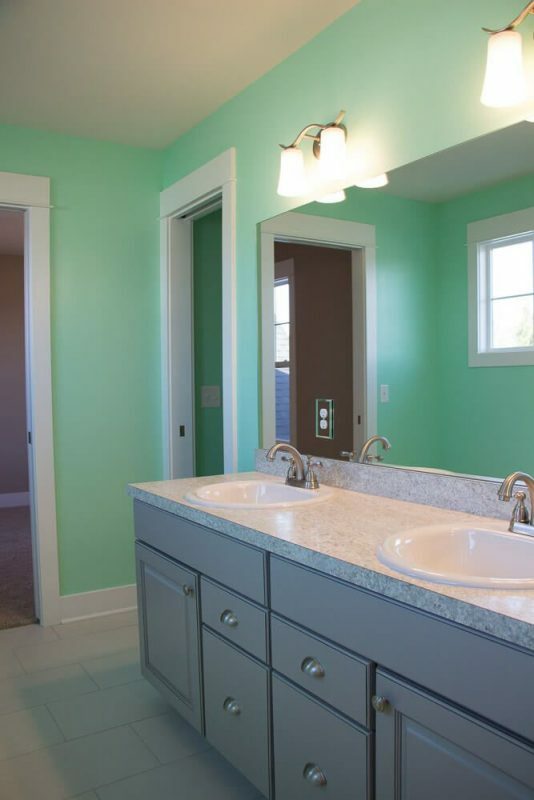 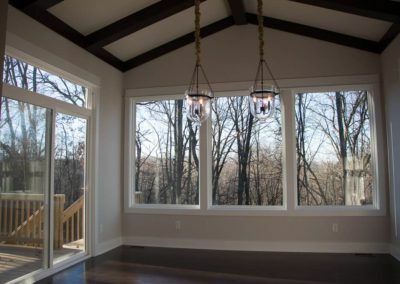 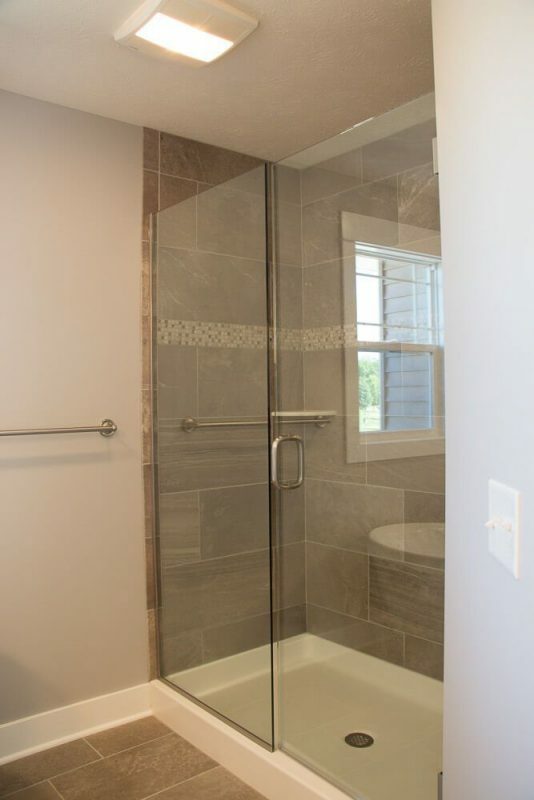 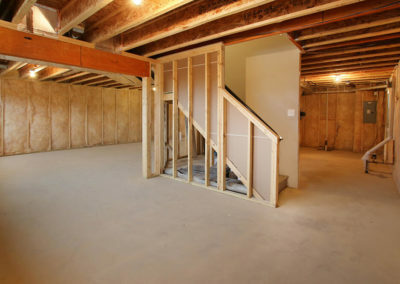 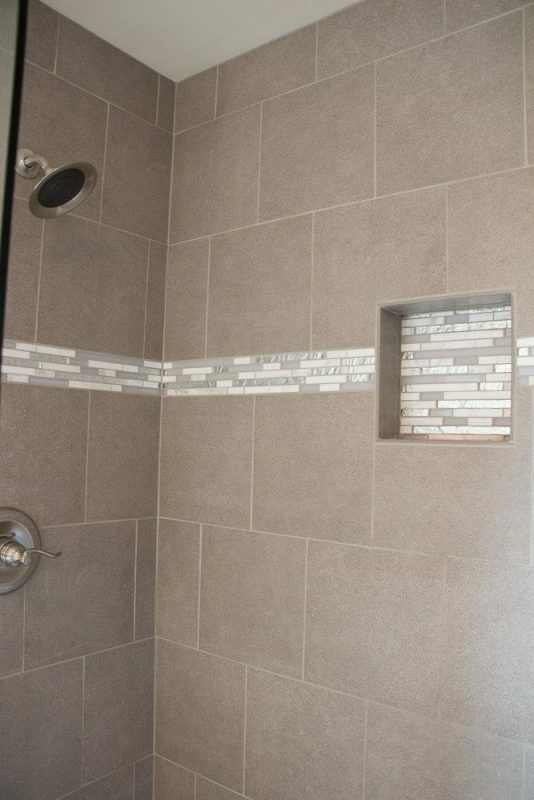 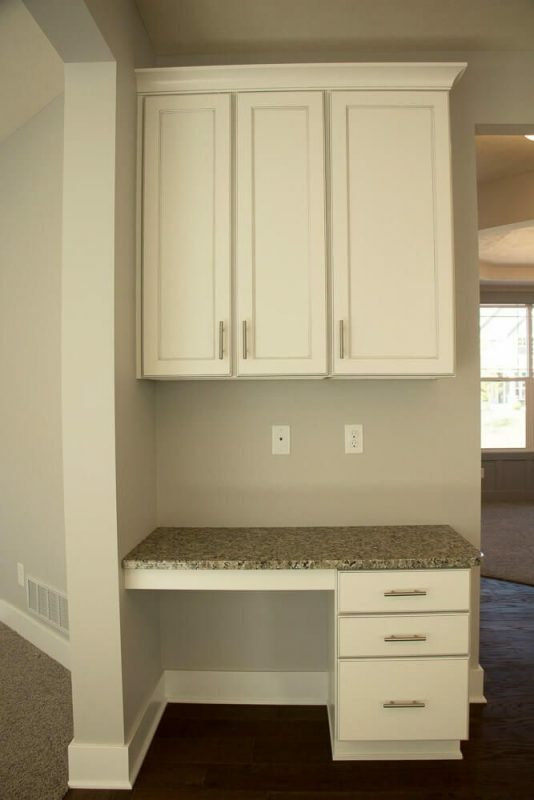 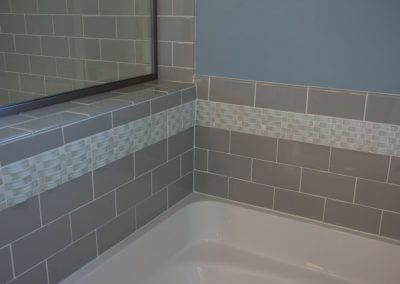 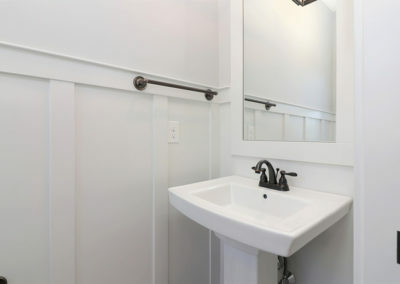 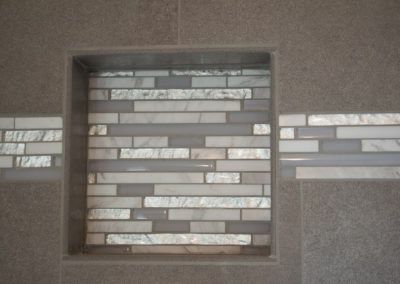 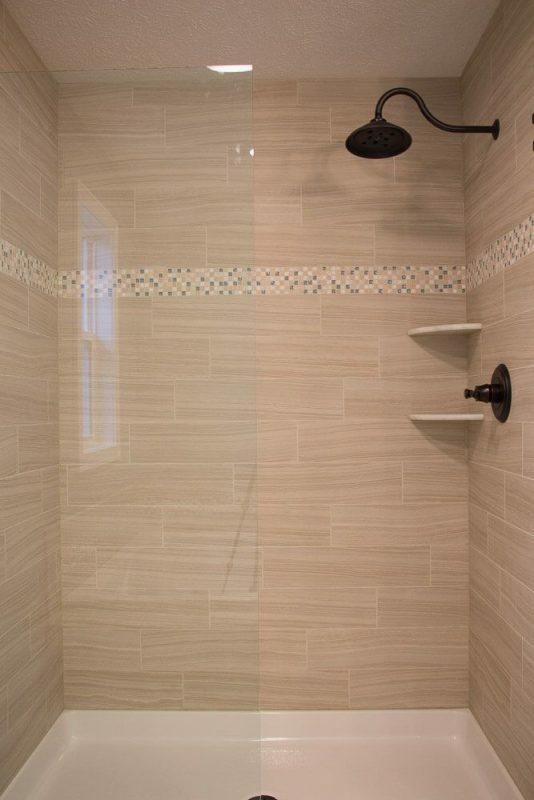 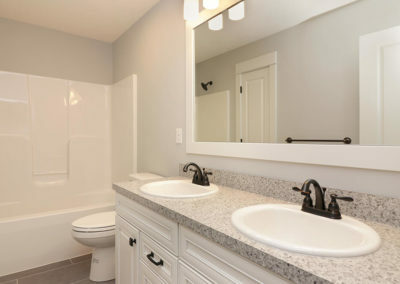 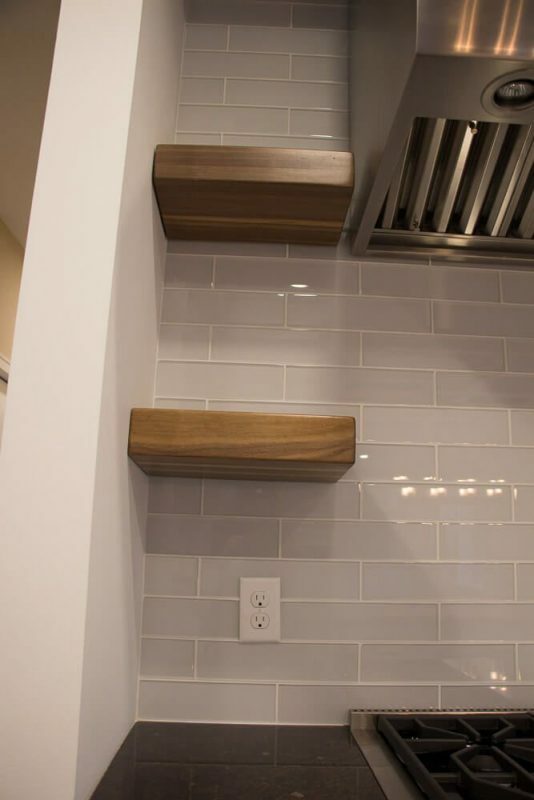 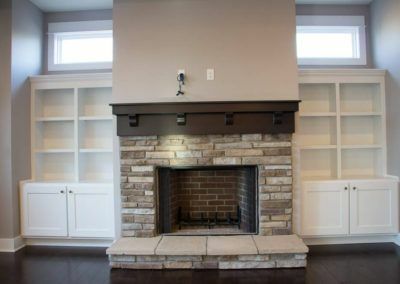 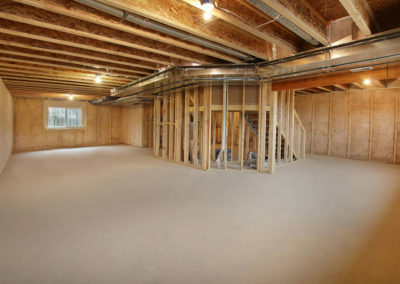 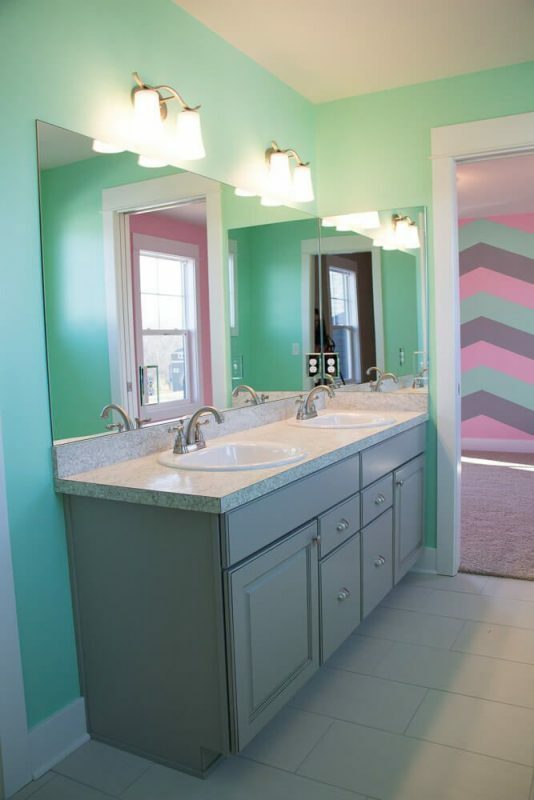 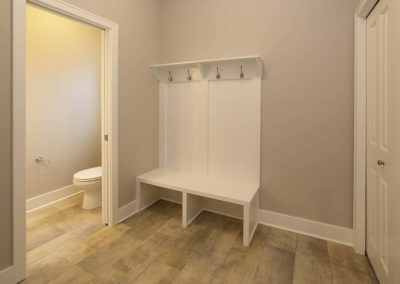 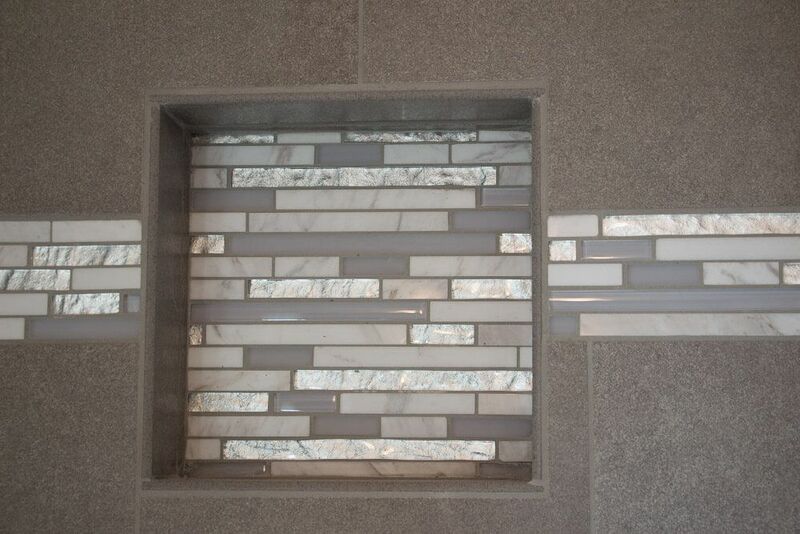 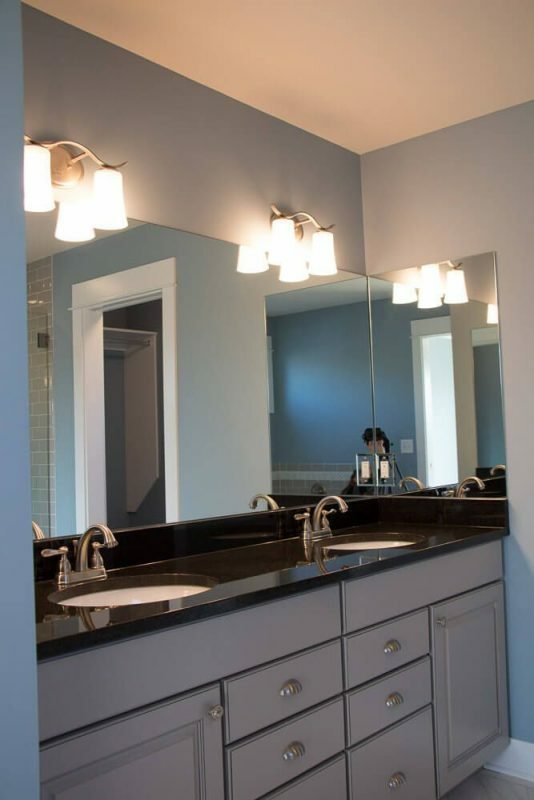 The home plan also includes a lower level which can be finished or unfinished to match your needs. 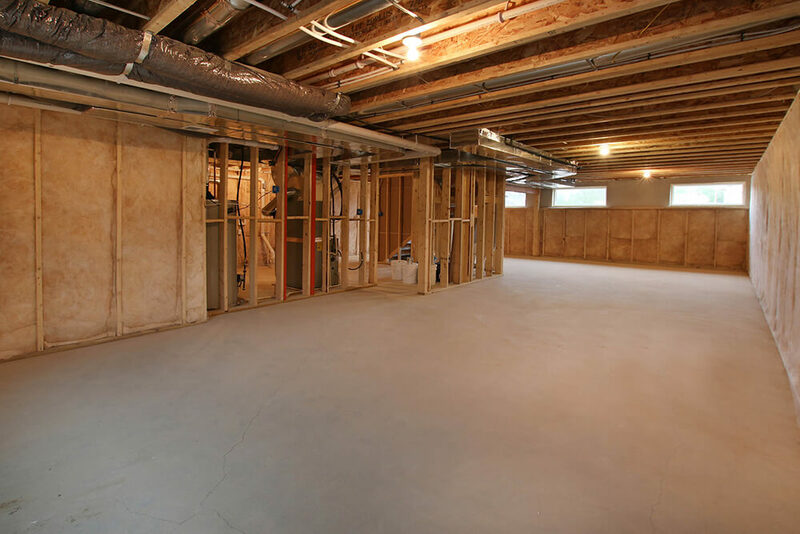 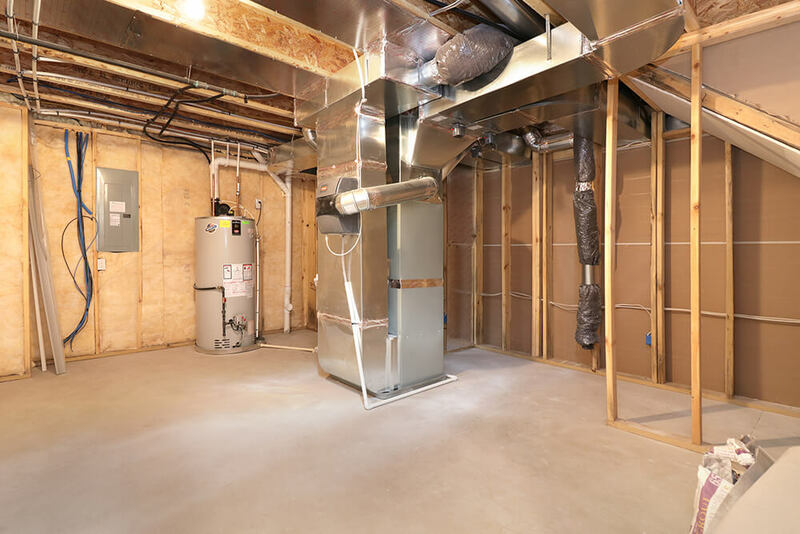 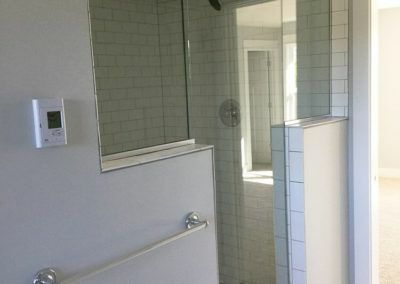 If you choose to finish the lower level , it can be built out to include more living space, a bathroom, and bedroom if your home site permits. 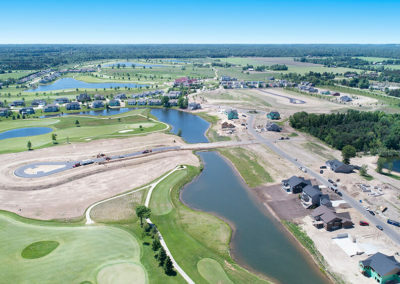 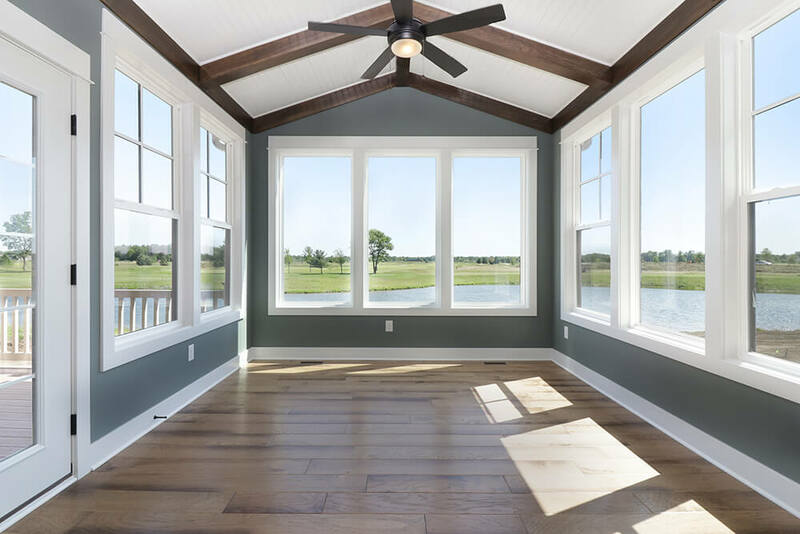 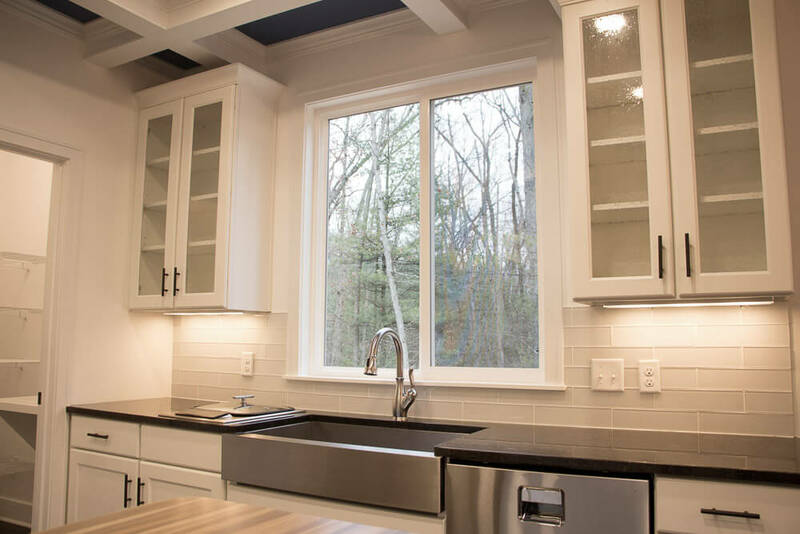 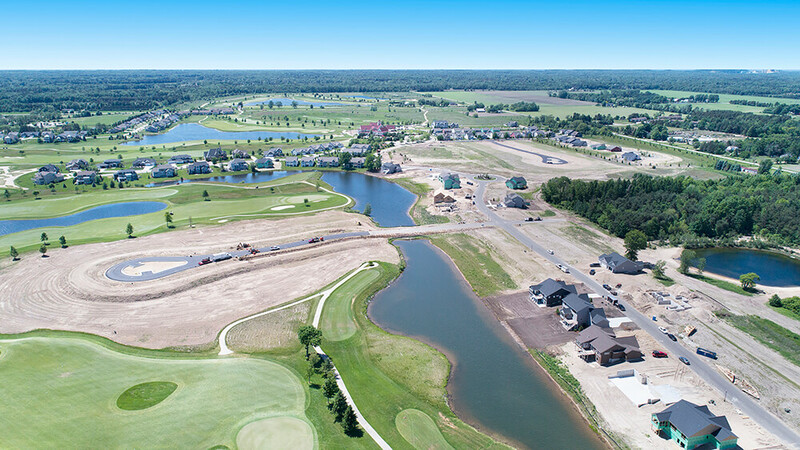 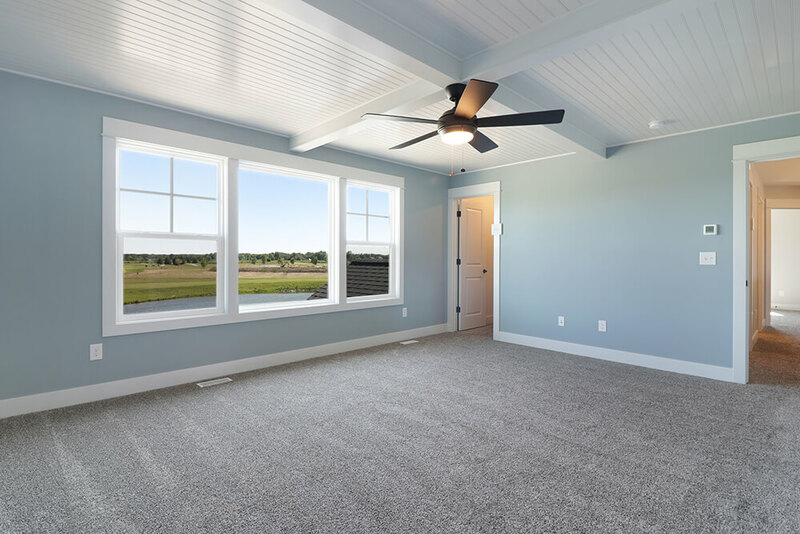 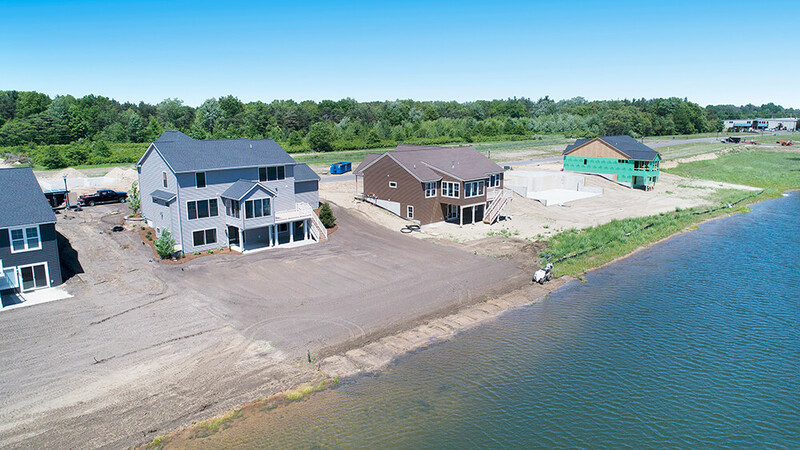 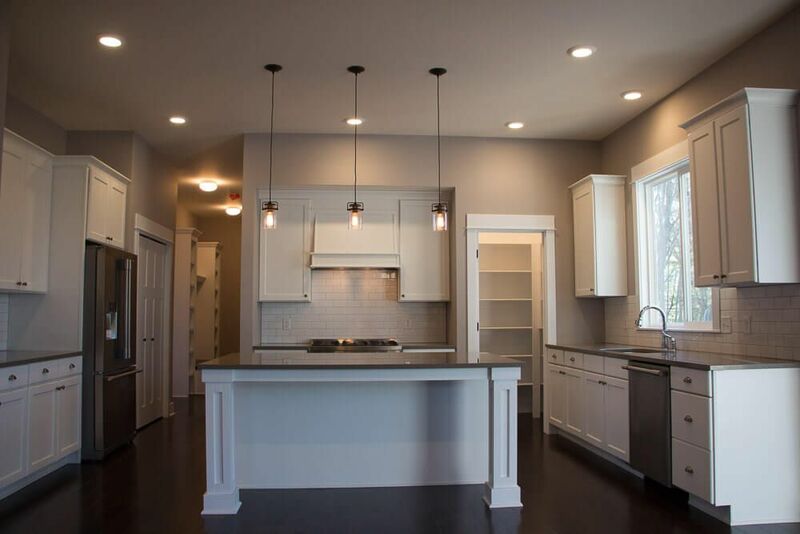 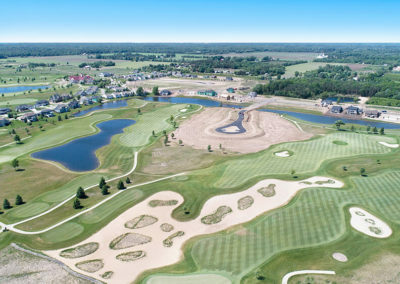 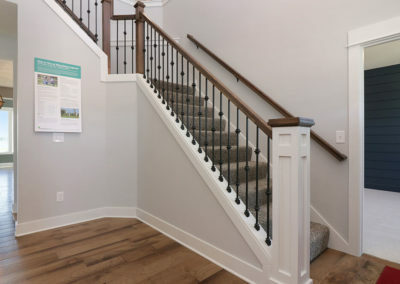 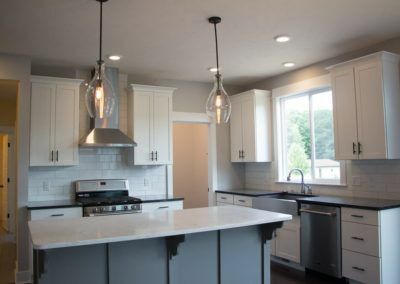 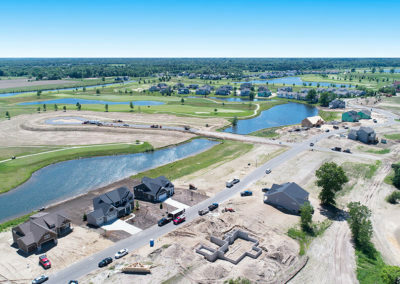 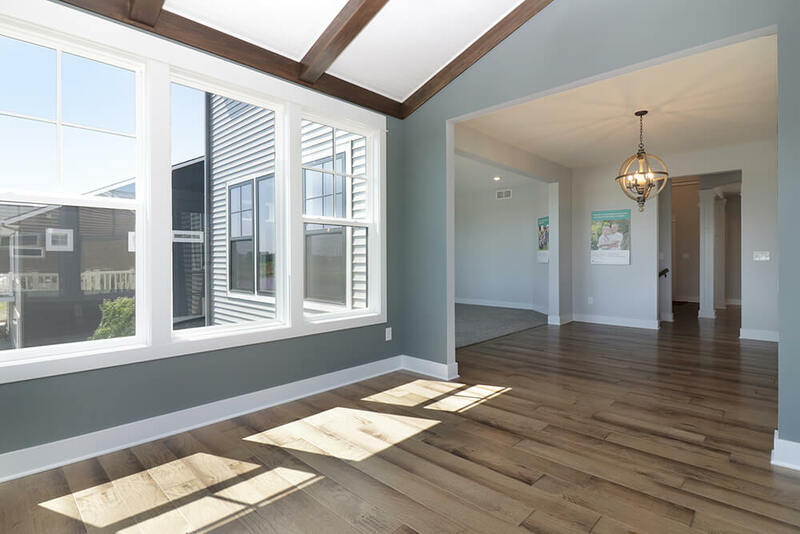 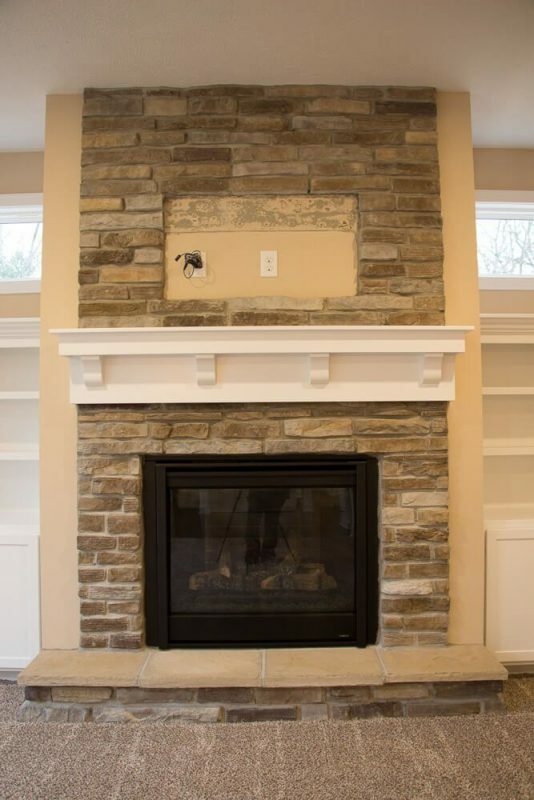 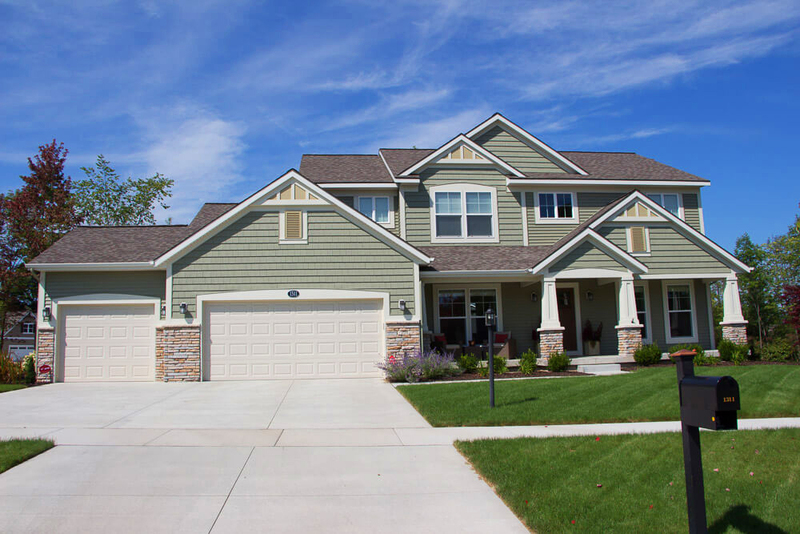 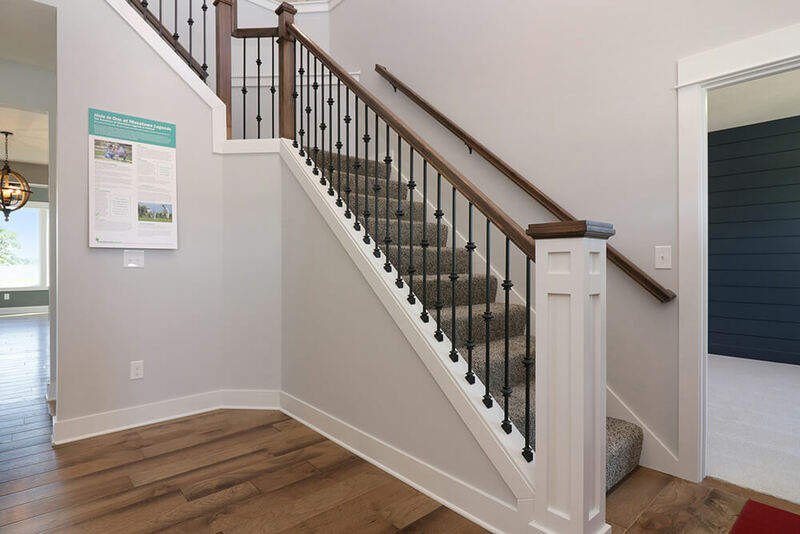 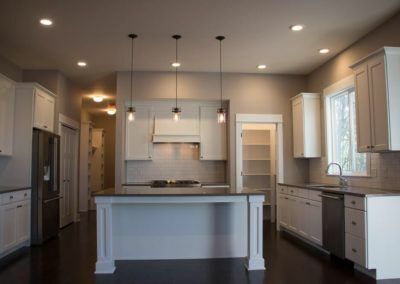 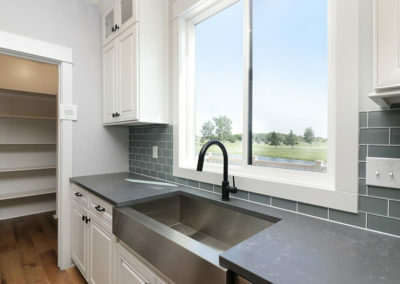 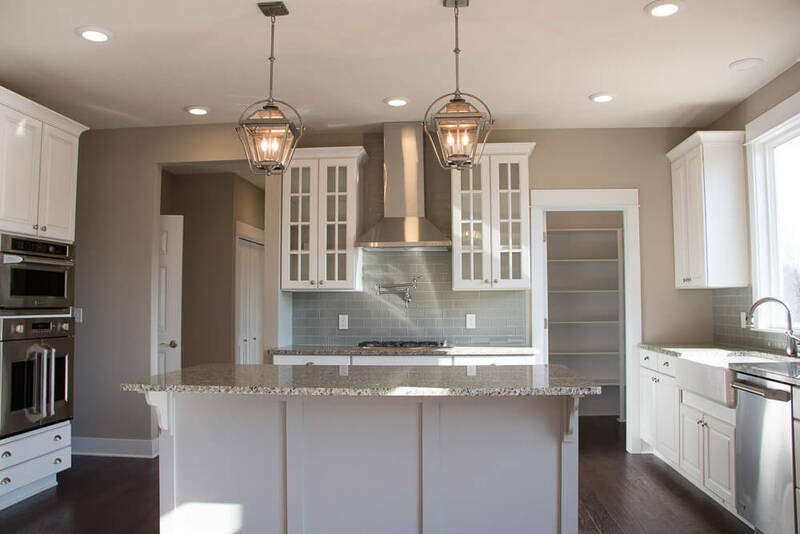 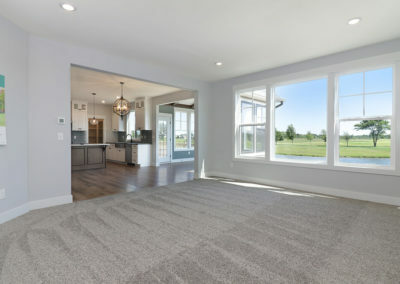 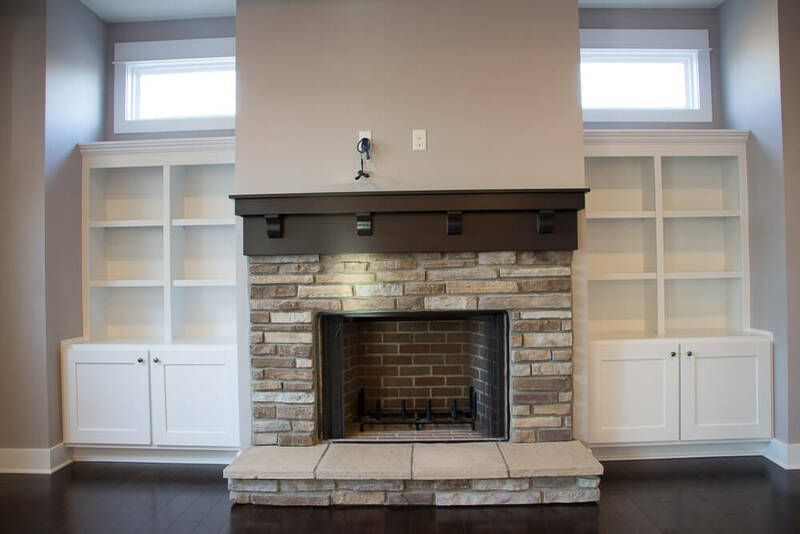 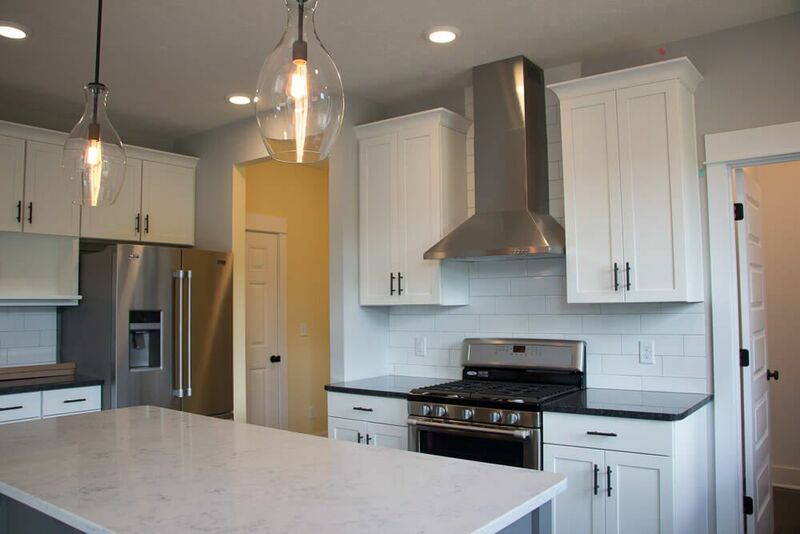 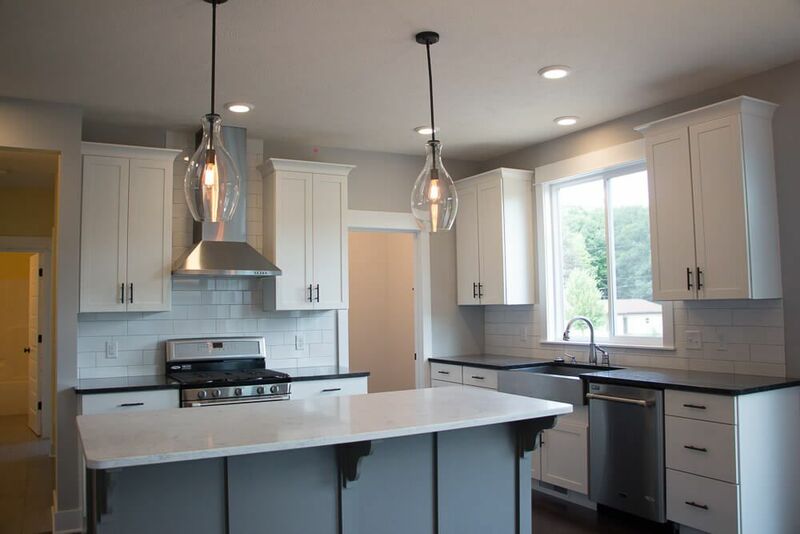 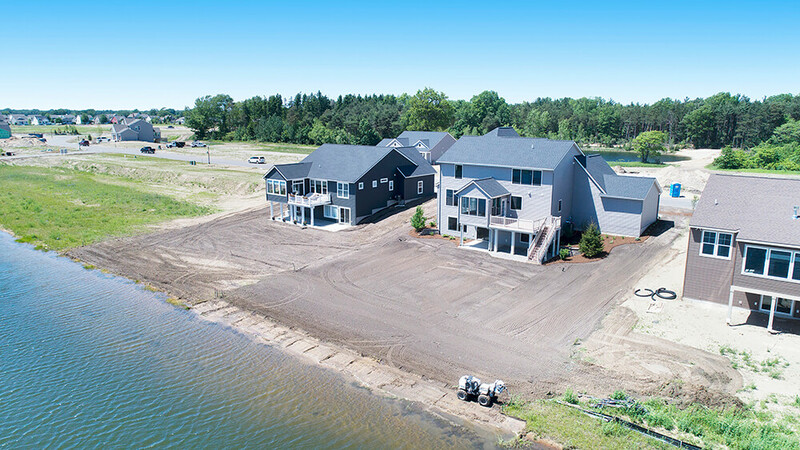 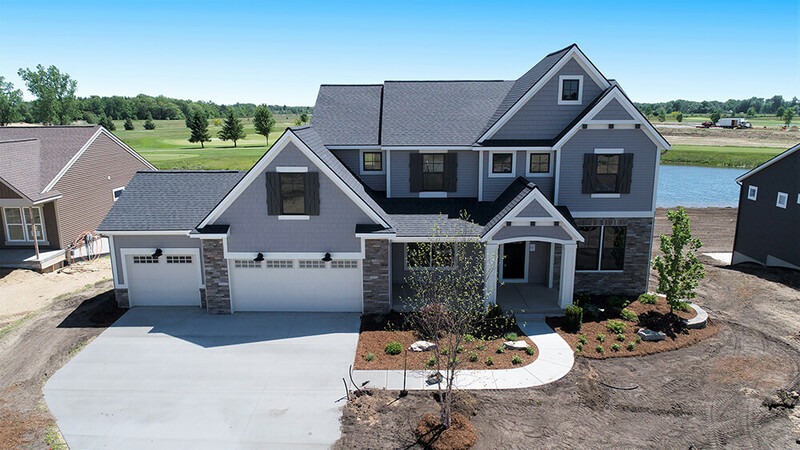 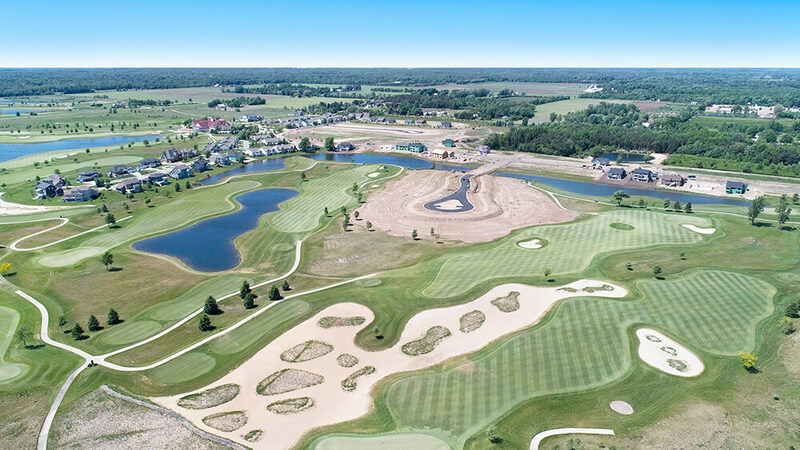 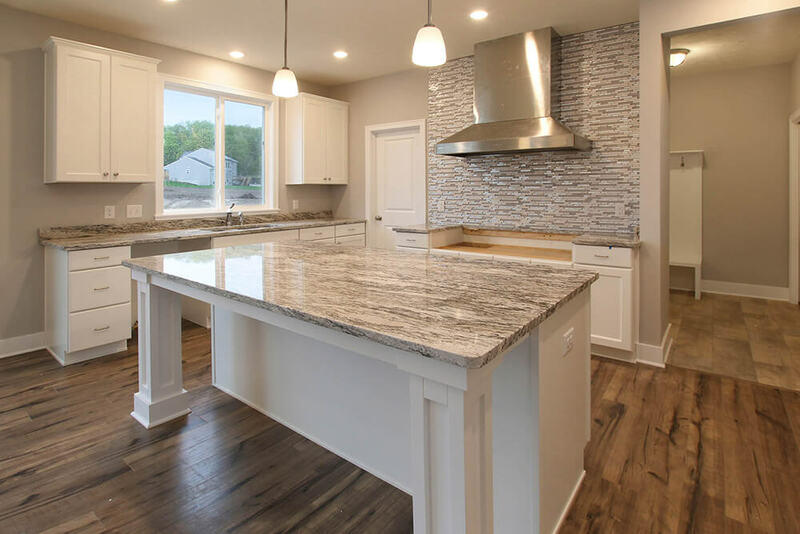 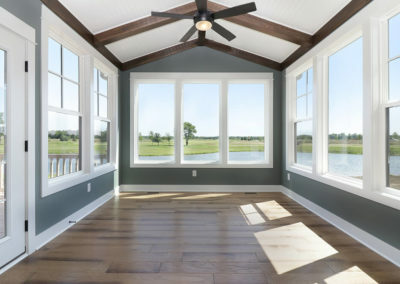 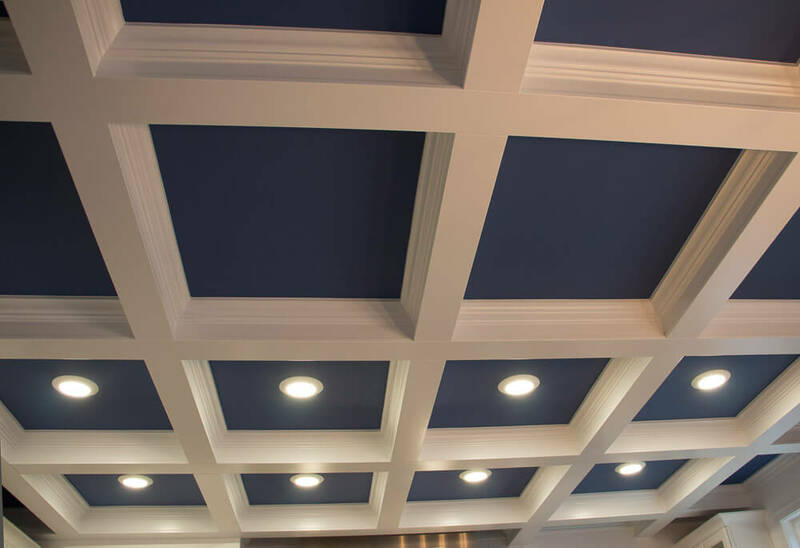 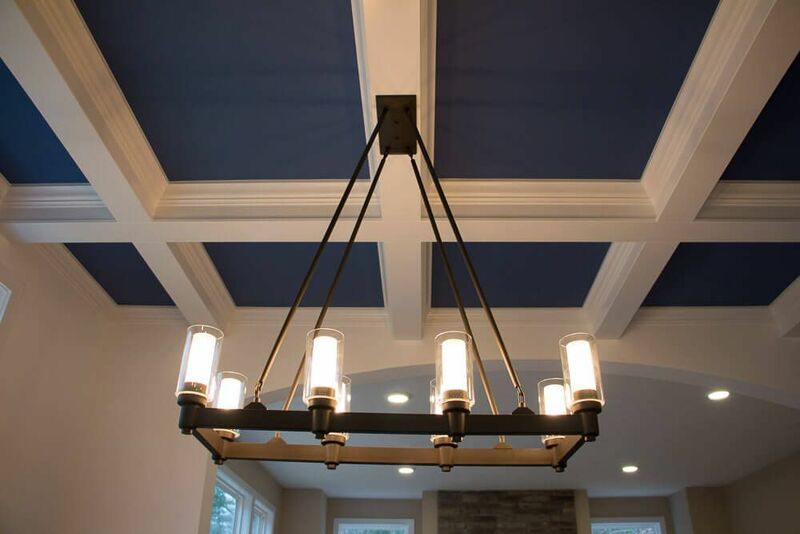 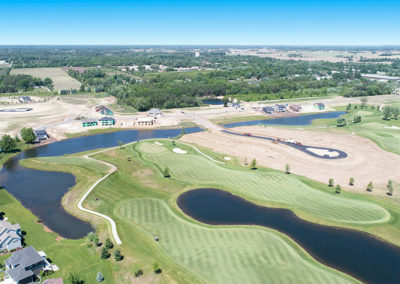 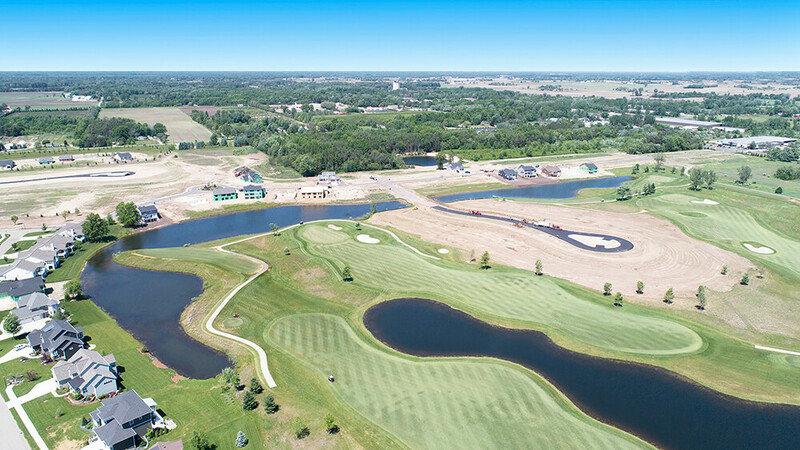 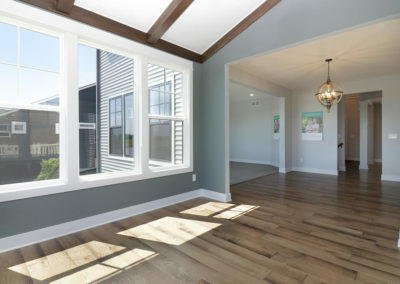 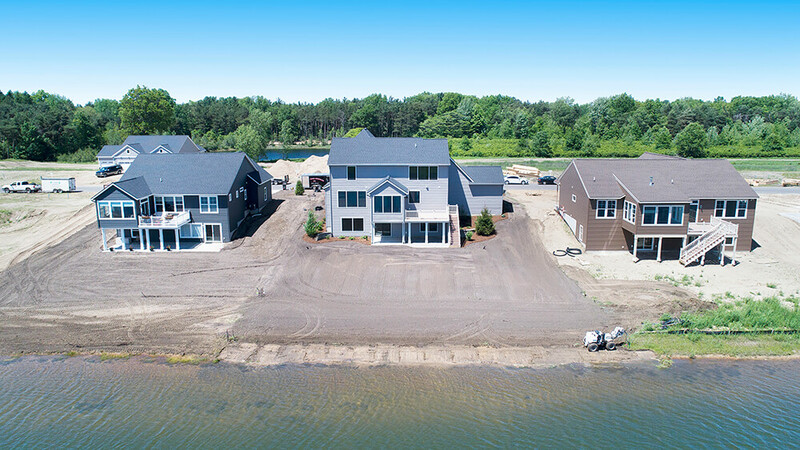 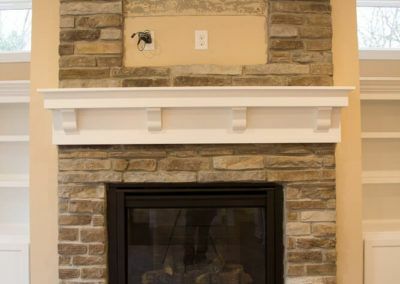 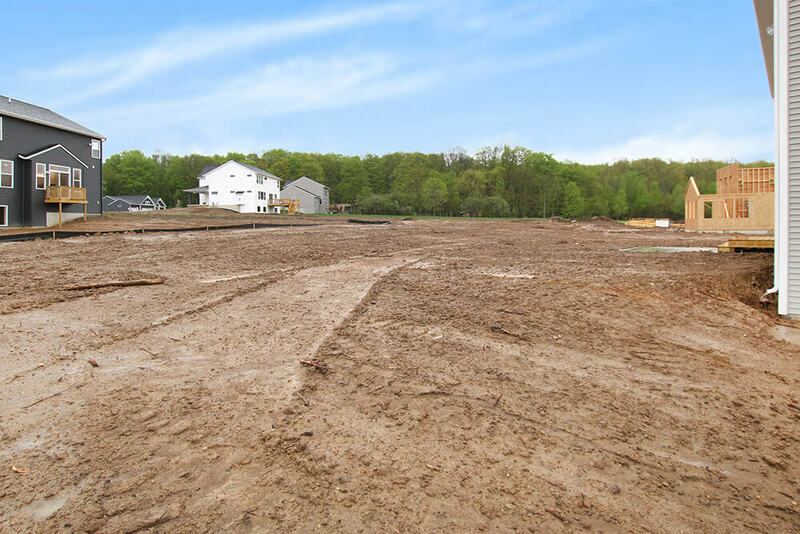 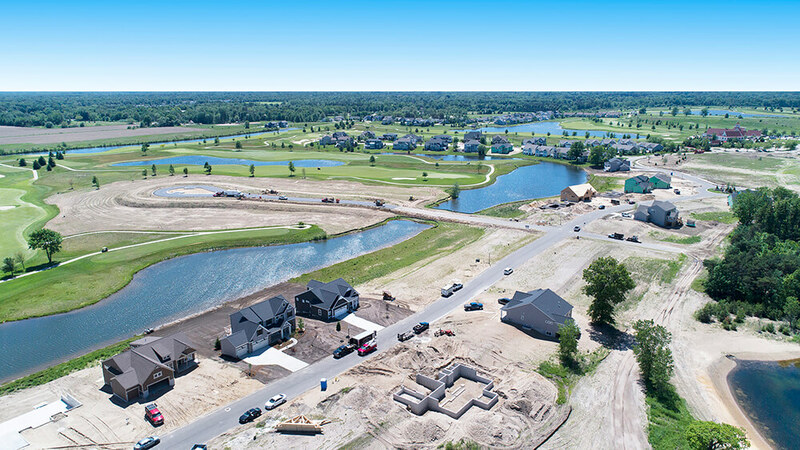 Eastbrook works hard to design home plans that offer not only curb appeal and comfort, but real value and energy efficiency as well. 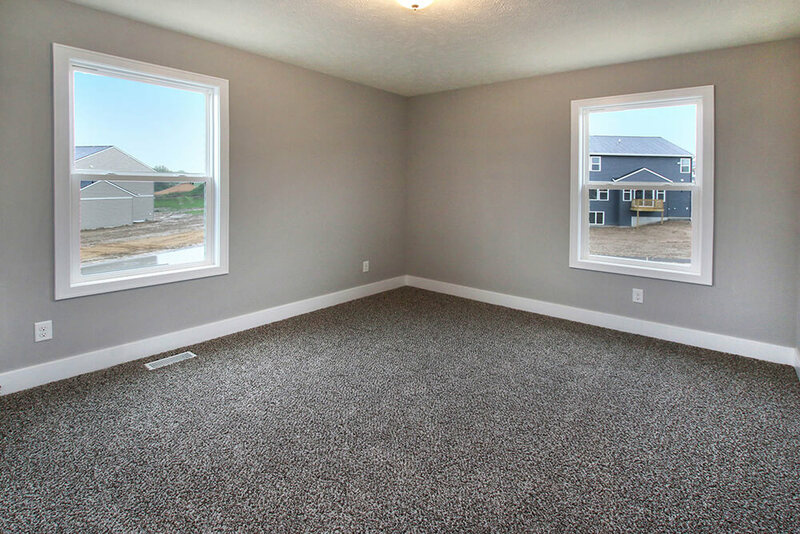 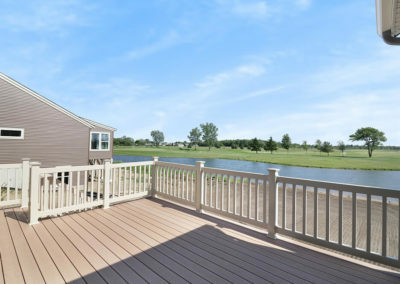 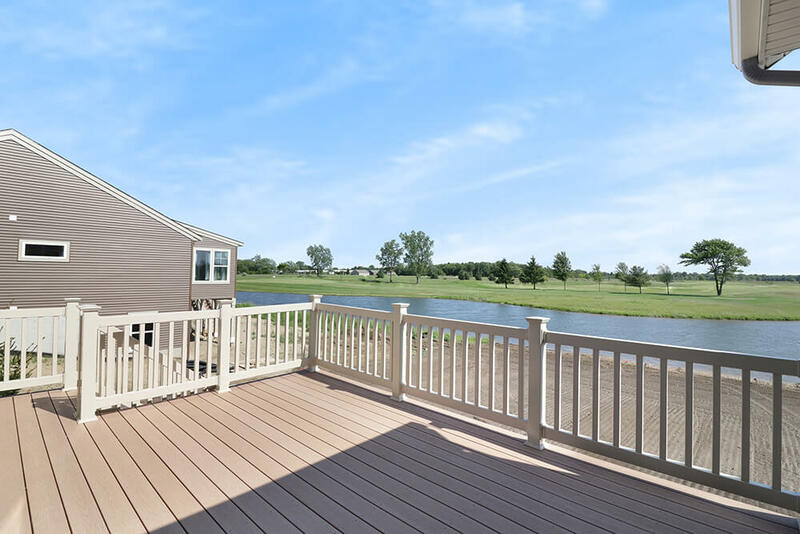 Loaded with included features and fantastic options, you are sure to be happy with your Crestview home.